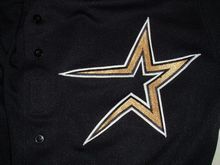 Star moves to the left on the road jersey script. 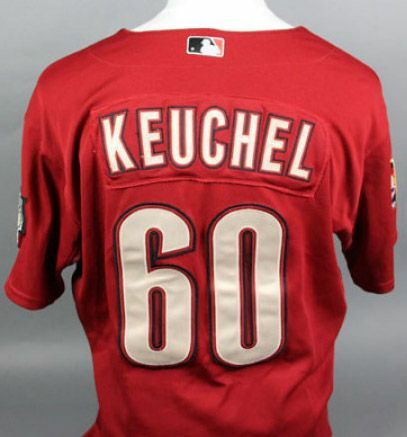 Alternate jersey script replaced by the star. 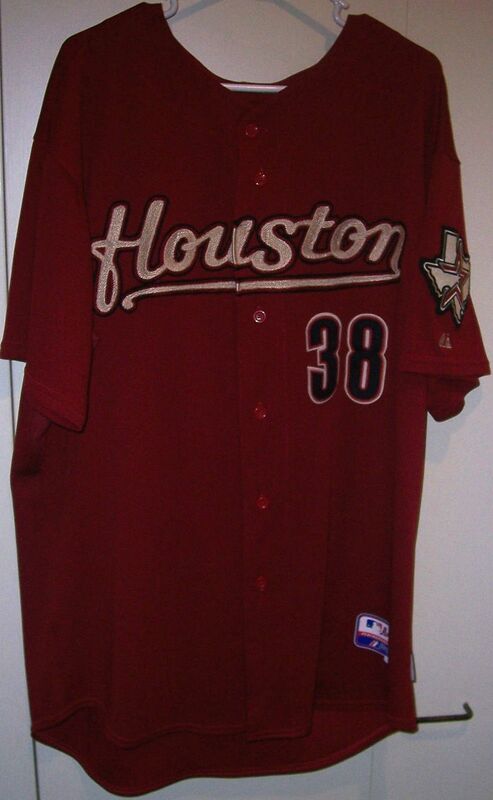 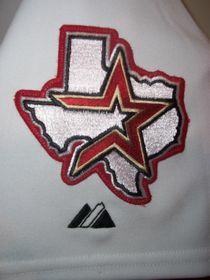 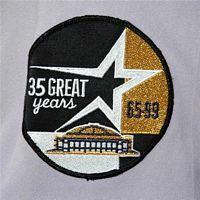 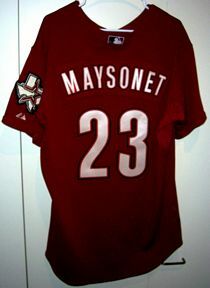 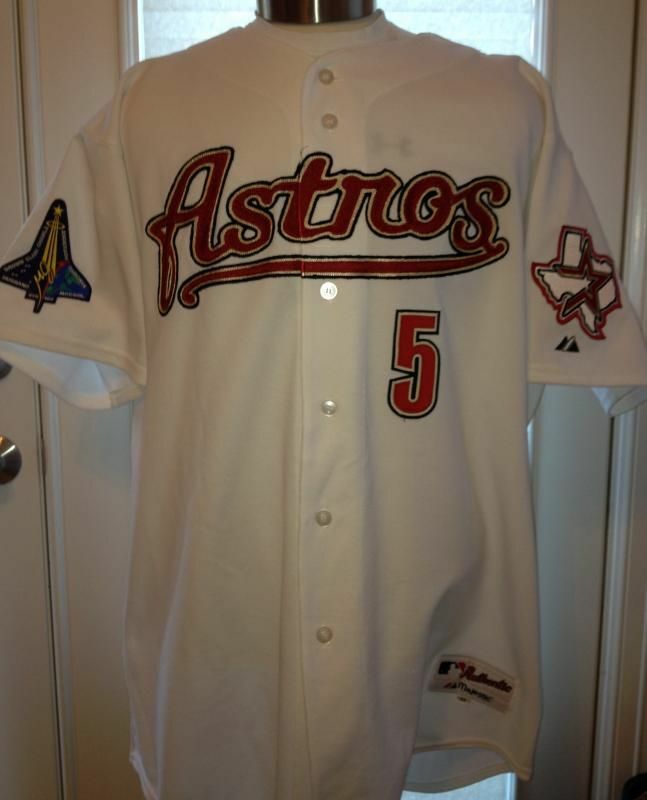 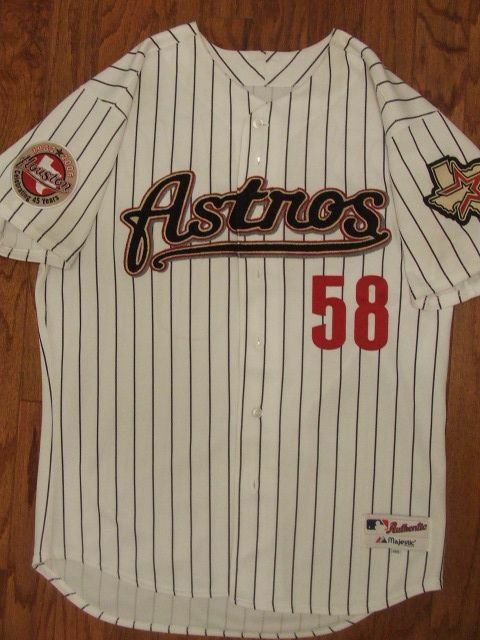 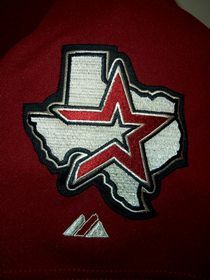 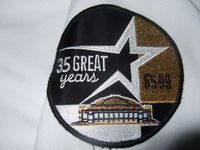 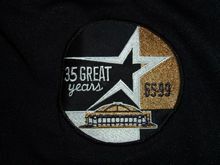 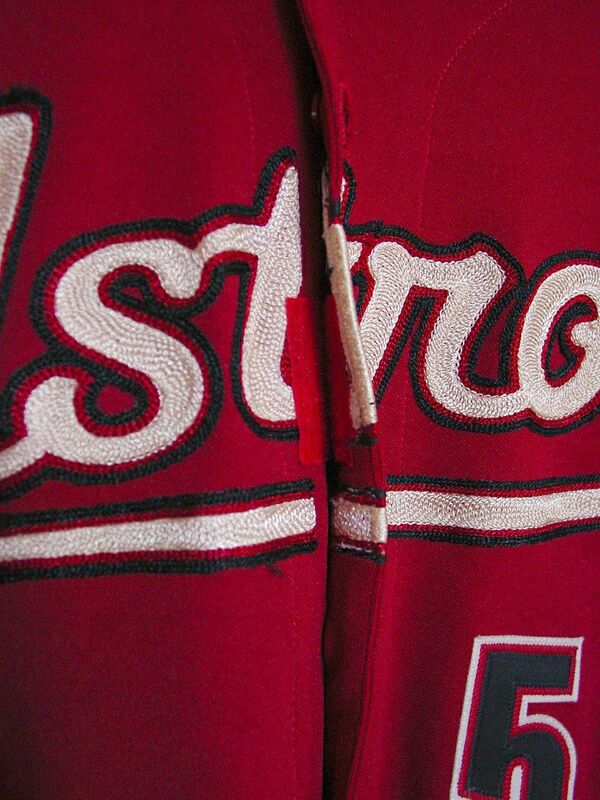 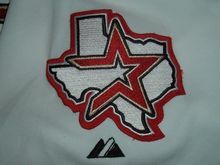 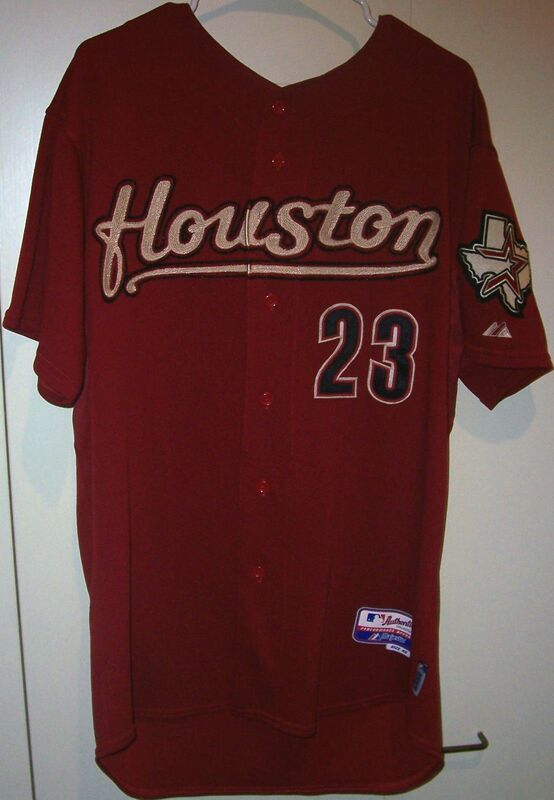 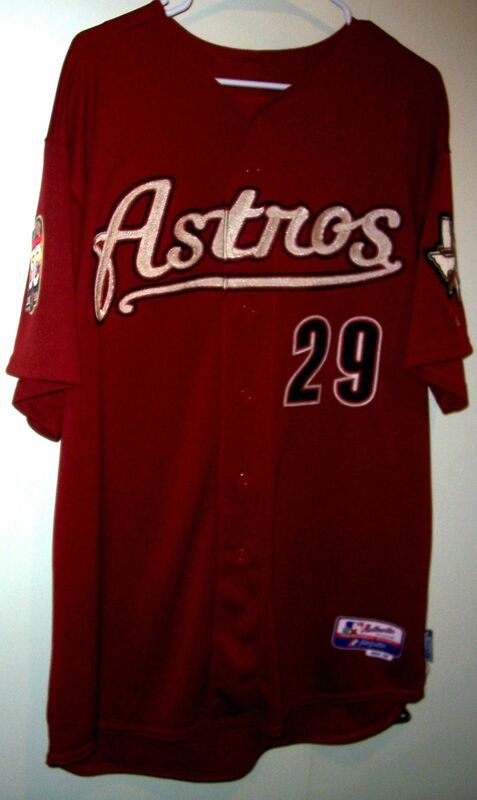 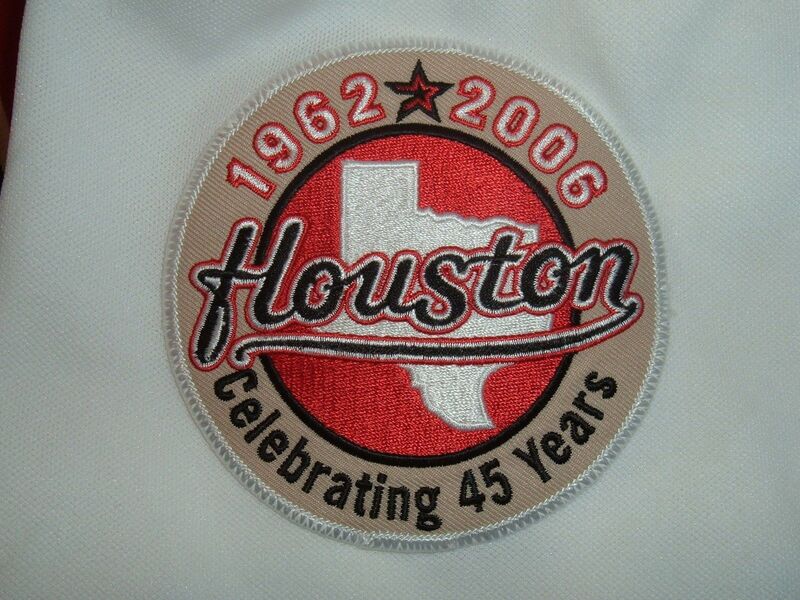 Astrodome 35th anniversay patch worn in 1999. 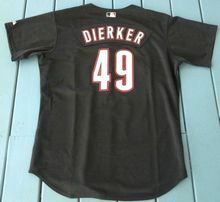 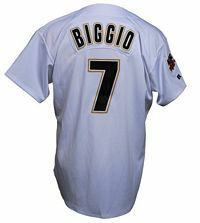 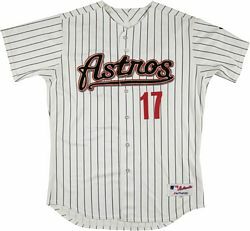 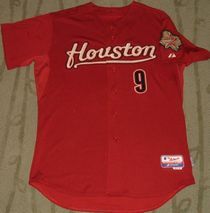 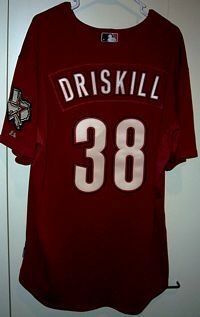 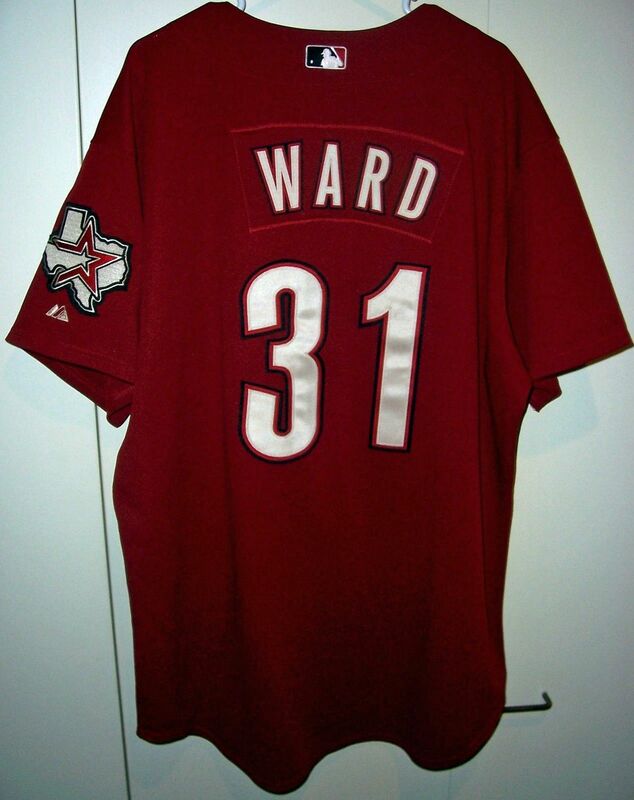 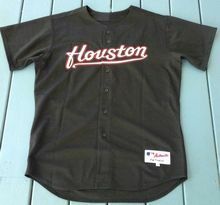 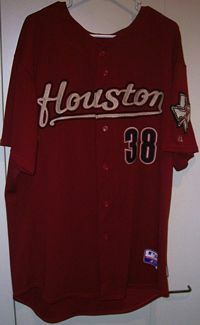 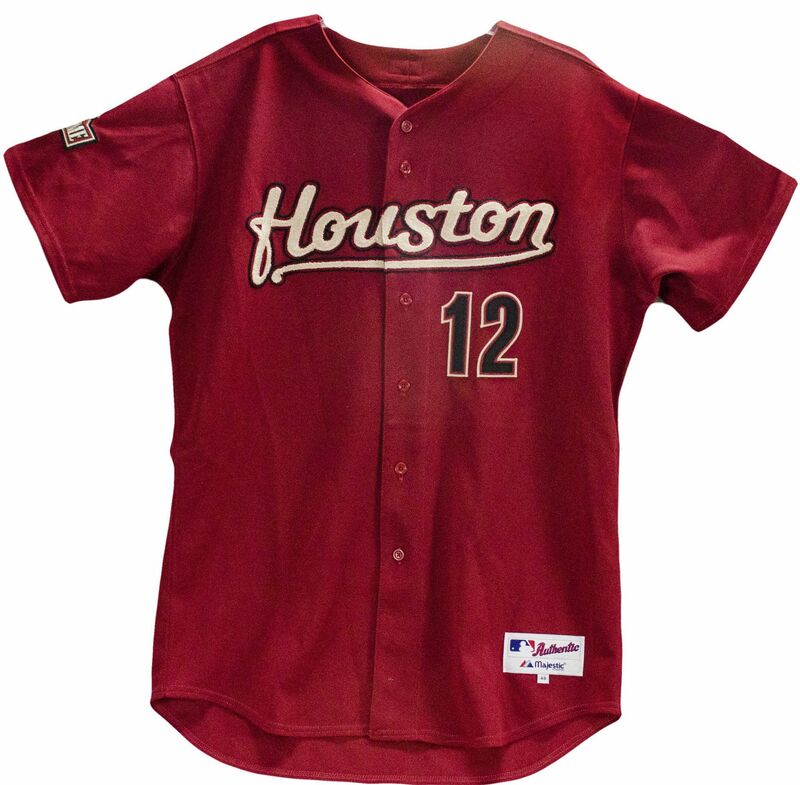 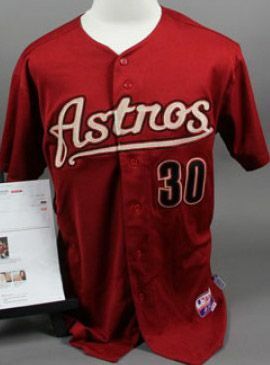 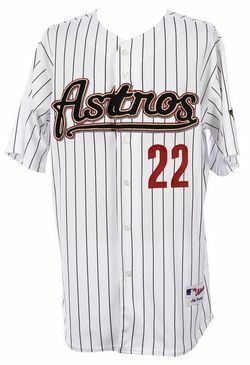 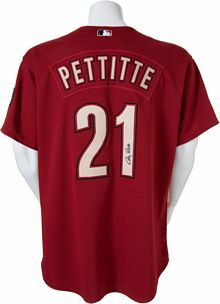 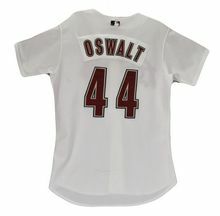 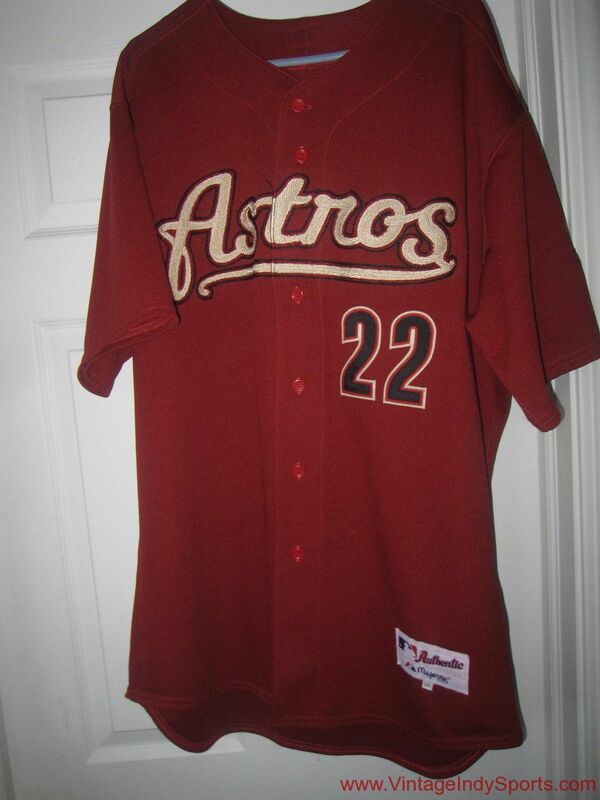 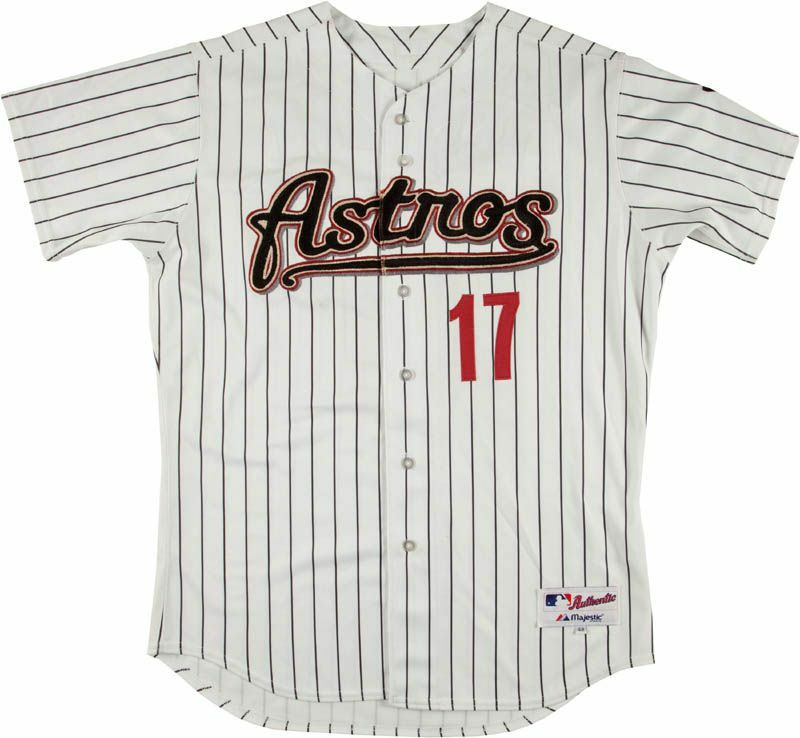 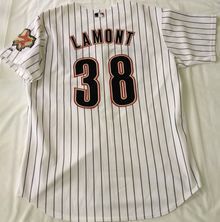 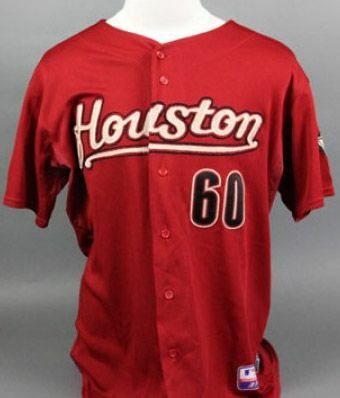 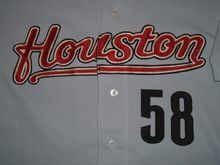 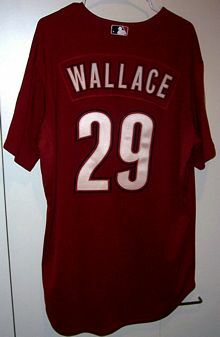 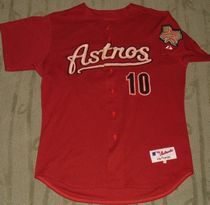 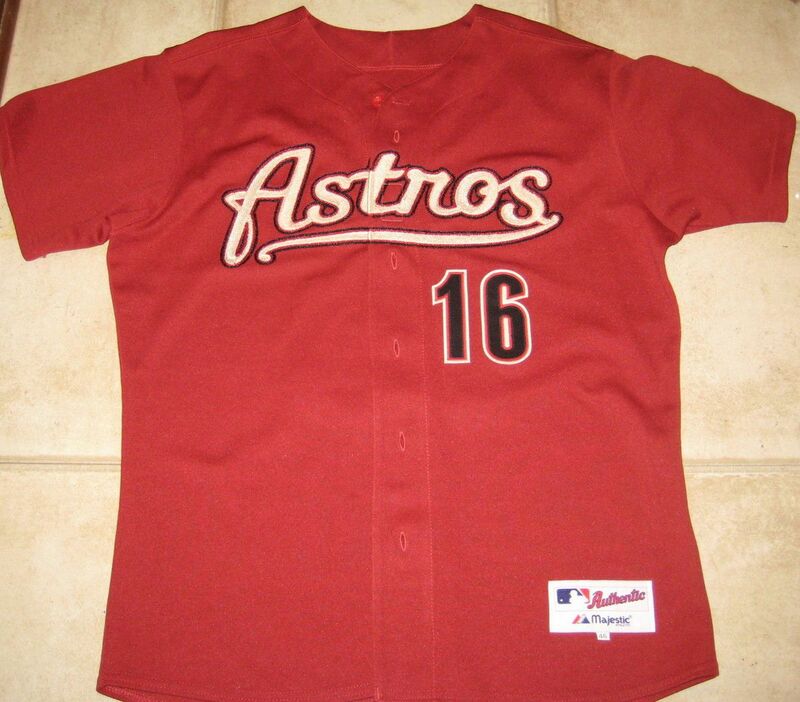 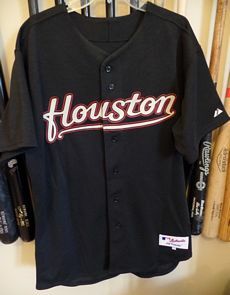 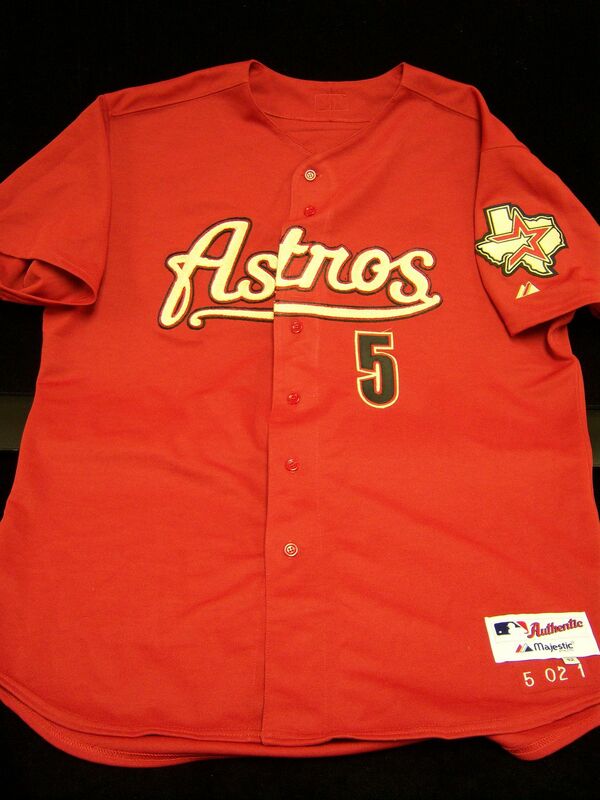 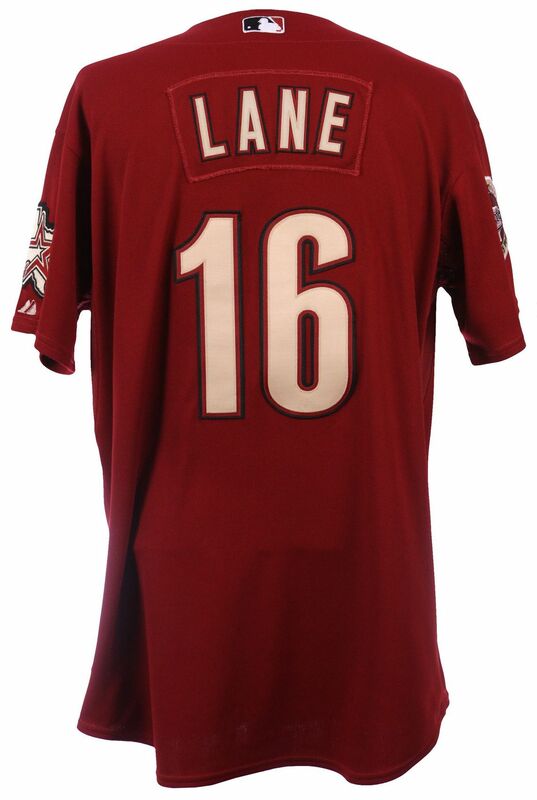 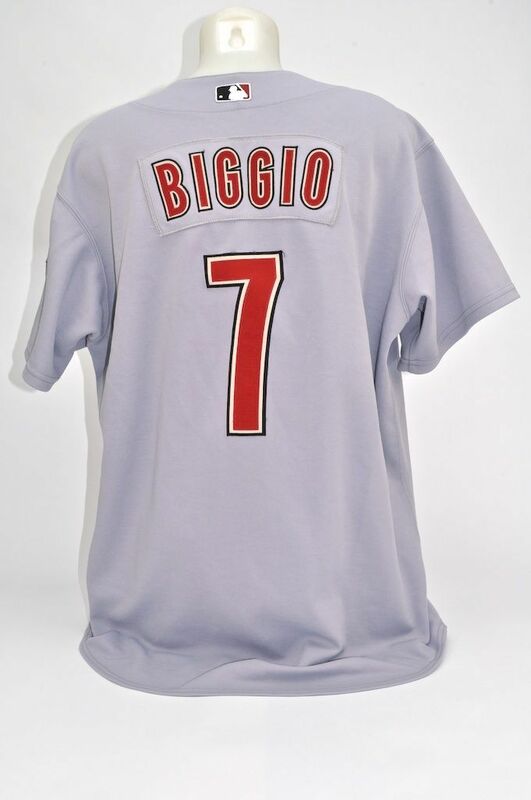 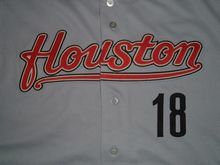 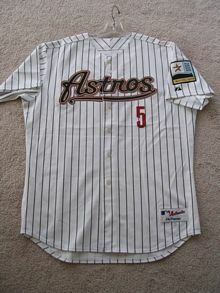 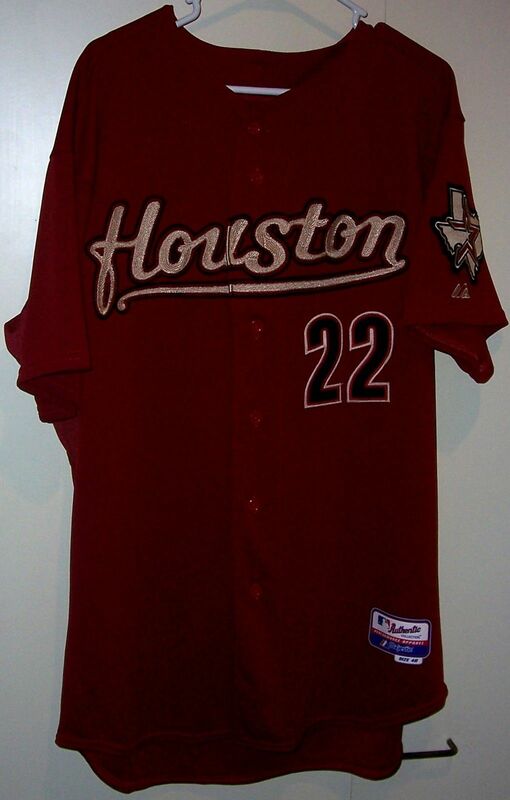 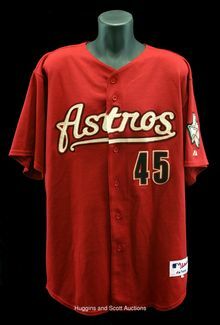 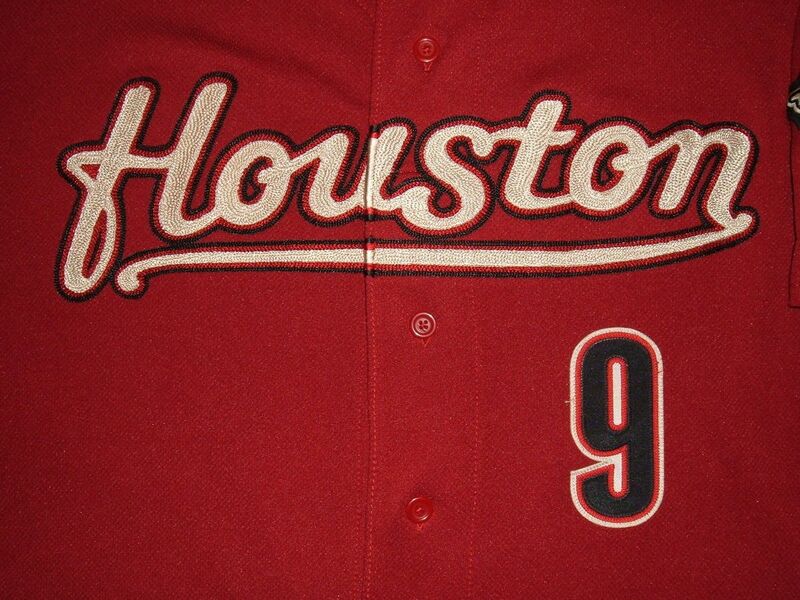 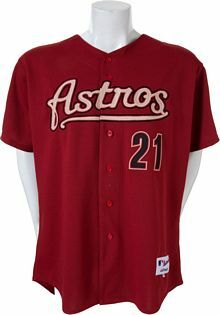 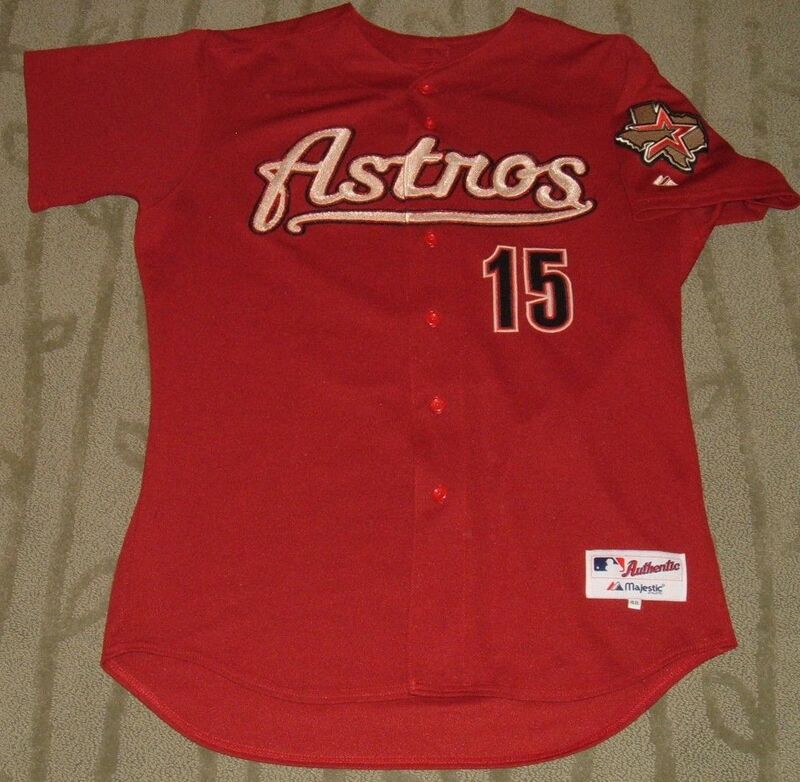 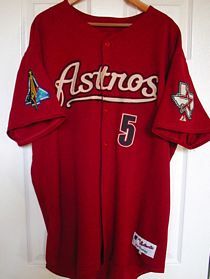 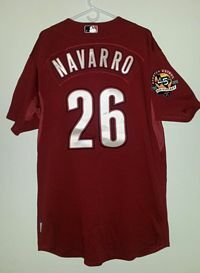 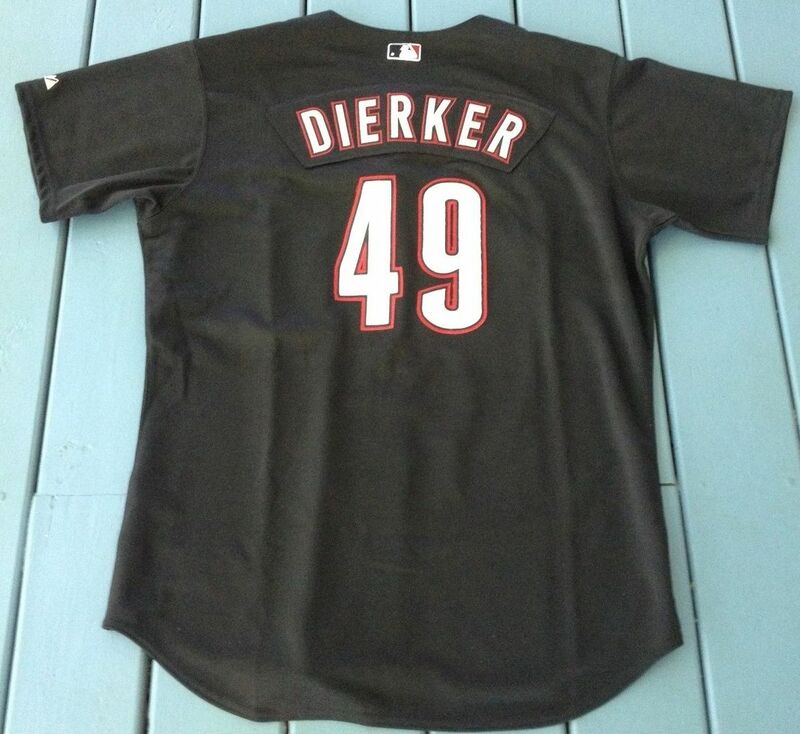 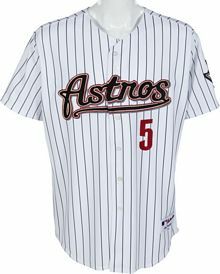 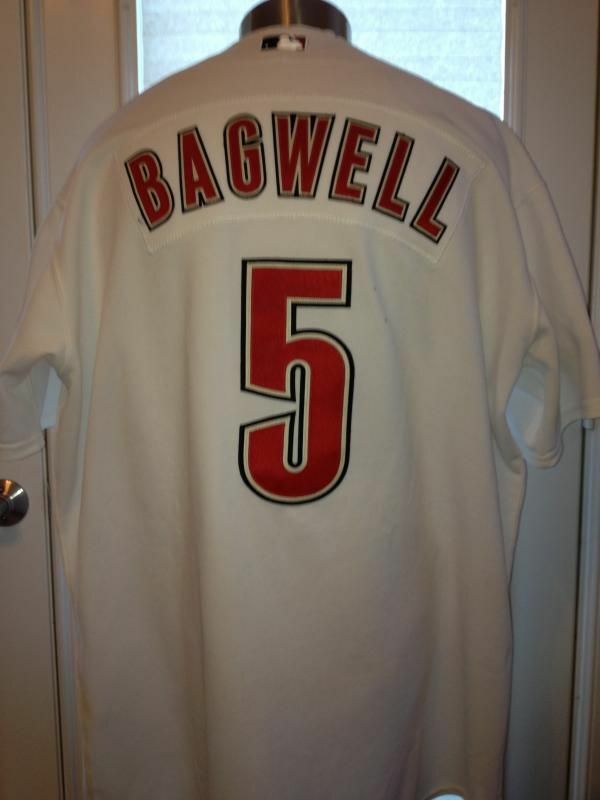 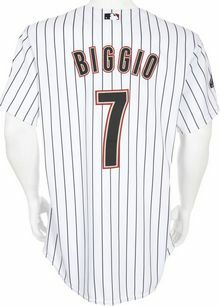 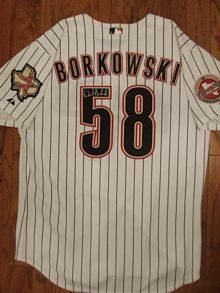 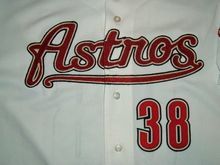 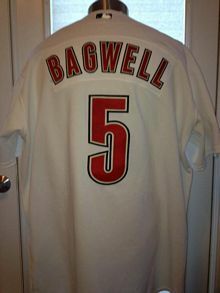 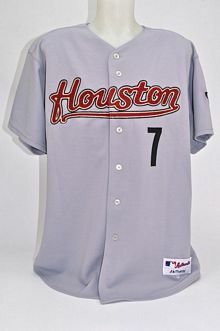 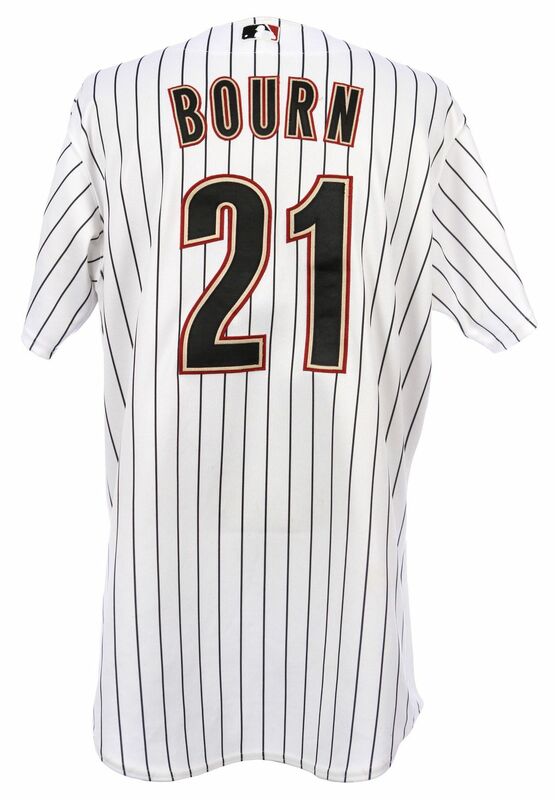 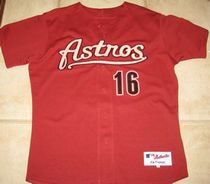 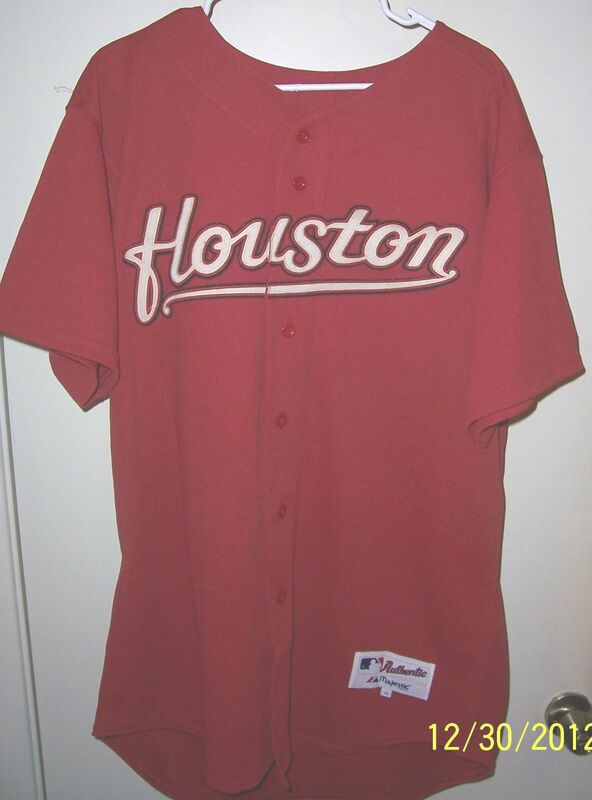 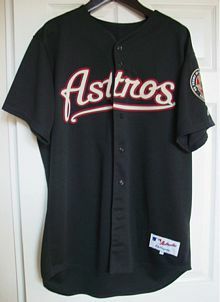 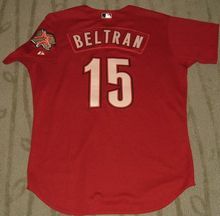 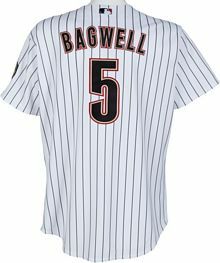 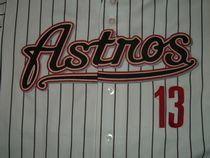 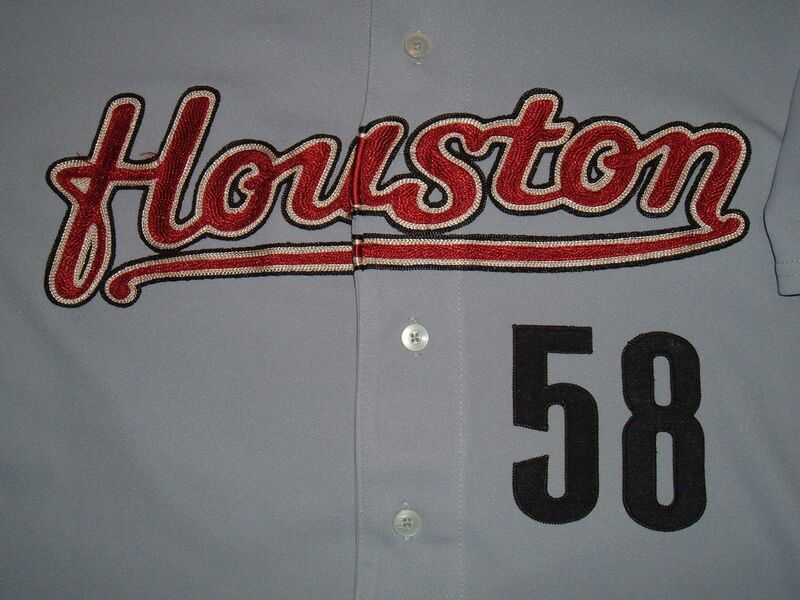 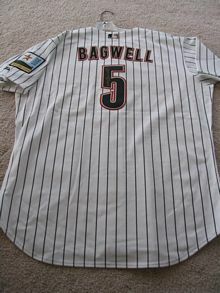 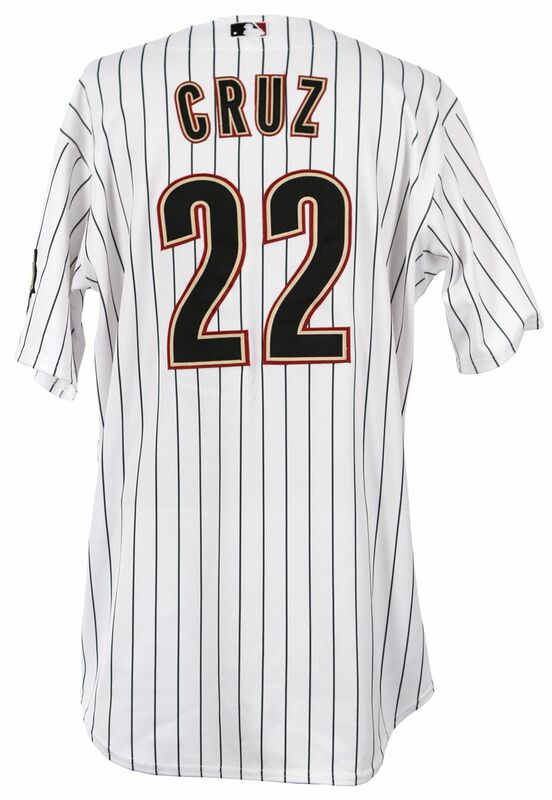 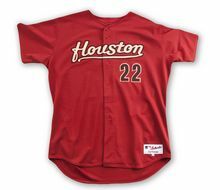 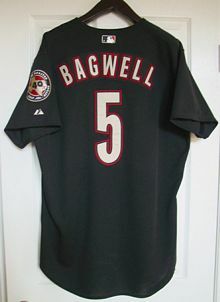 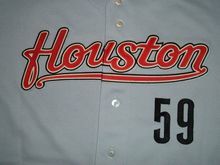 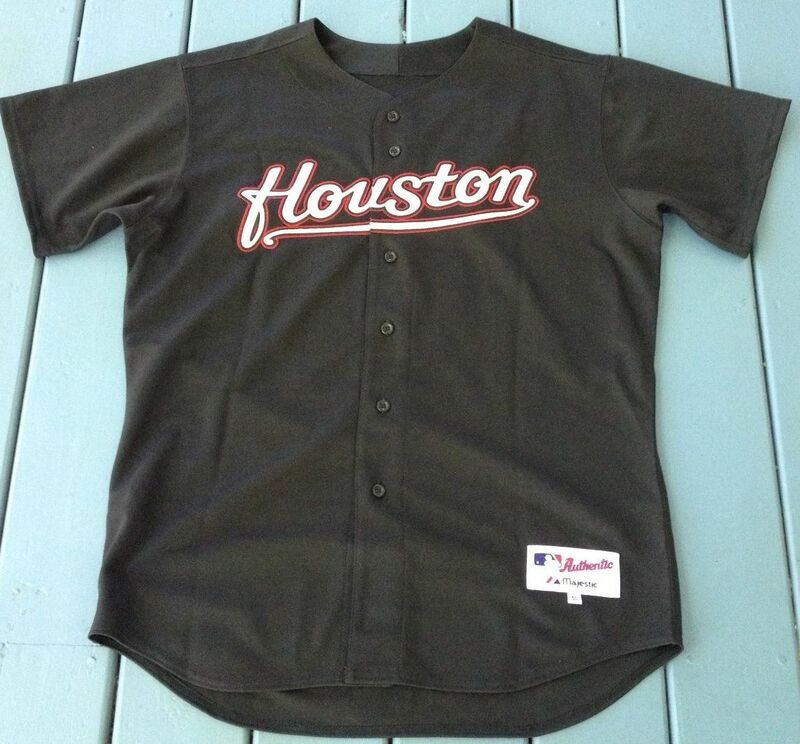 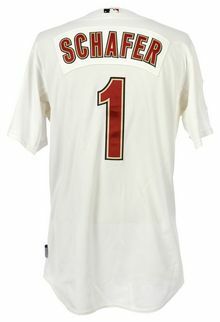 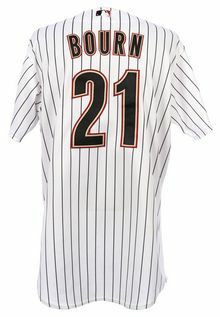 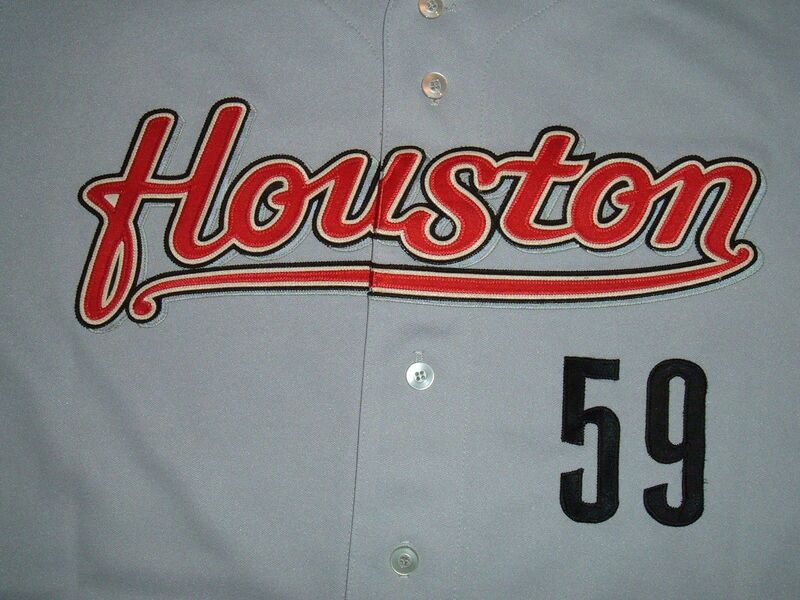 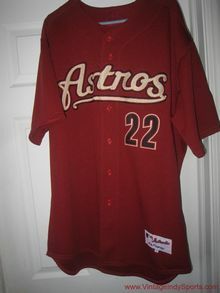 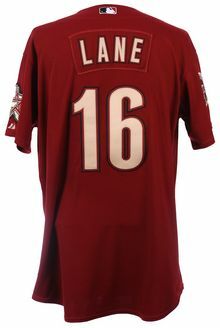 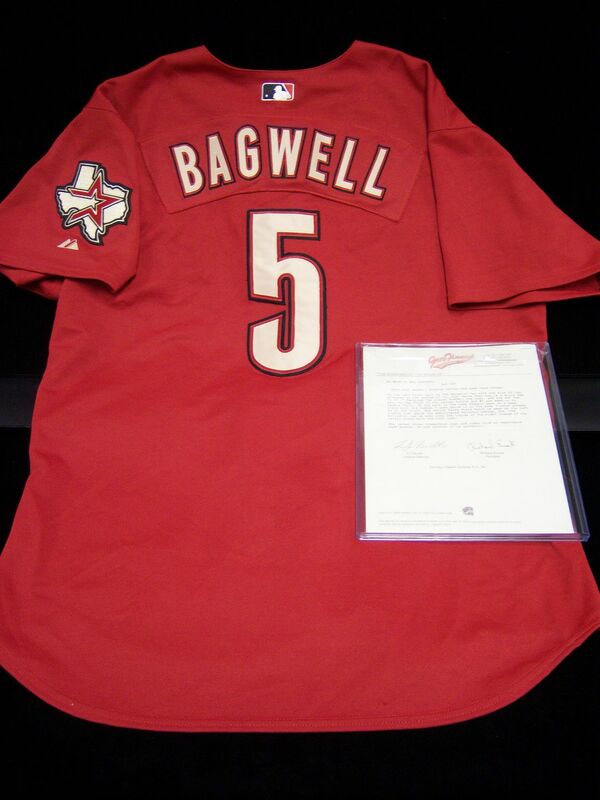 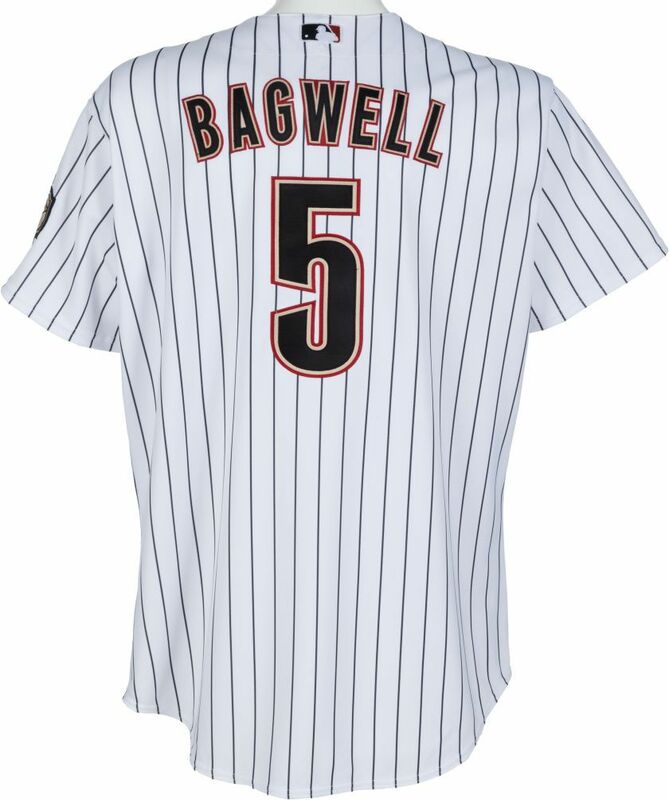 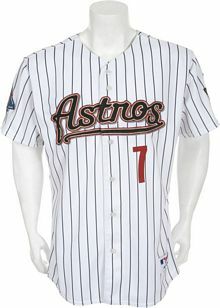 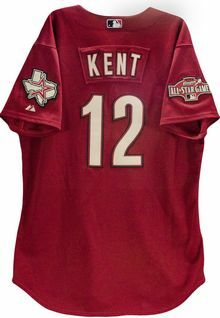 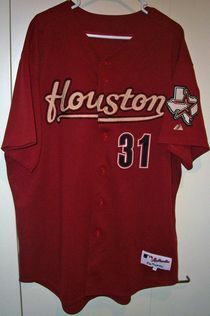 The Astros open the vault for a new wardrobe consisting of 5 jerseys in a new design of brick red and black, celebrating the move to Enron Field at the old railway yard. 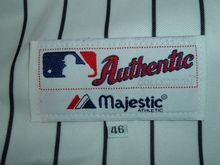 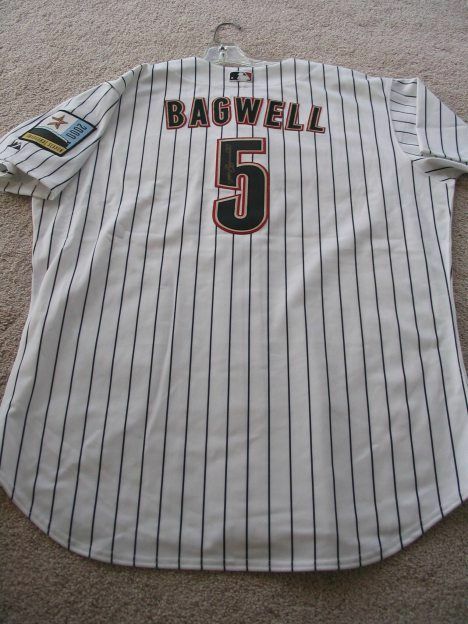 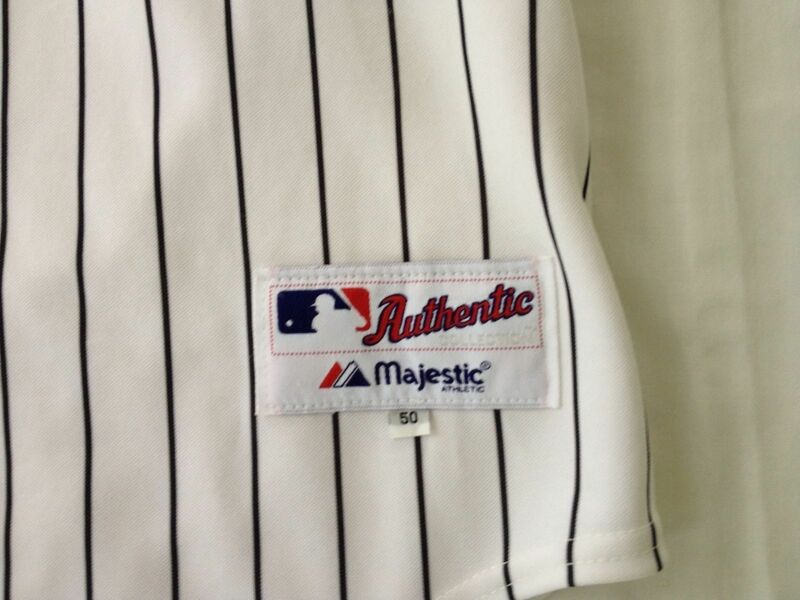 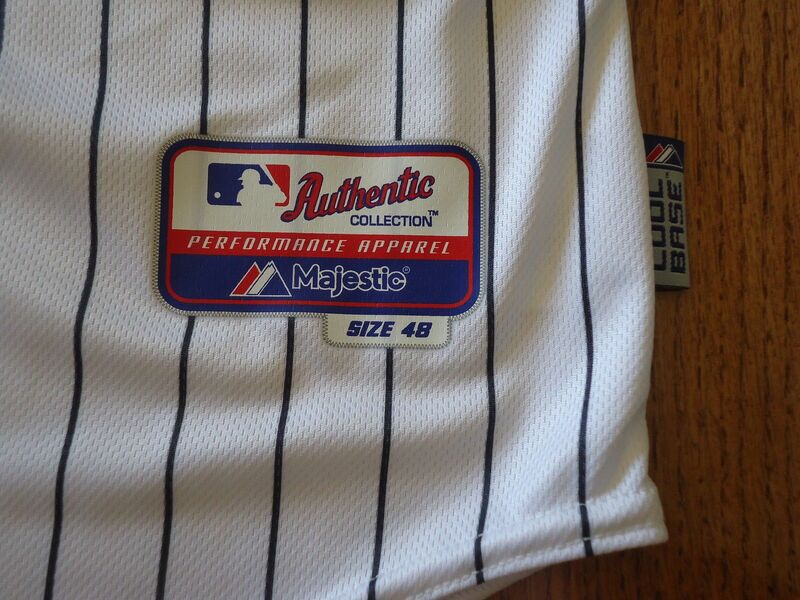 The jerseys are: home pinstripe, home white, home black, road grey, road black. 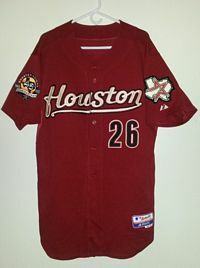 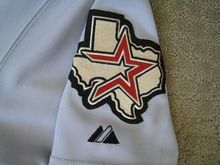 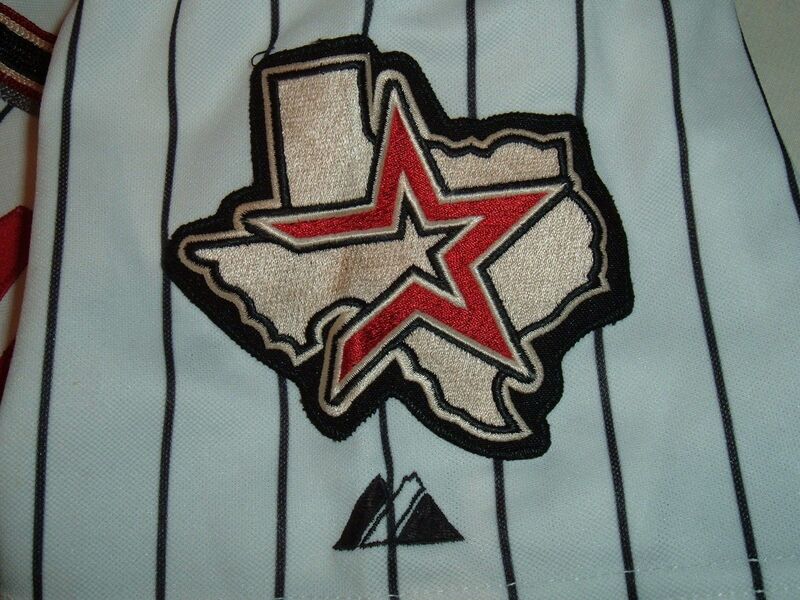 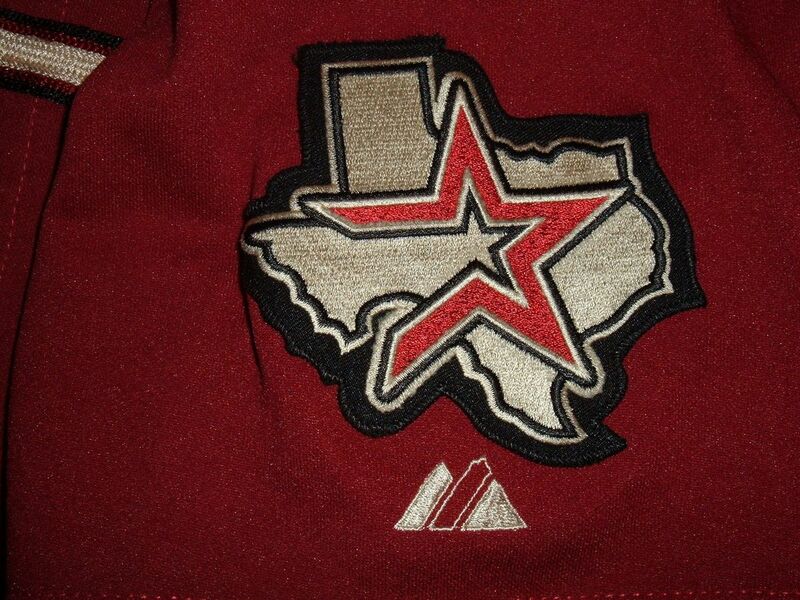 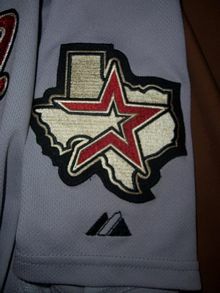 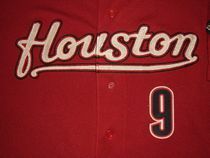 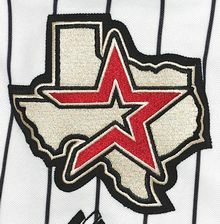 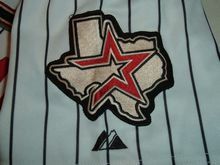 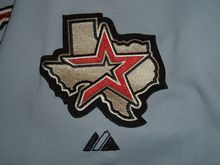 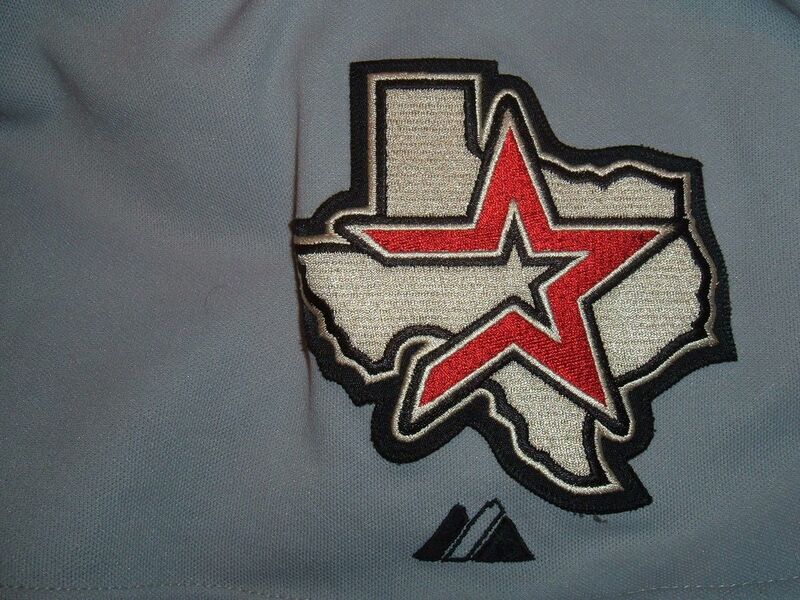 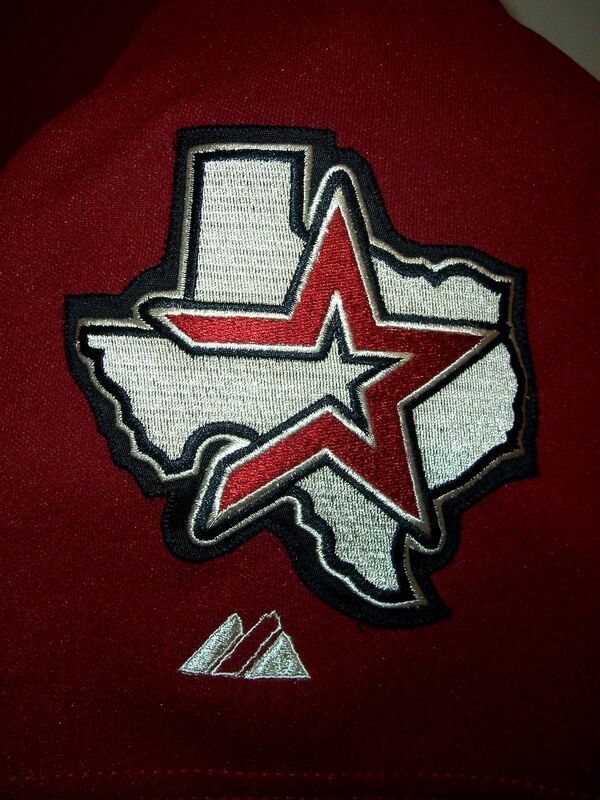 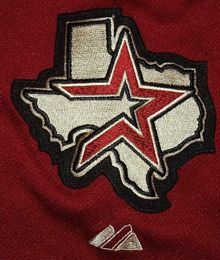 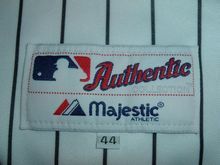 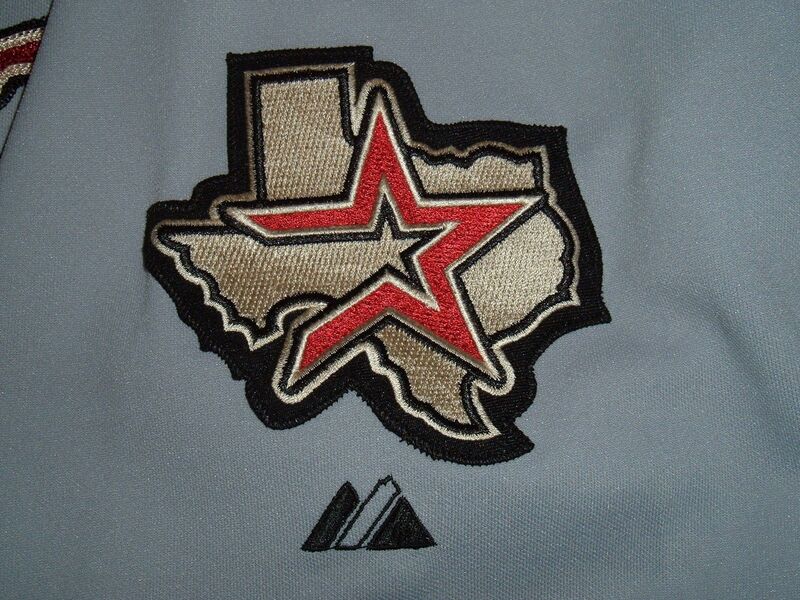 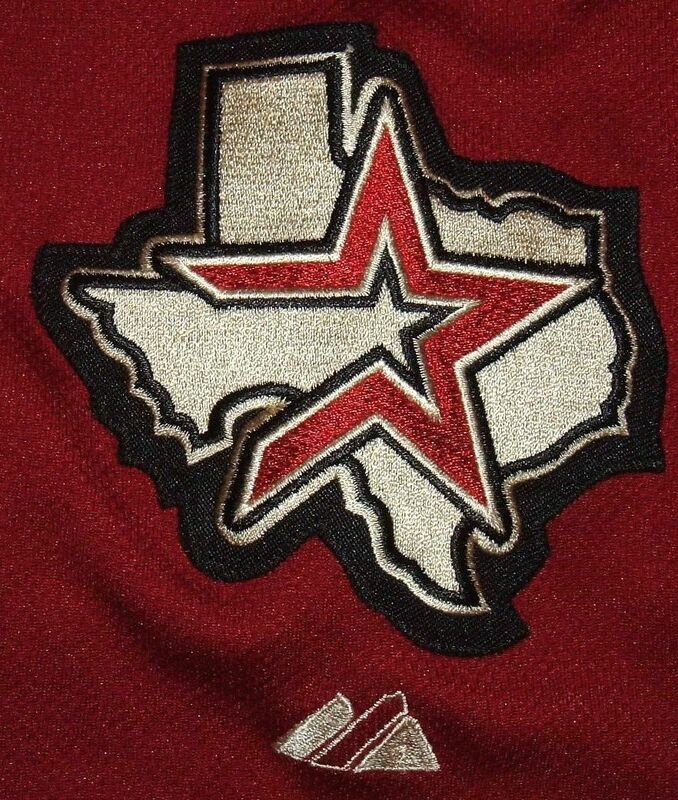 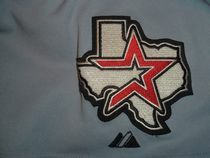 Enron Field inaugural season patch worn on home jerseys in 2000. 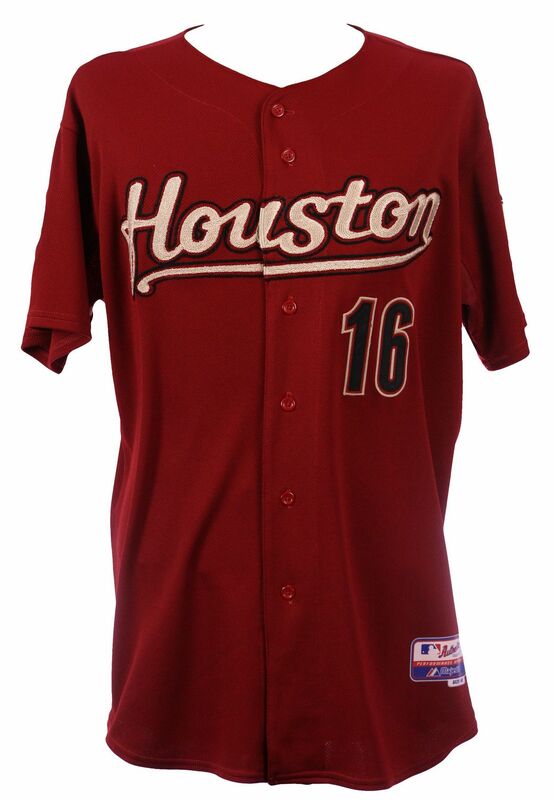 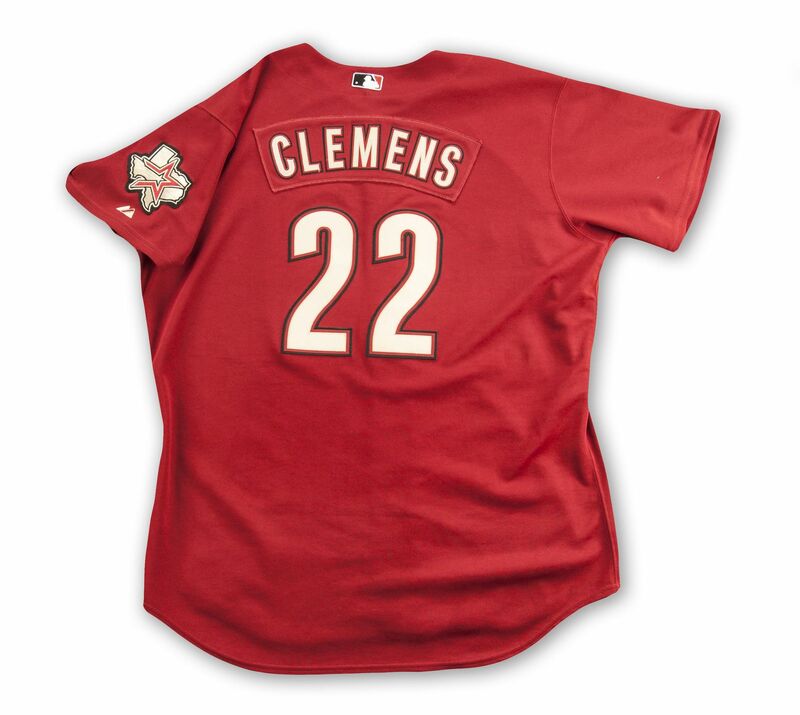 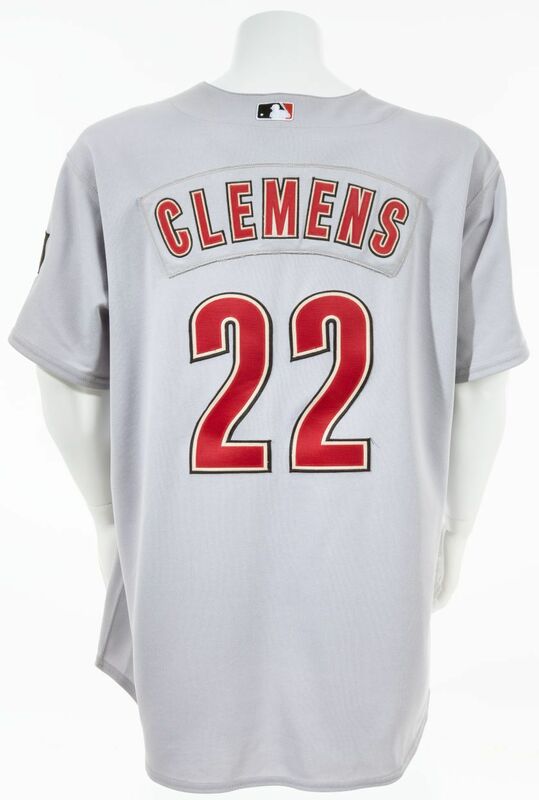 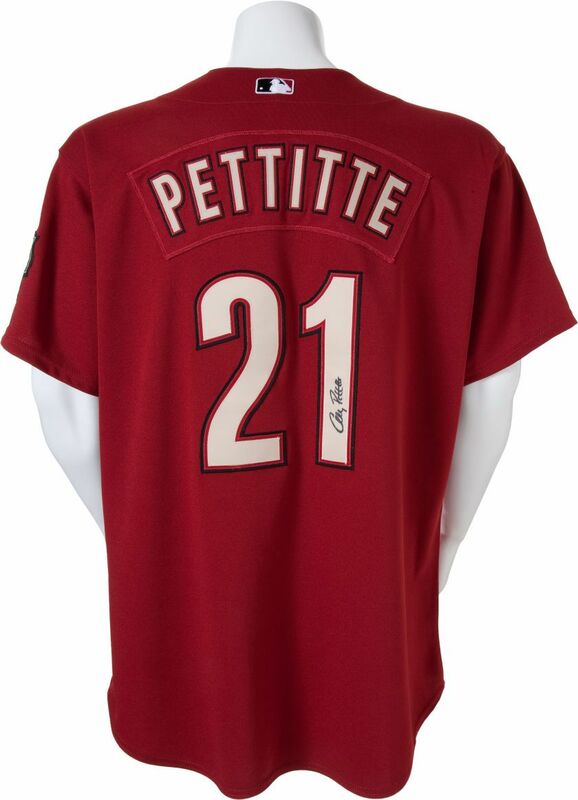 Road red jersey added, phasing out the road black. 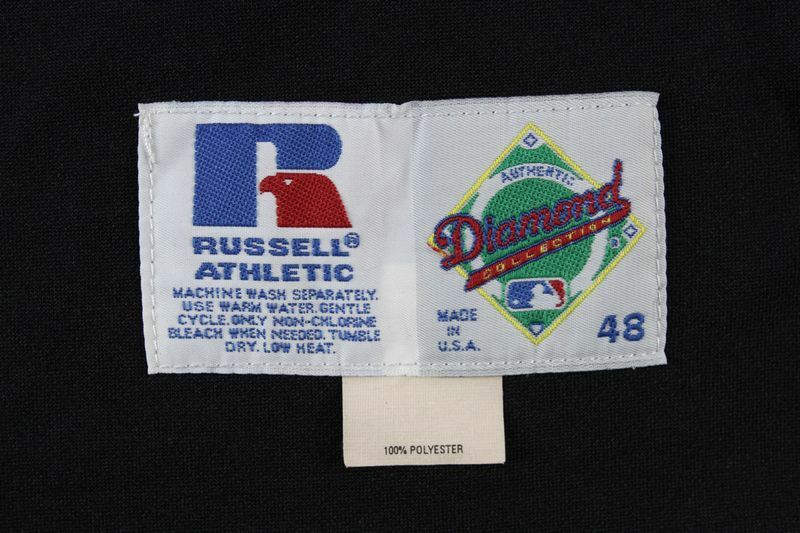 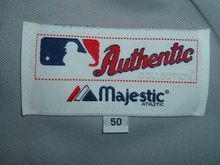 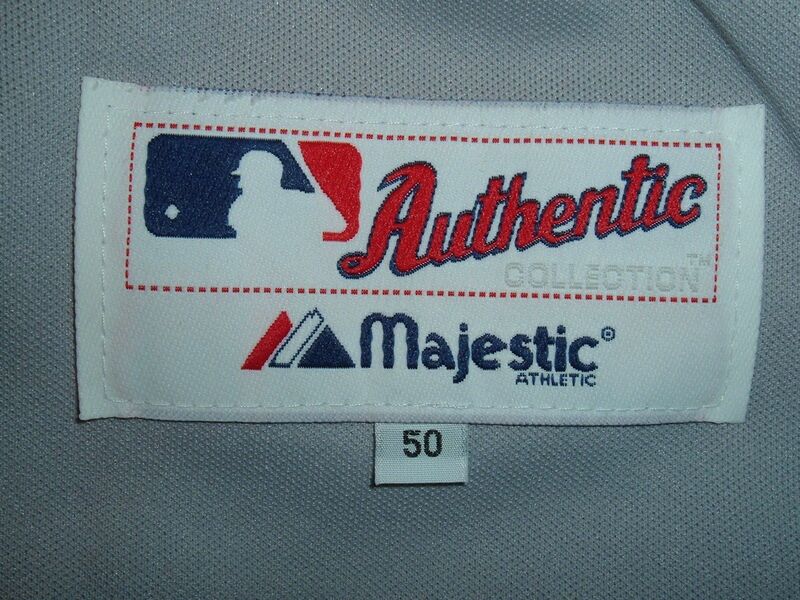 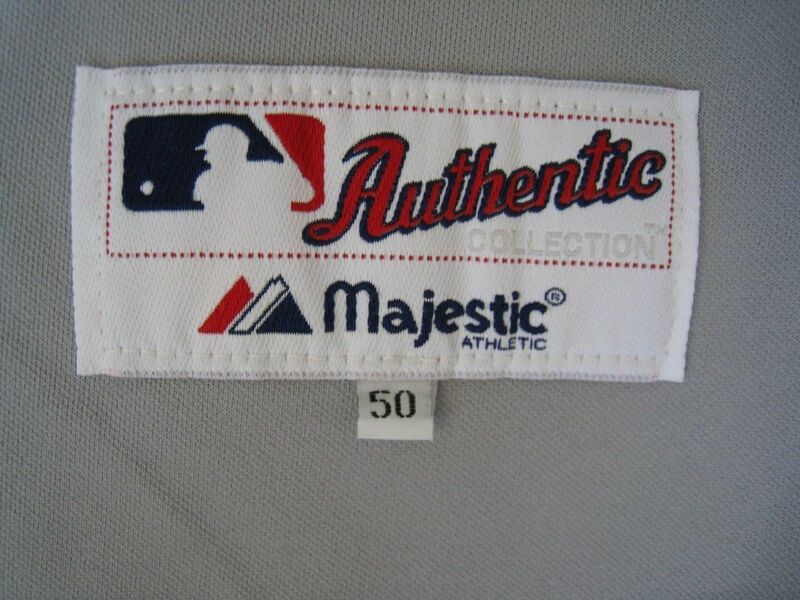 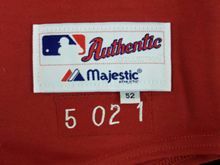 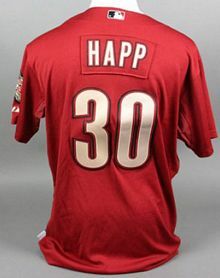 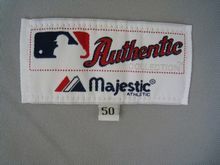 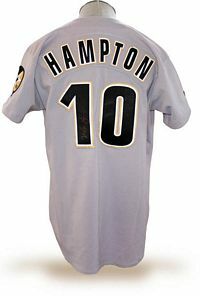 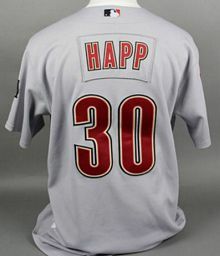 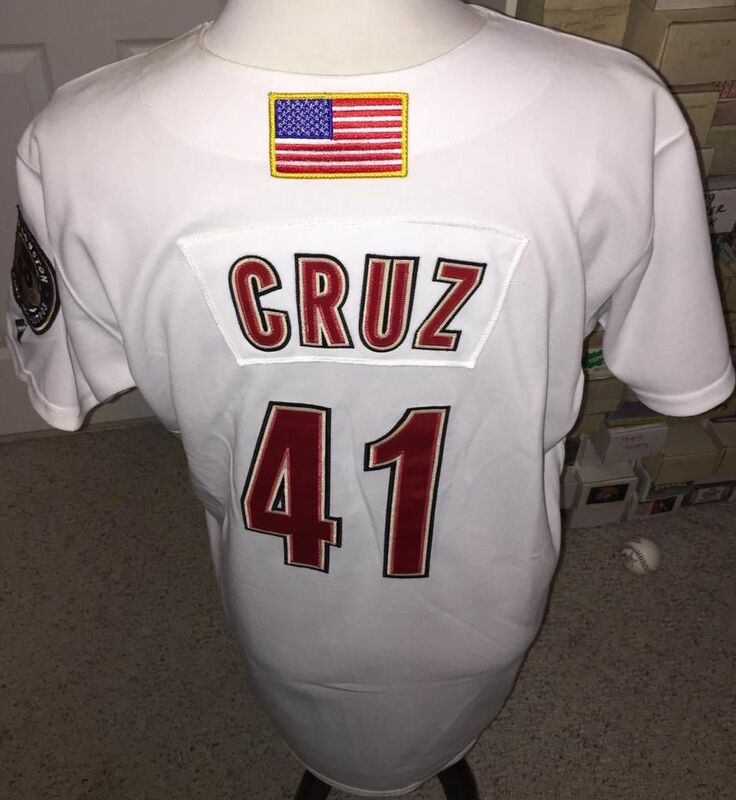 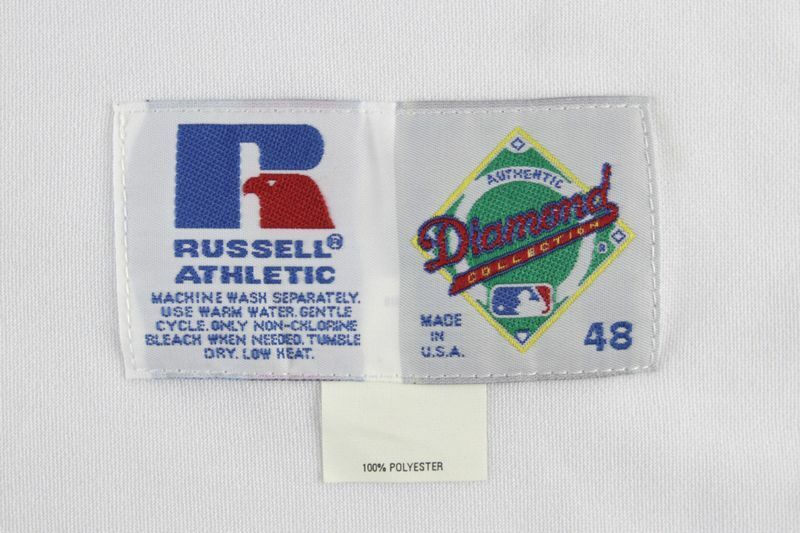 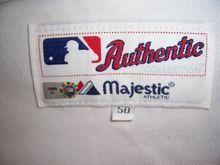 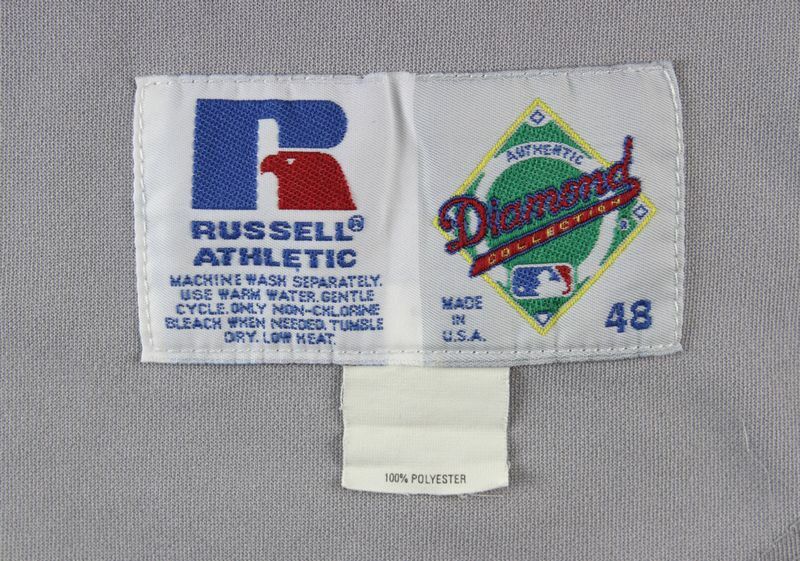 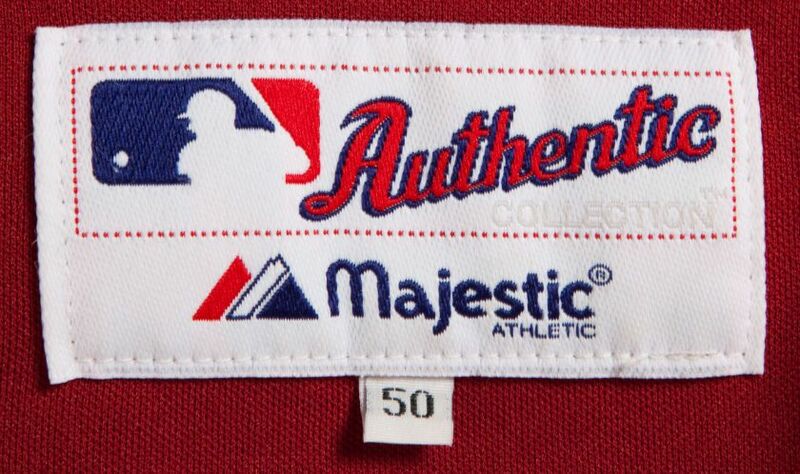 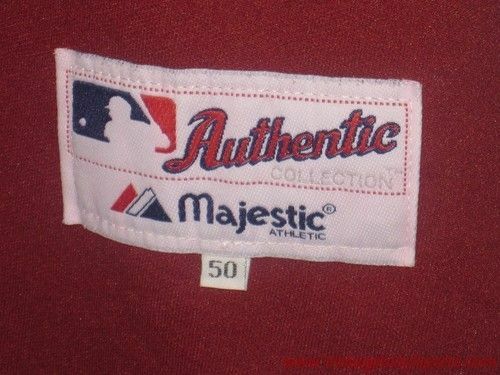 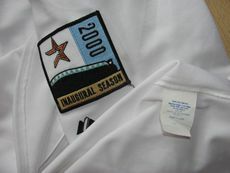 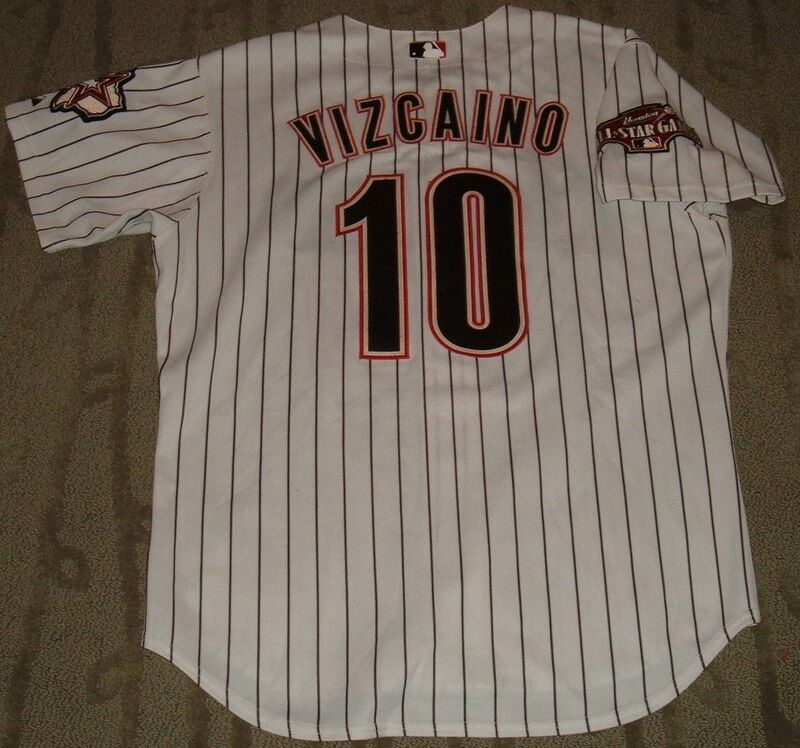 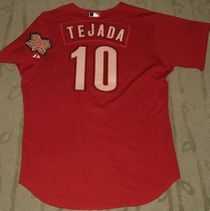 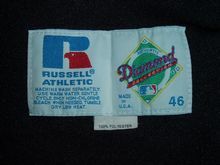 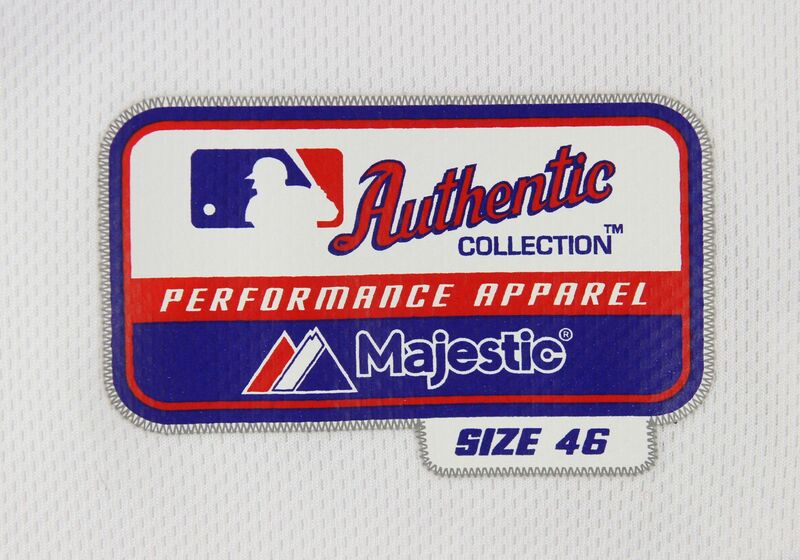 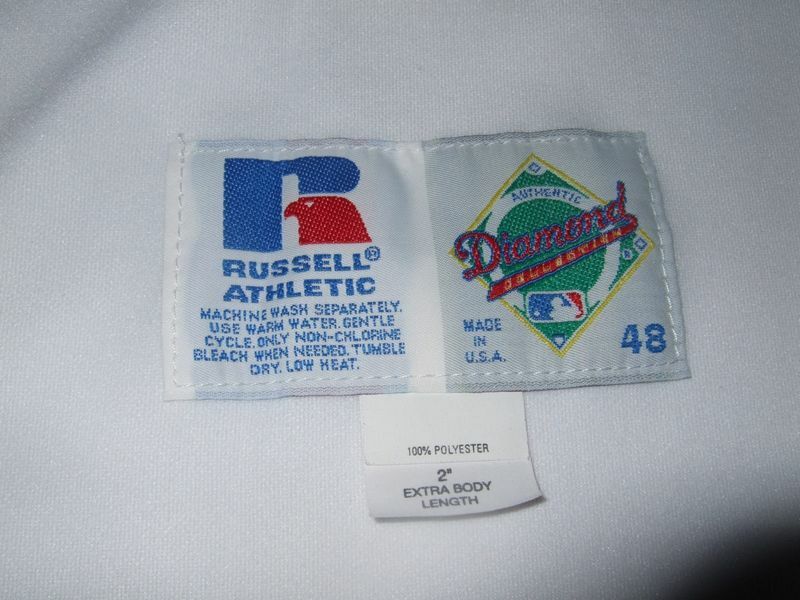 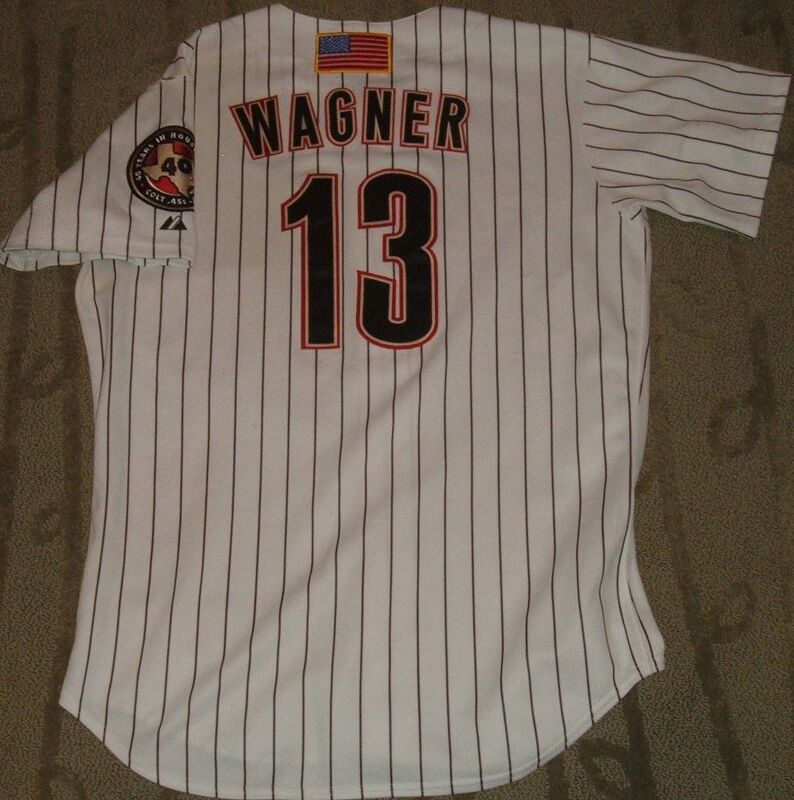 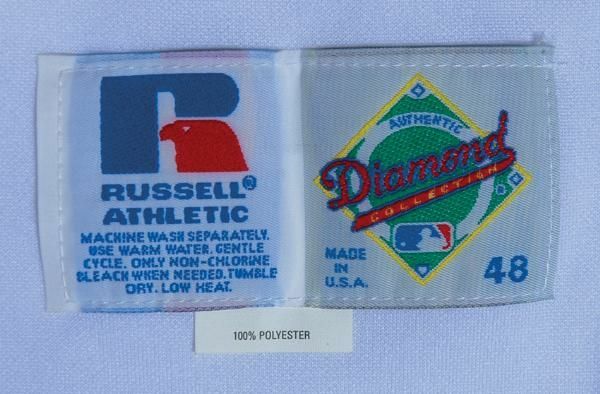 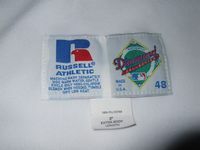 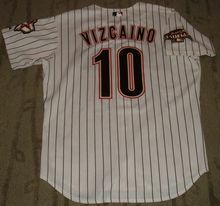 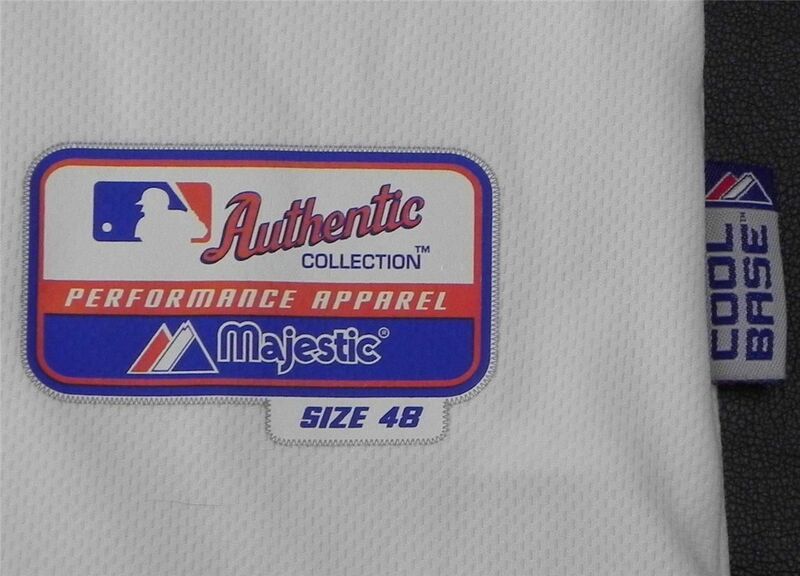 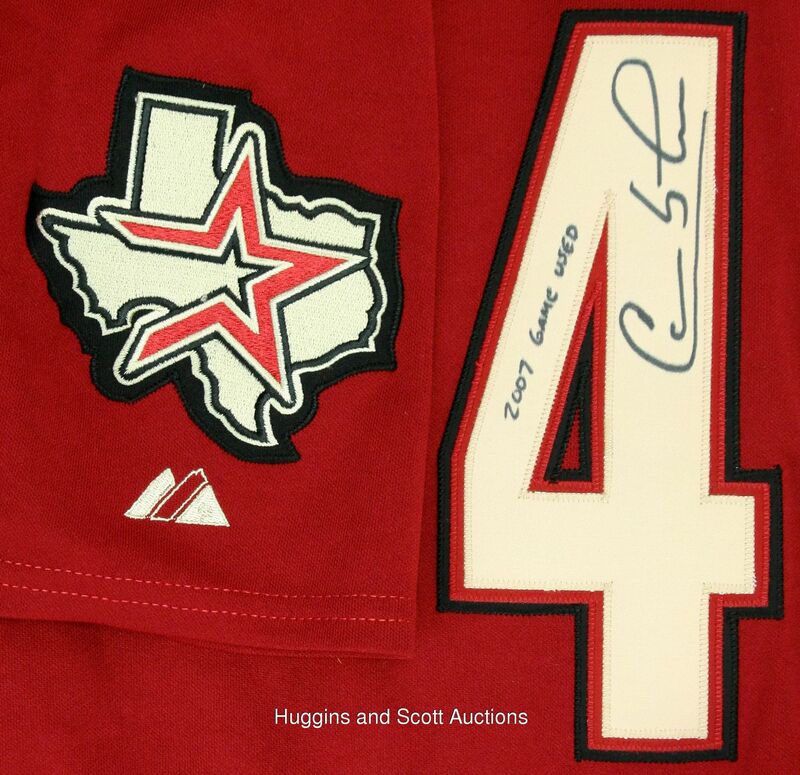 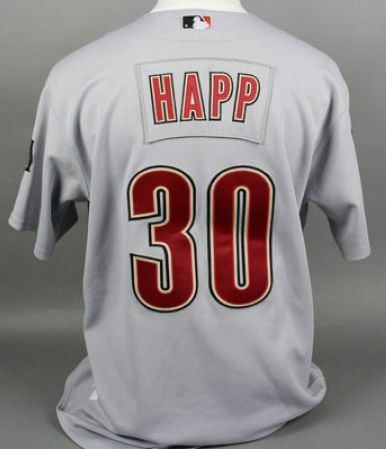 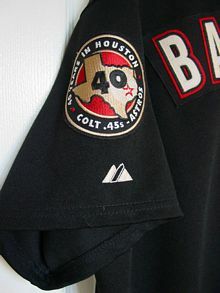 40th anniversary patch worn on home jerseys in 2001. The black home and road jerseys are dropped. 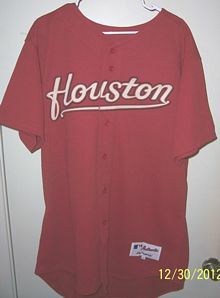 A red home alternate is introduced. 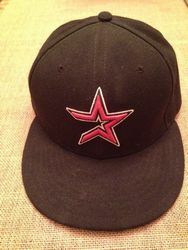 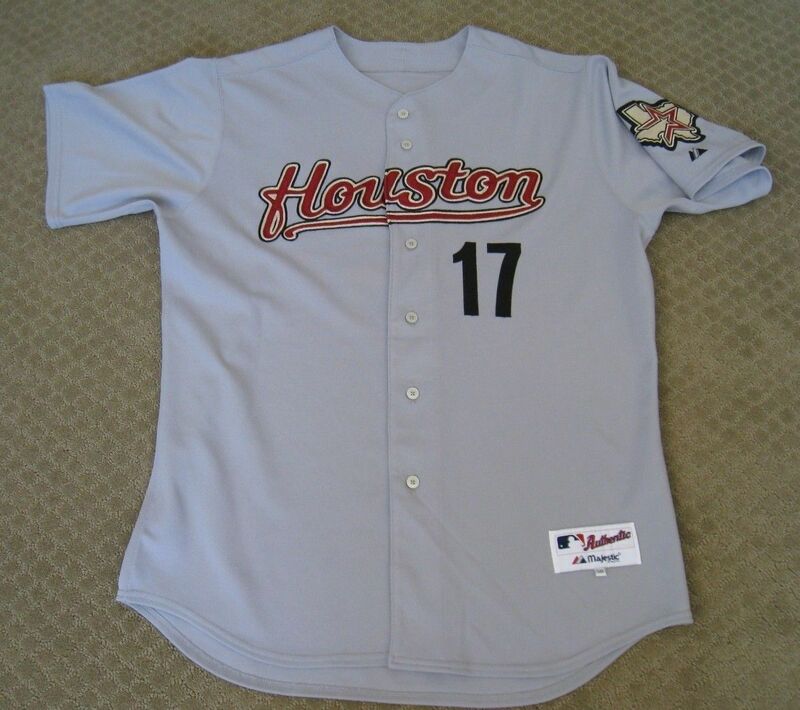 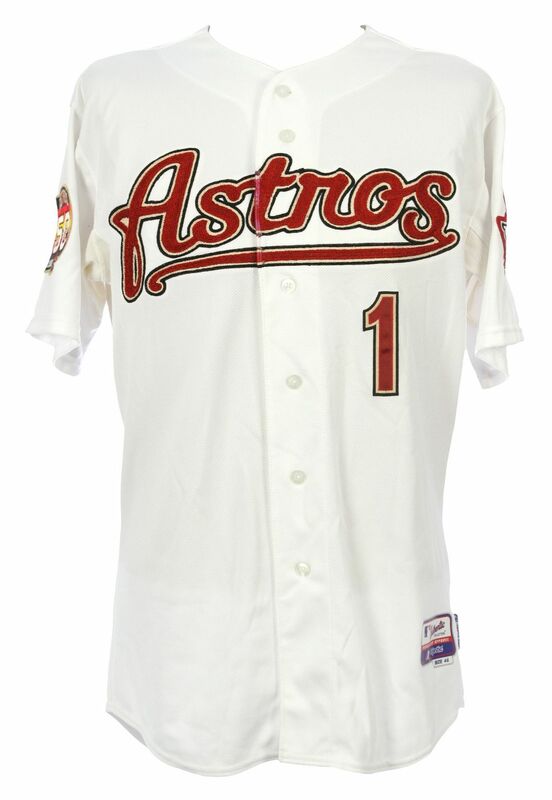 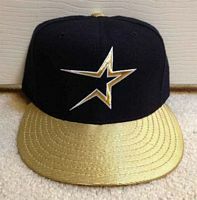 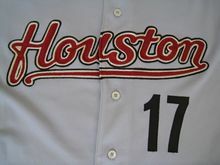 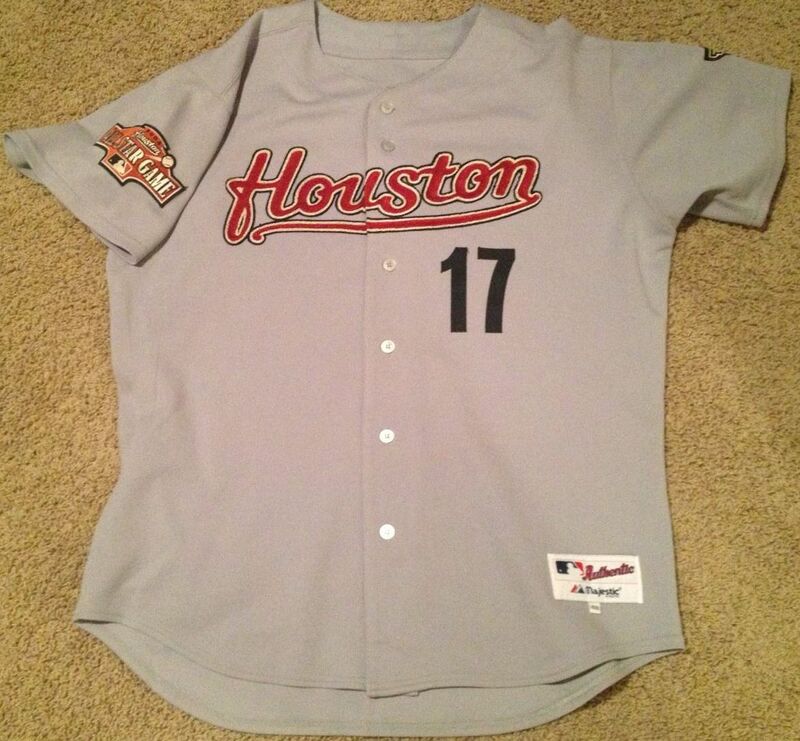 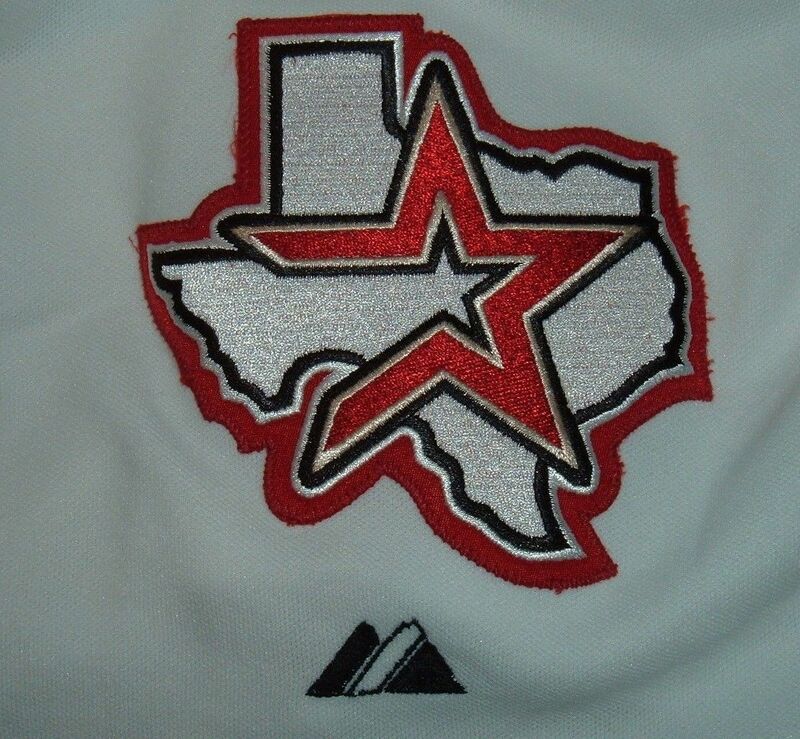 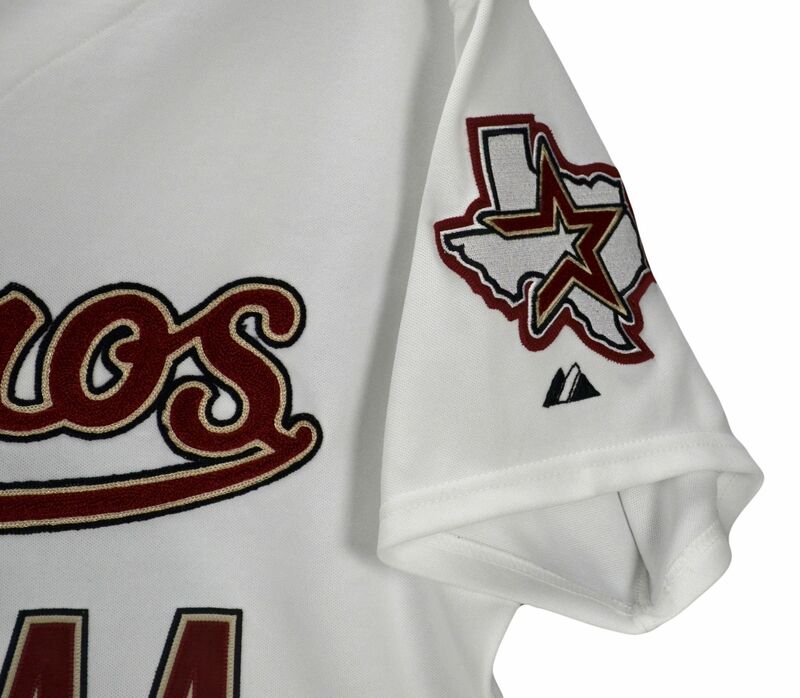 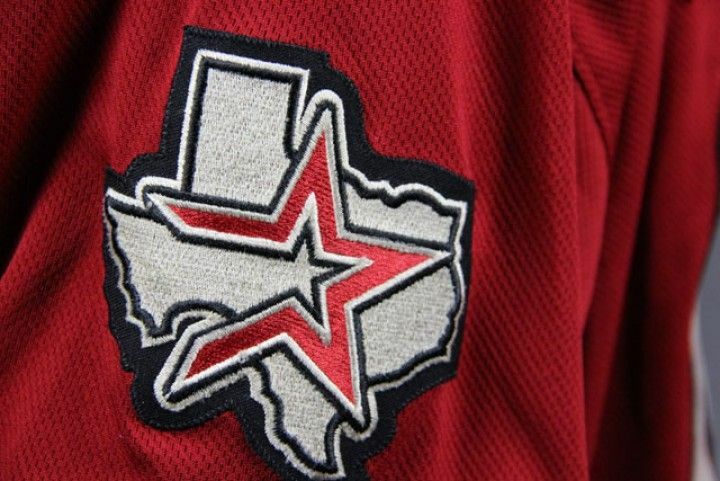 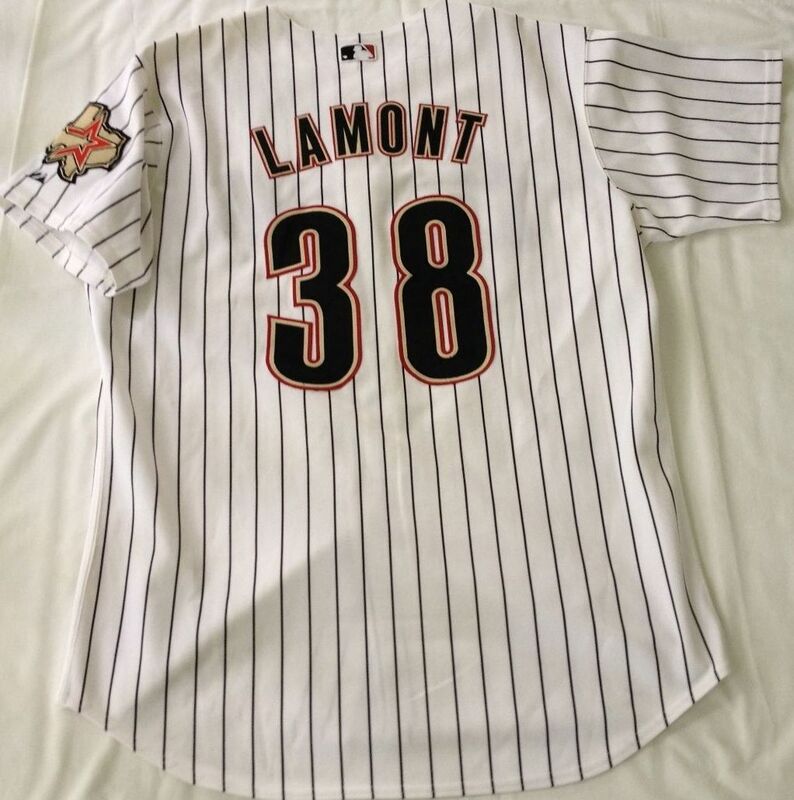 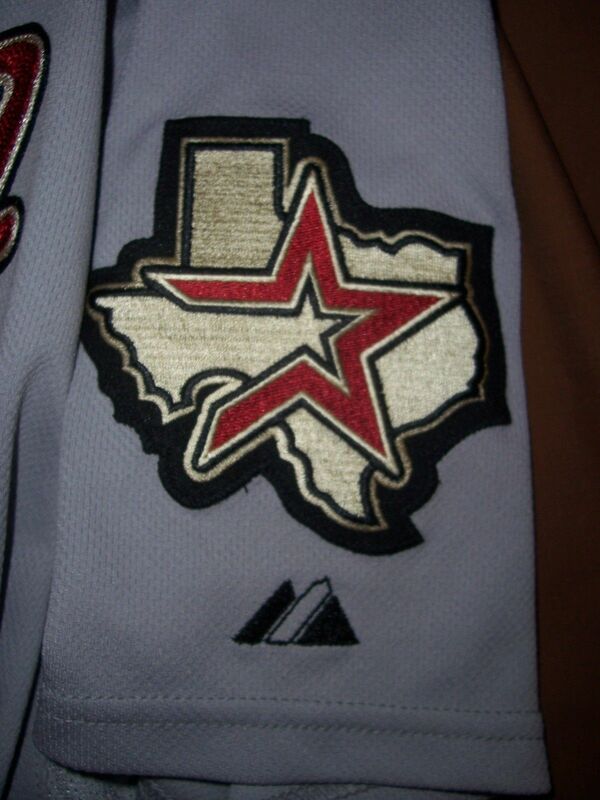 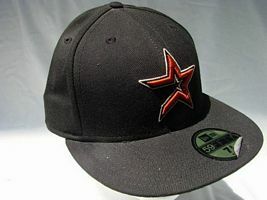 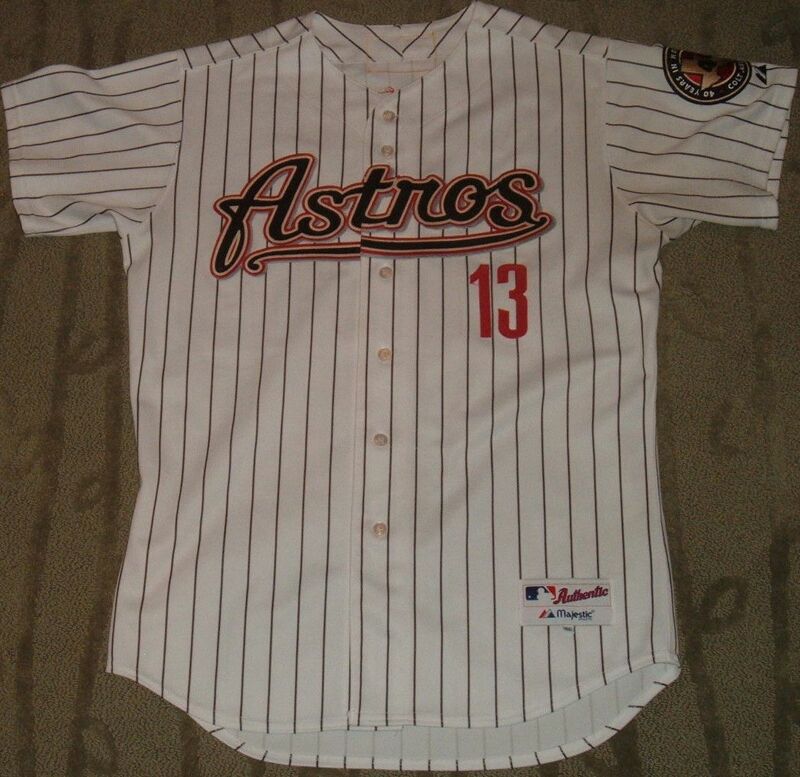 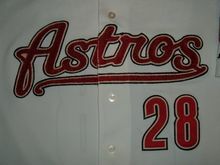 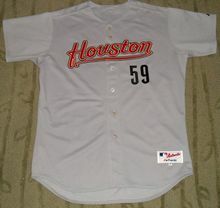 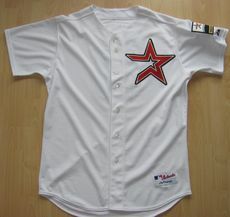 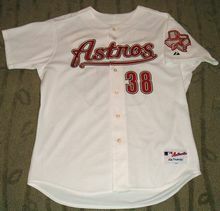 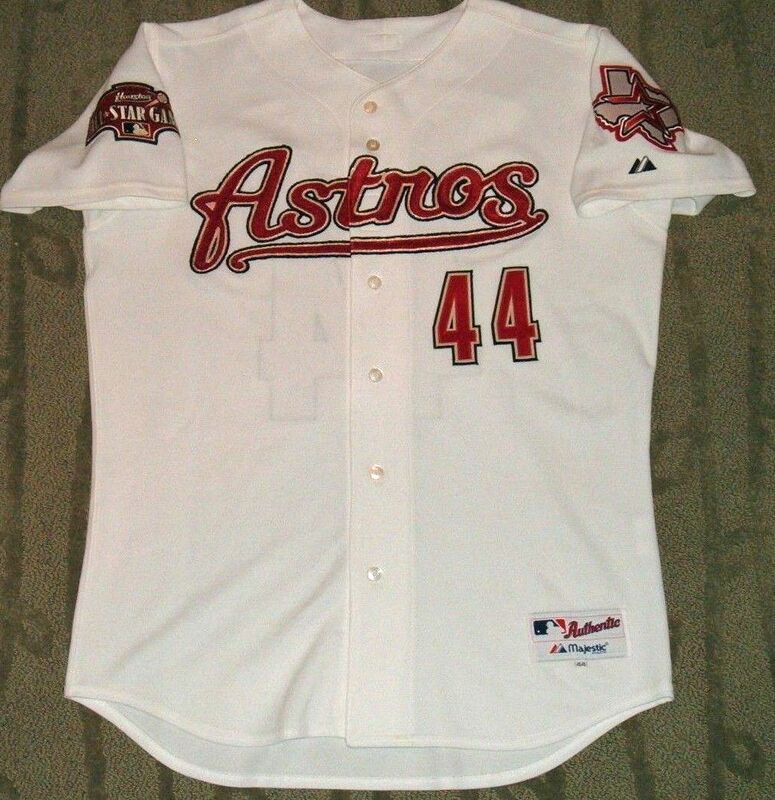 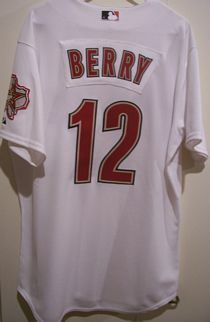 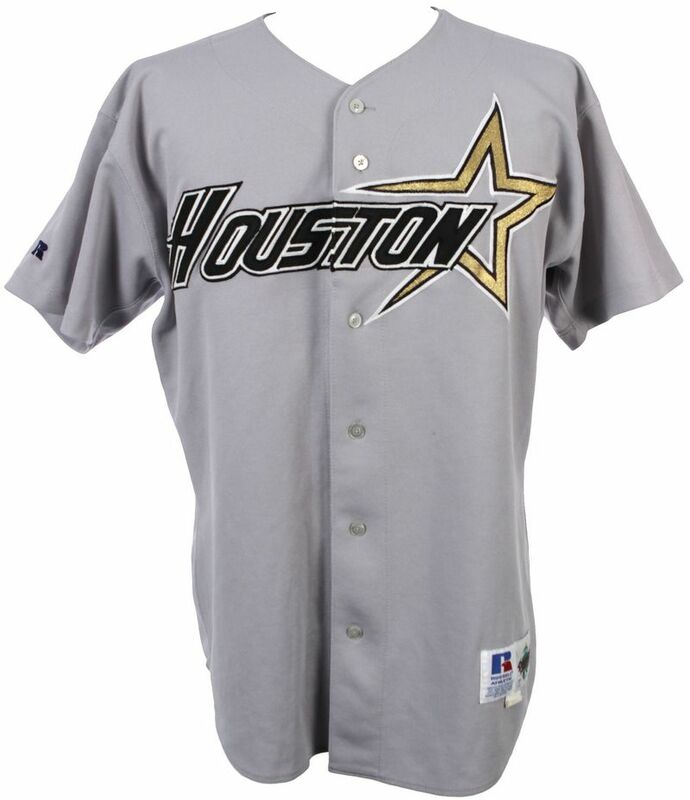 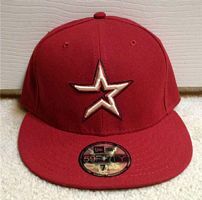 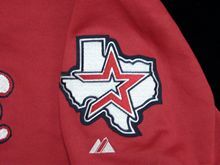 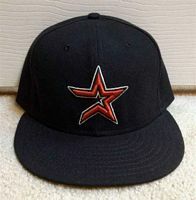 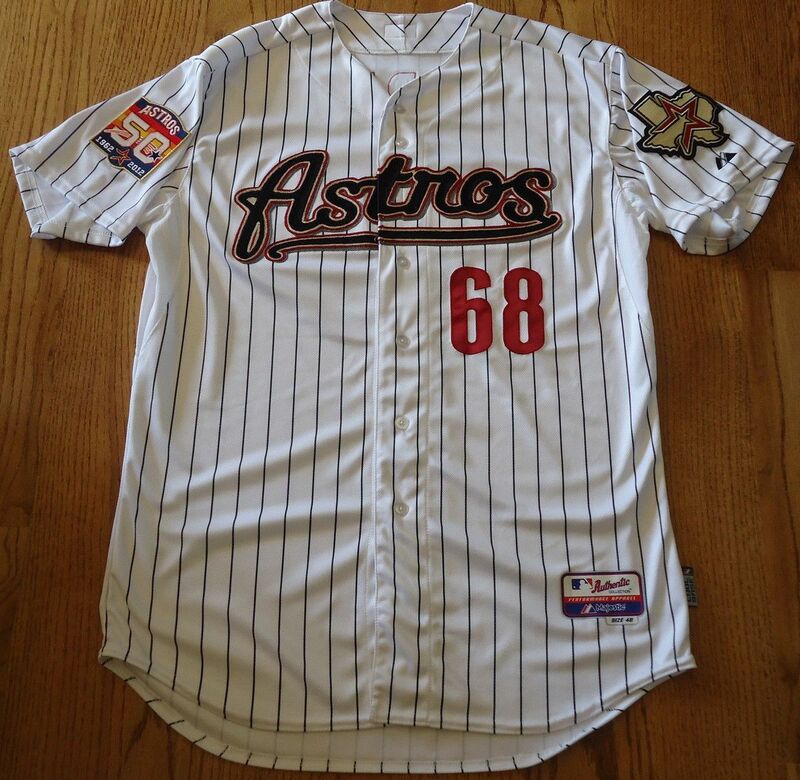 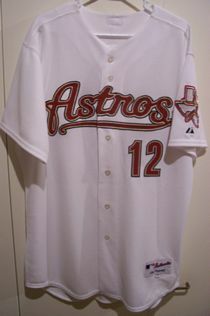 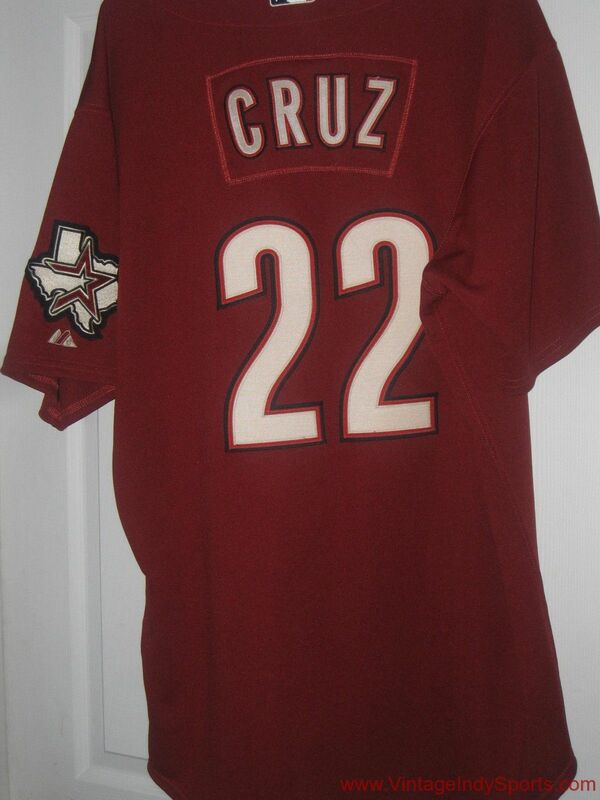 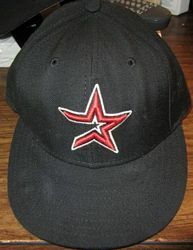 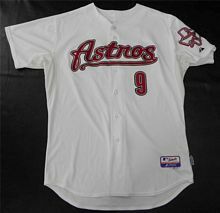 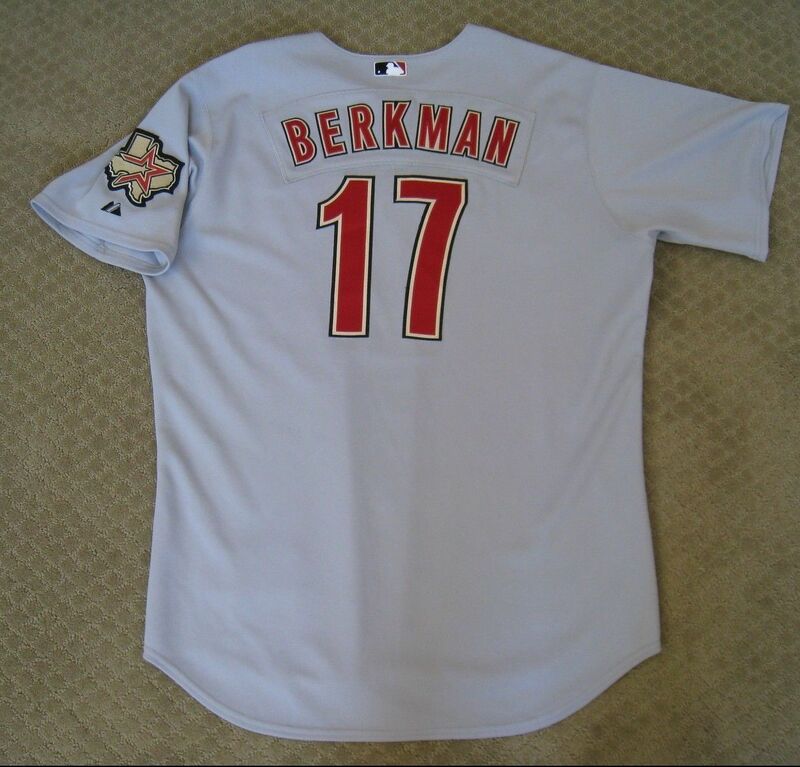 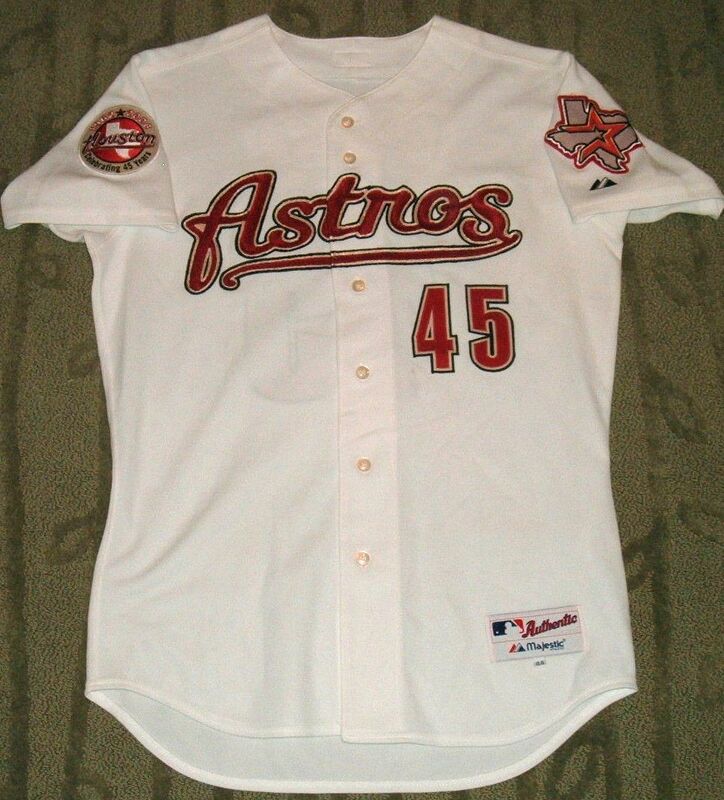 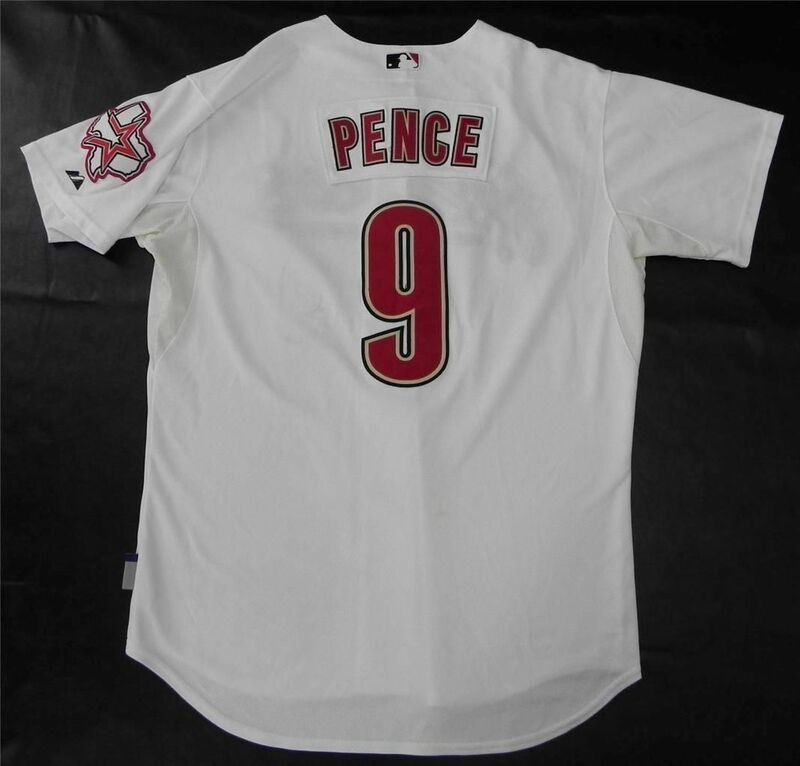 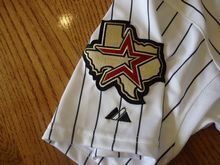 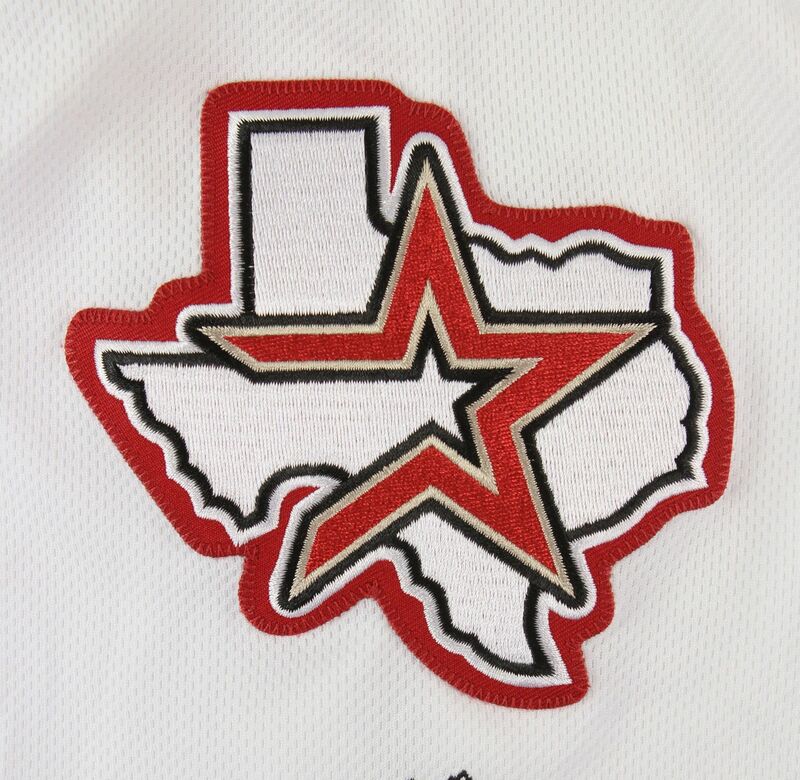 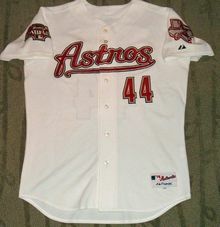 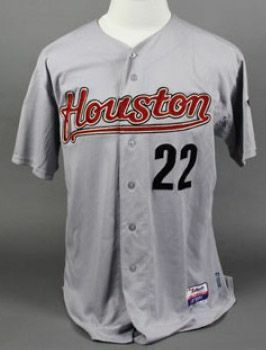 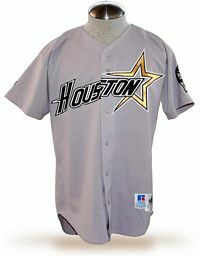 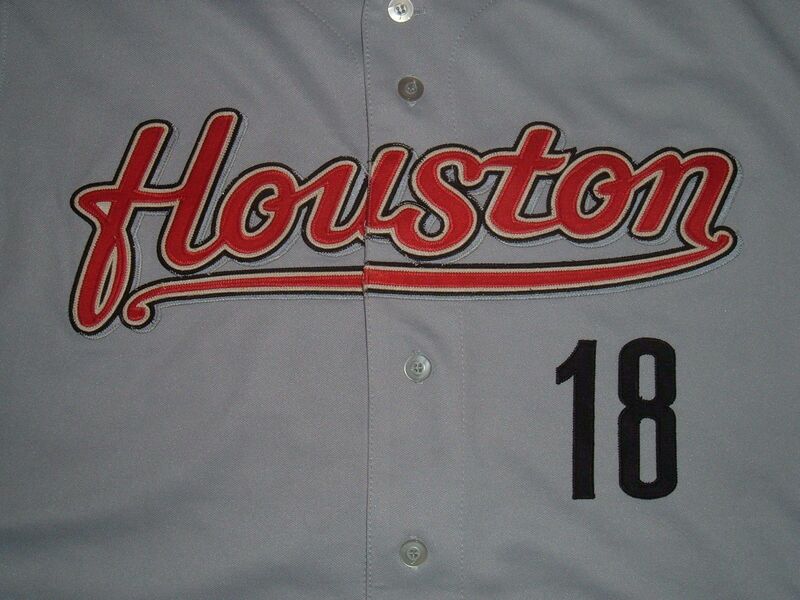 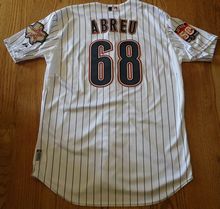 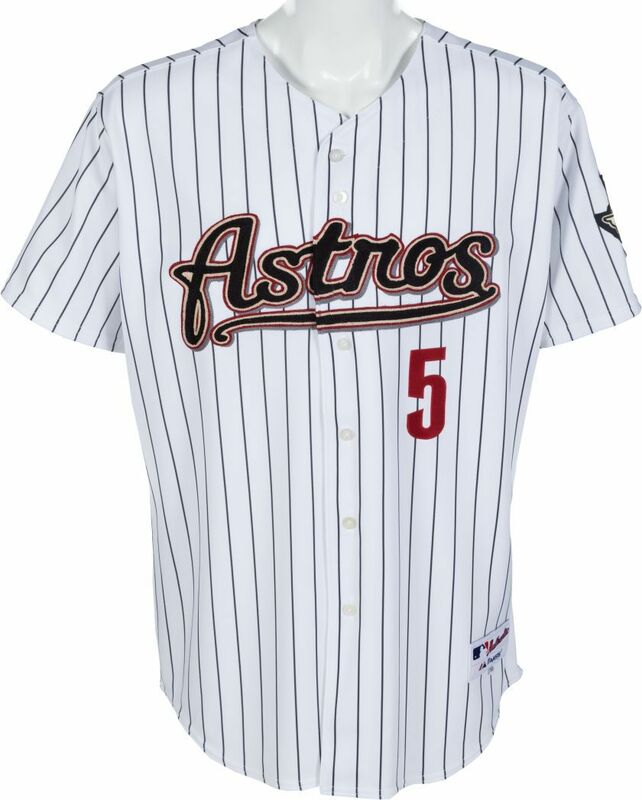 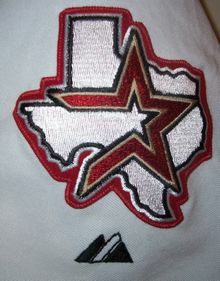 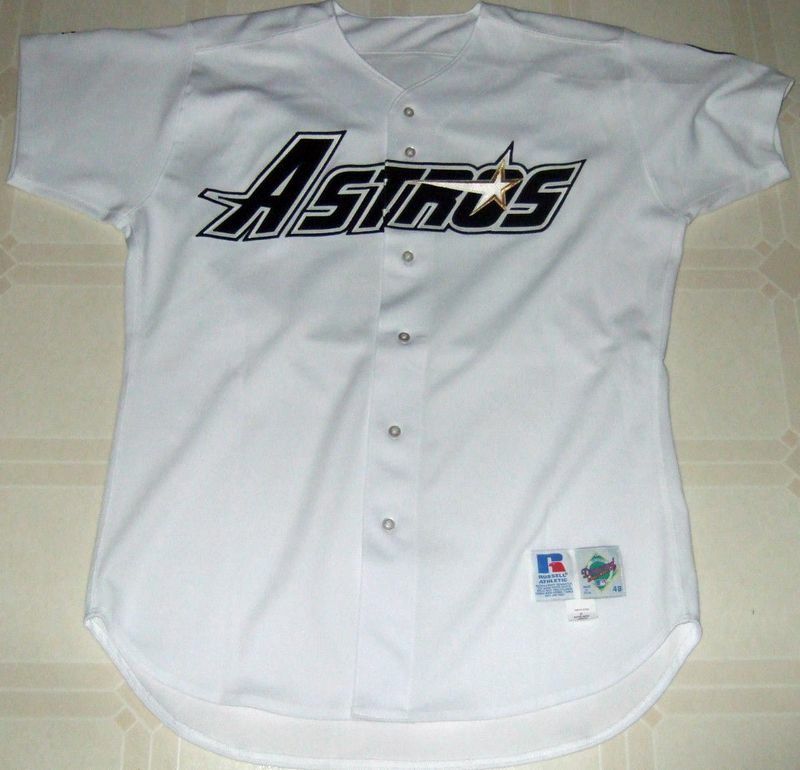 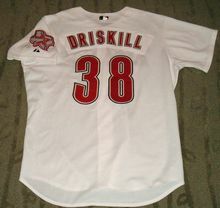 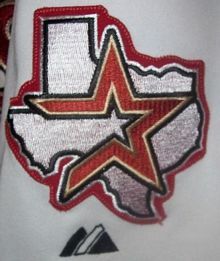 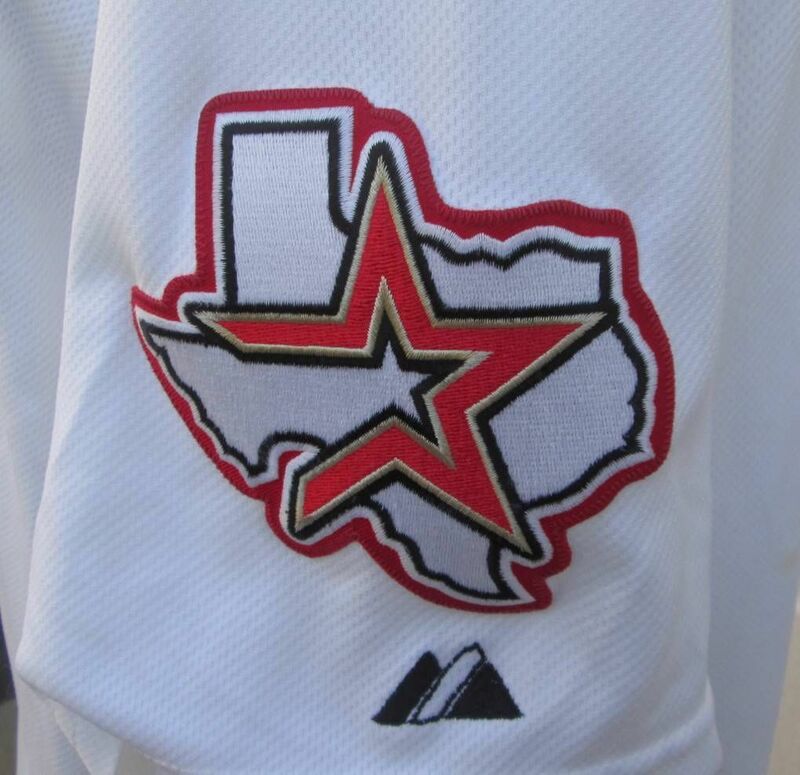 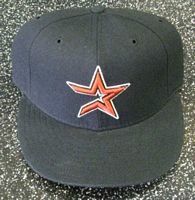 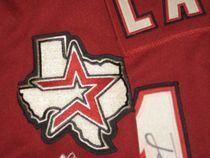 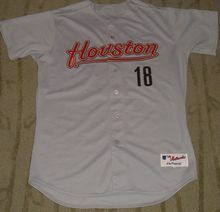 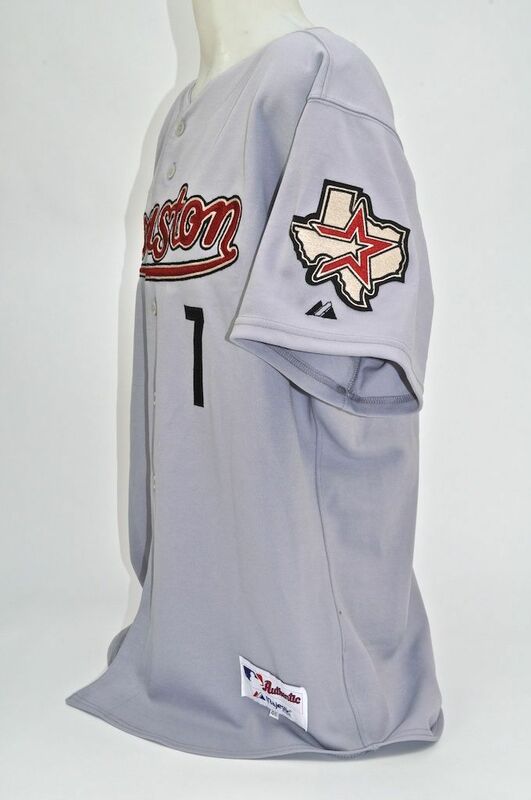 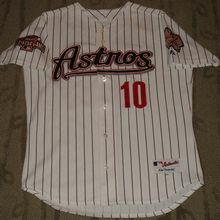 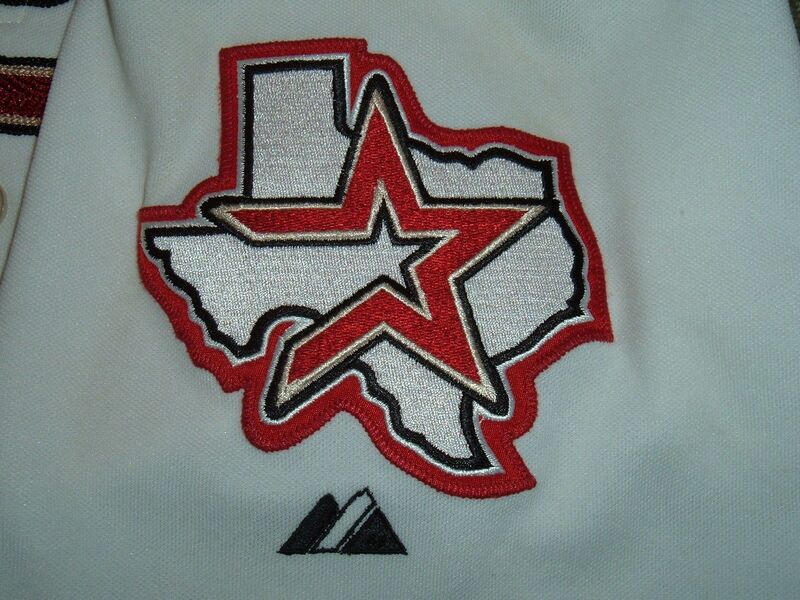 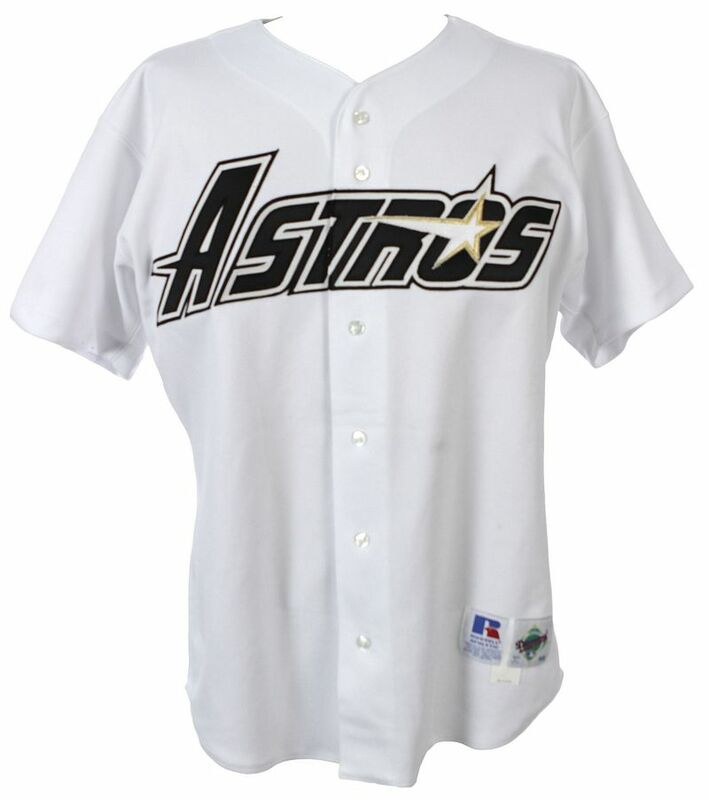 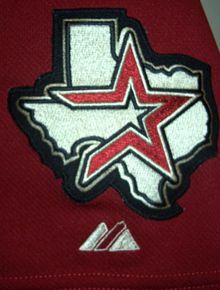 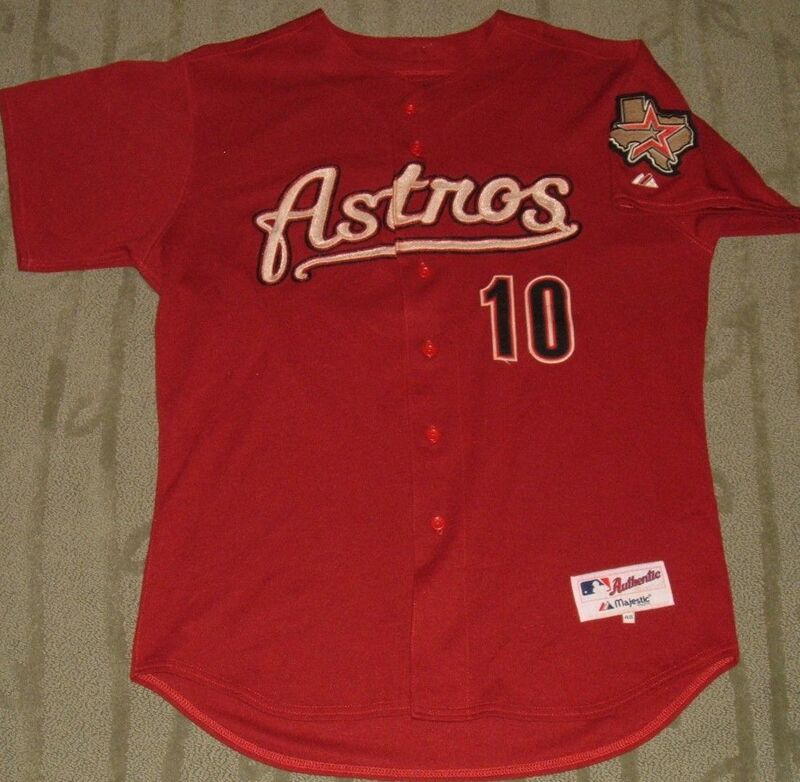 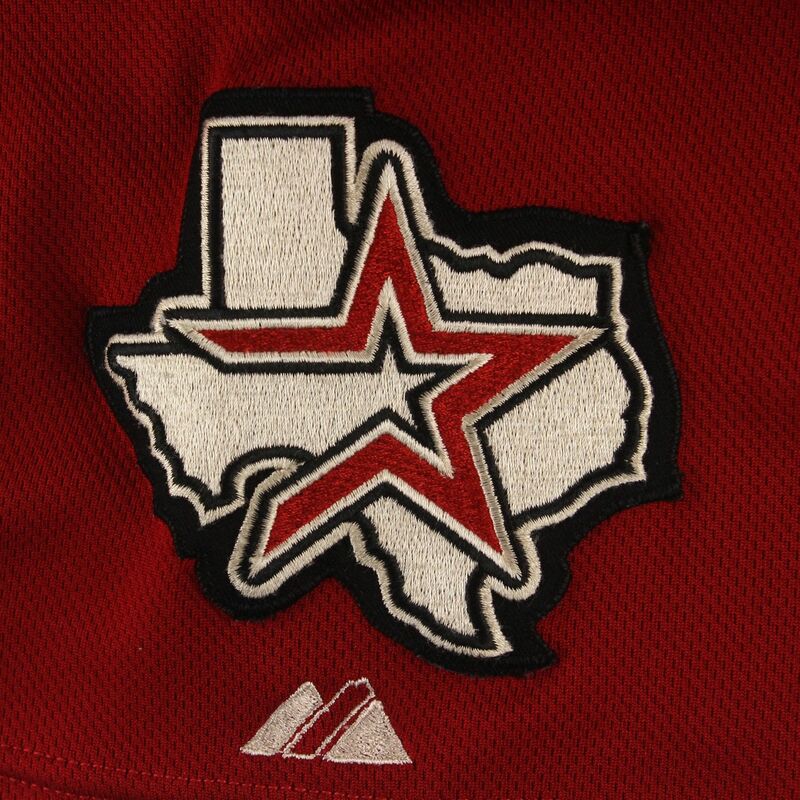 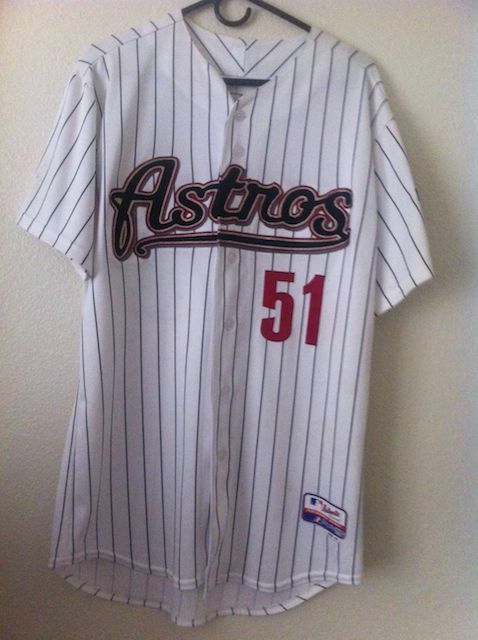 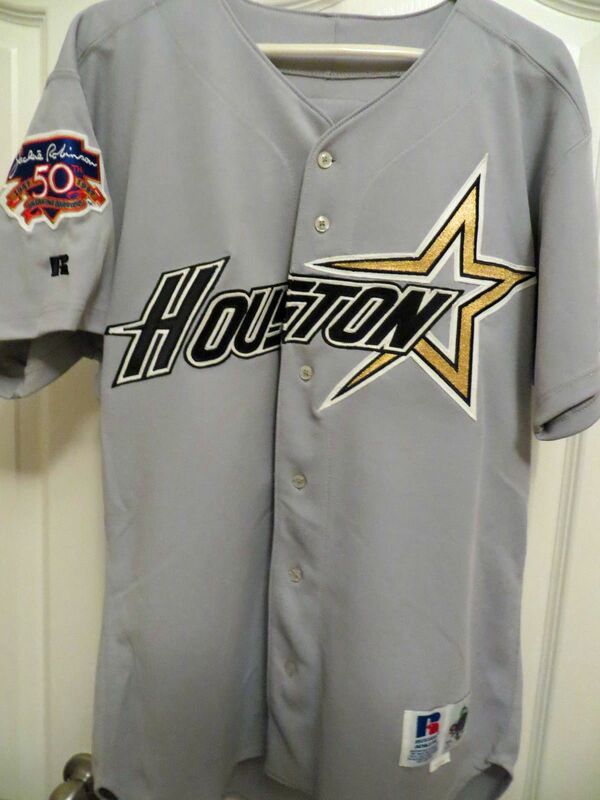 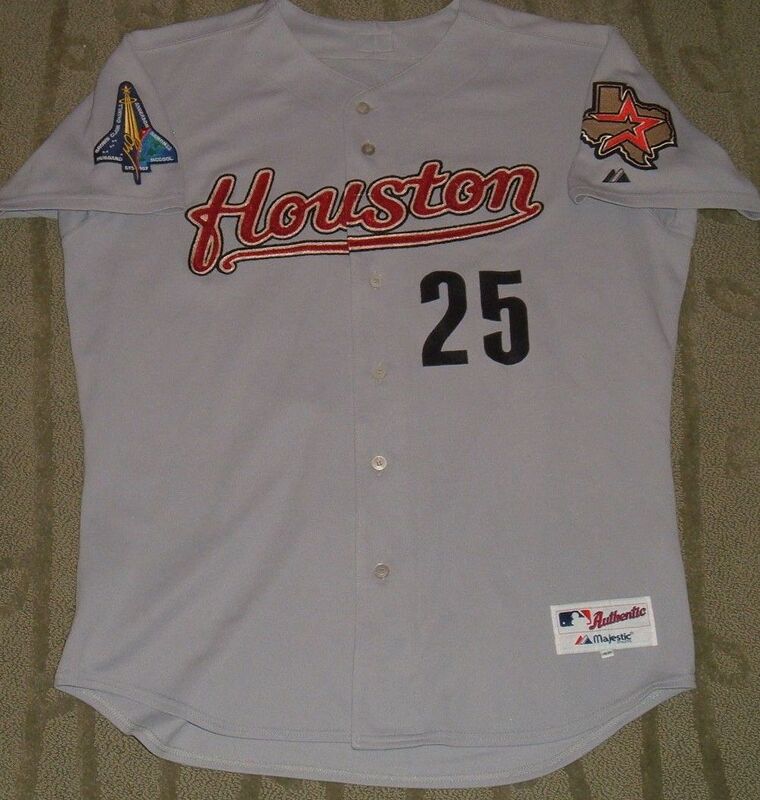 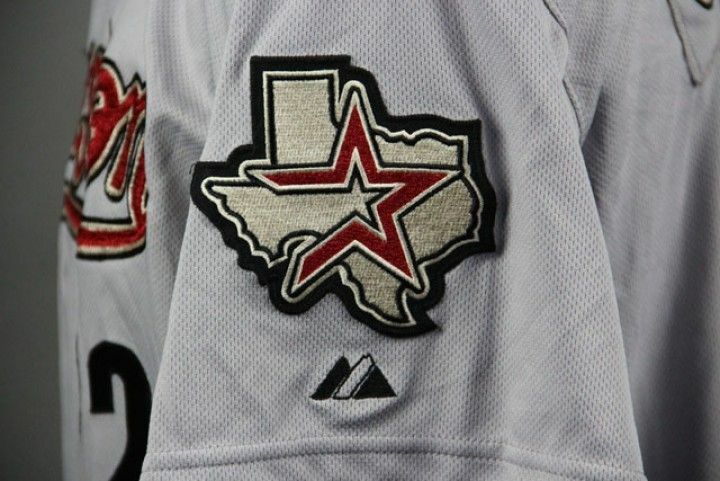 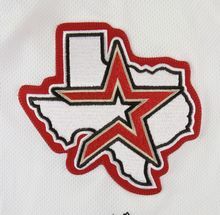 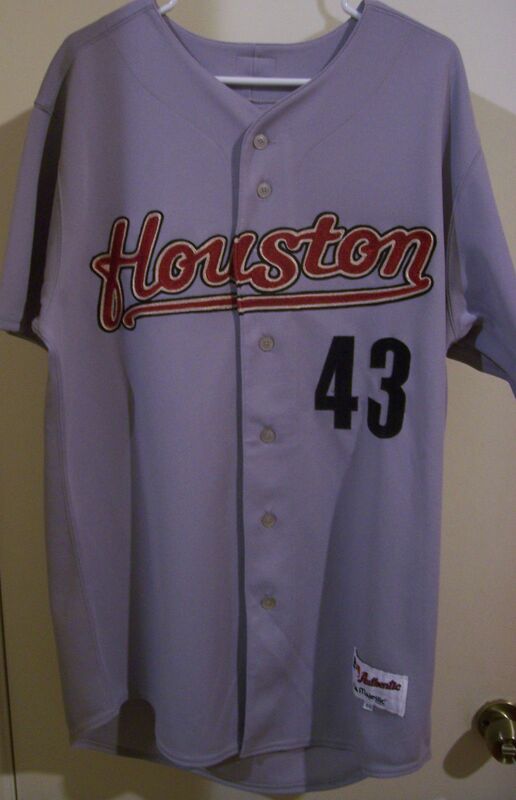 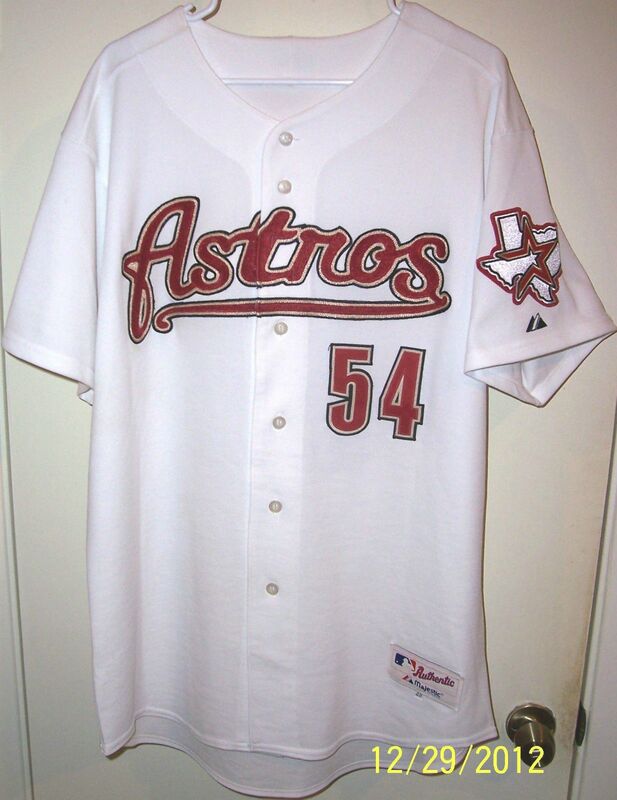 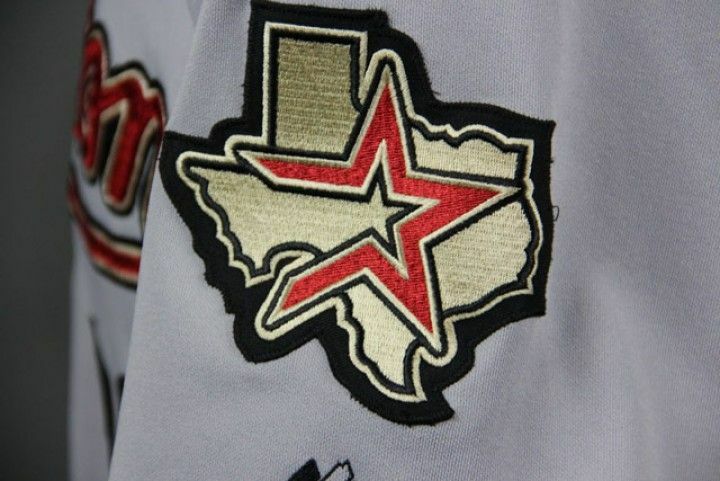 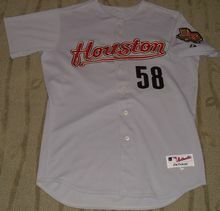 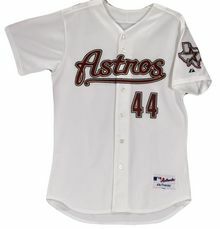 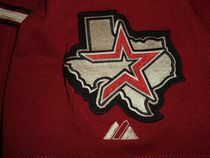 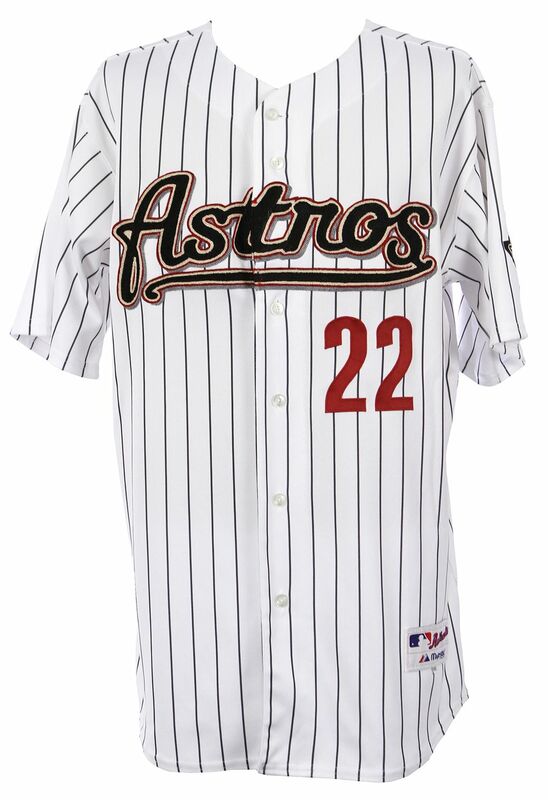 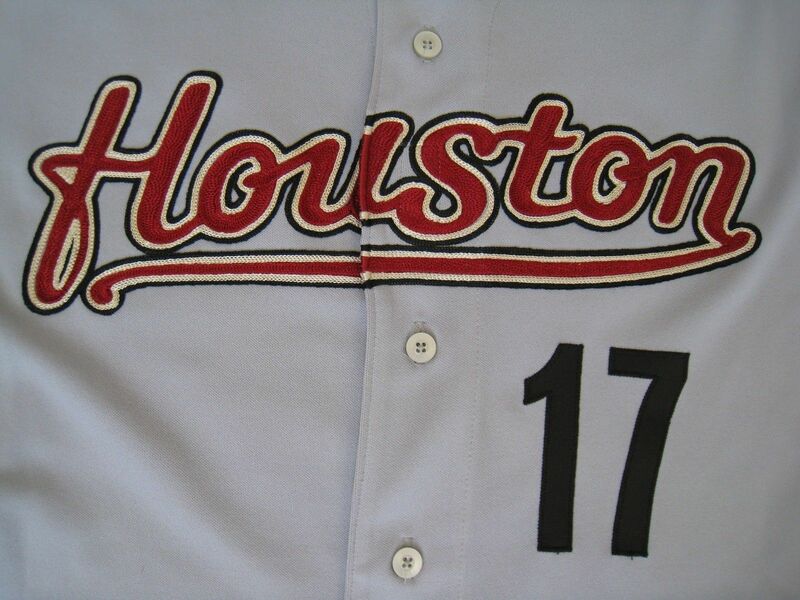 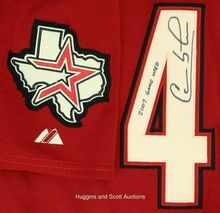 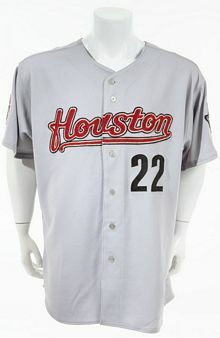 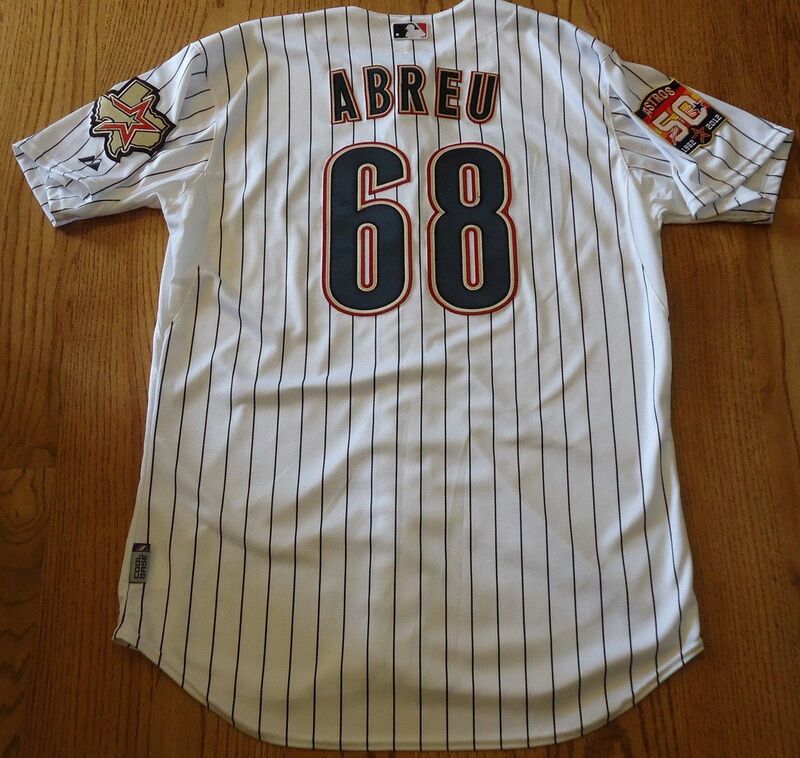 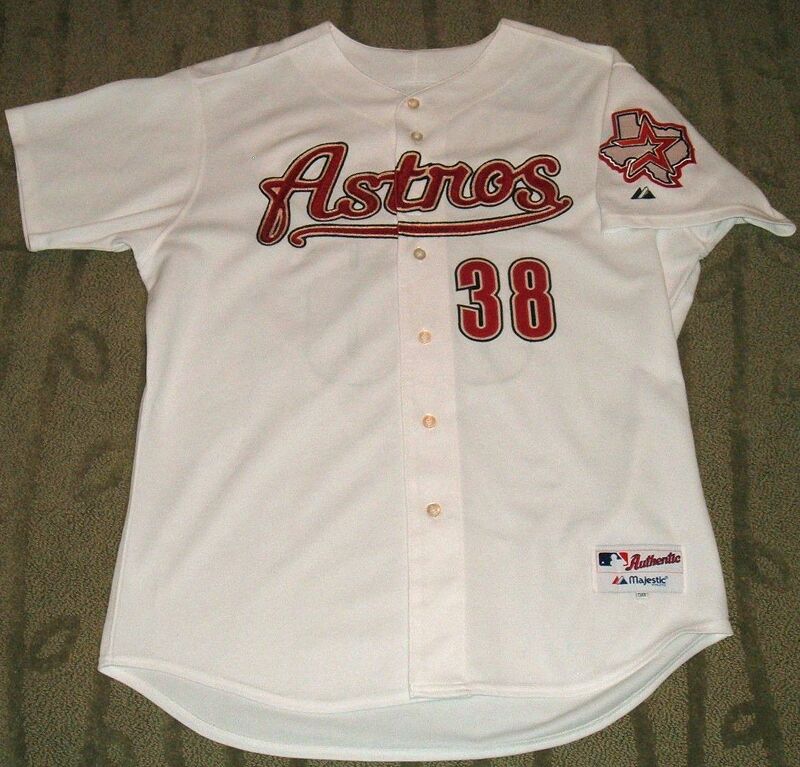 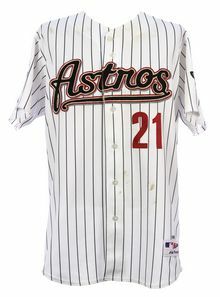 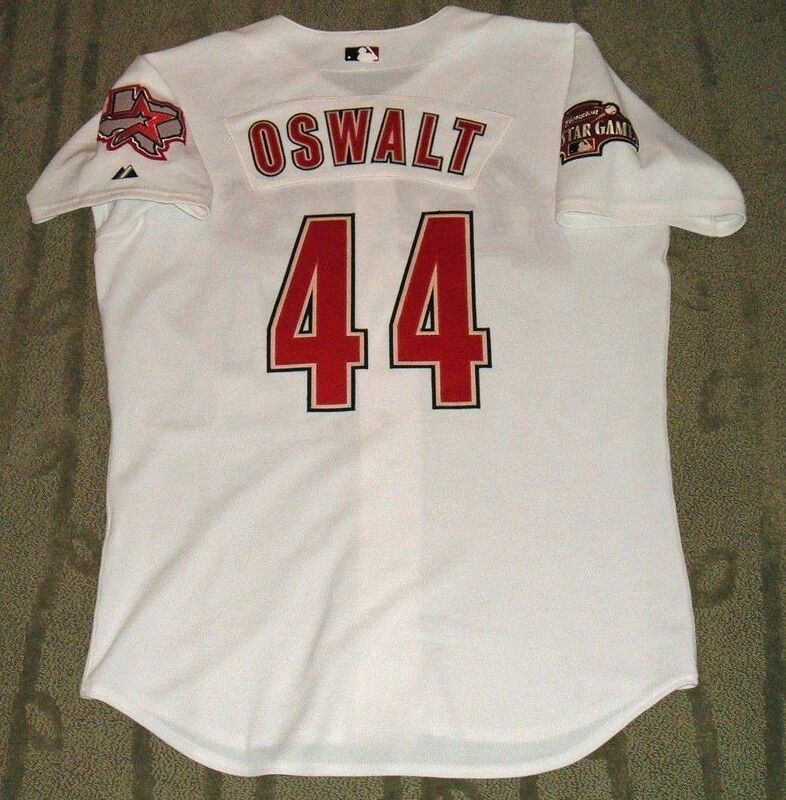 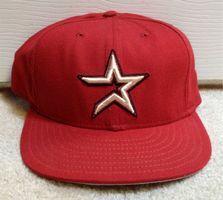 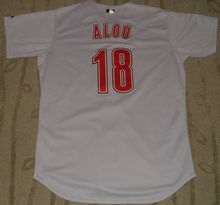 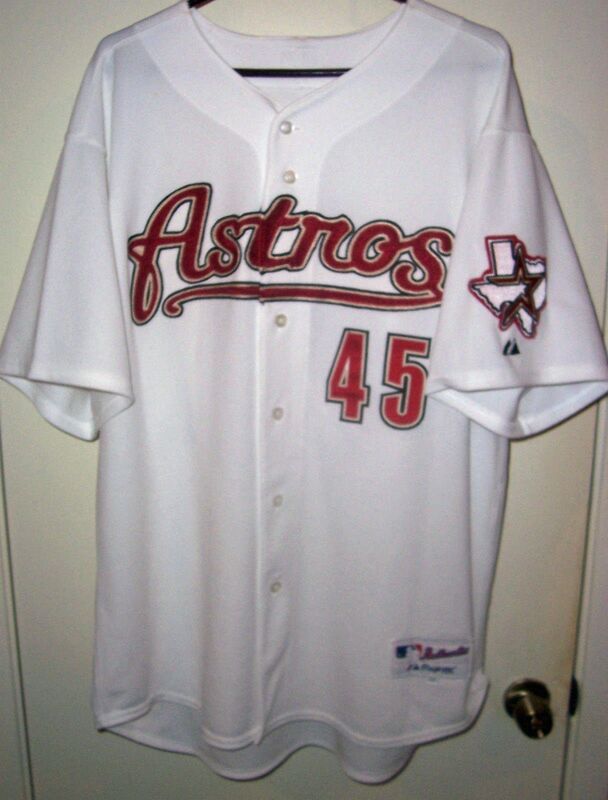 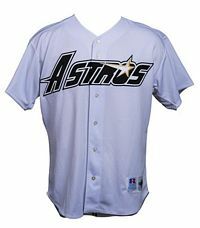 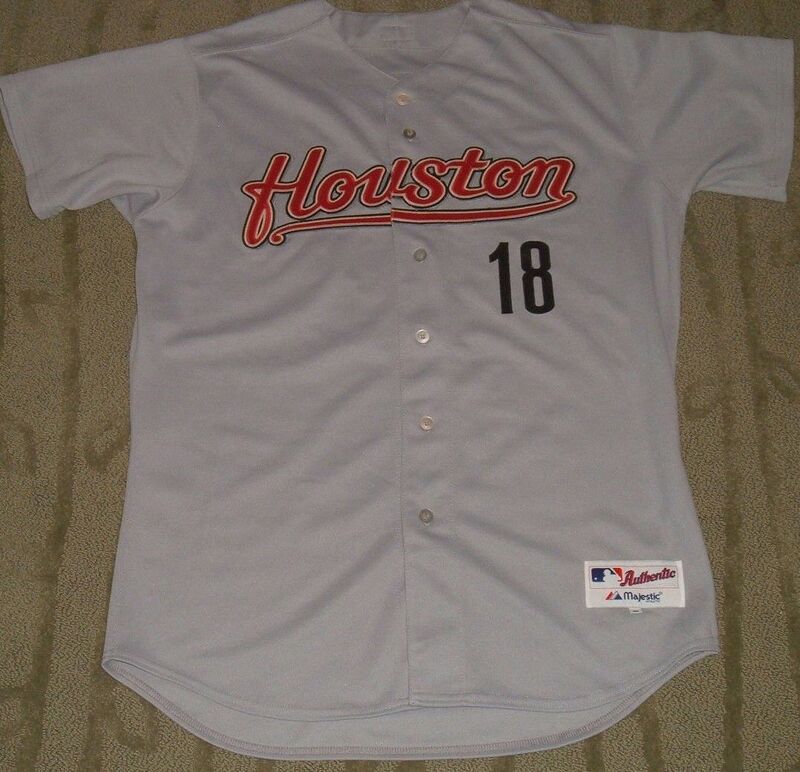 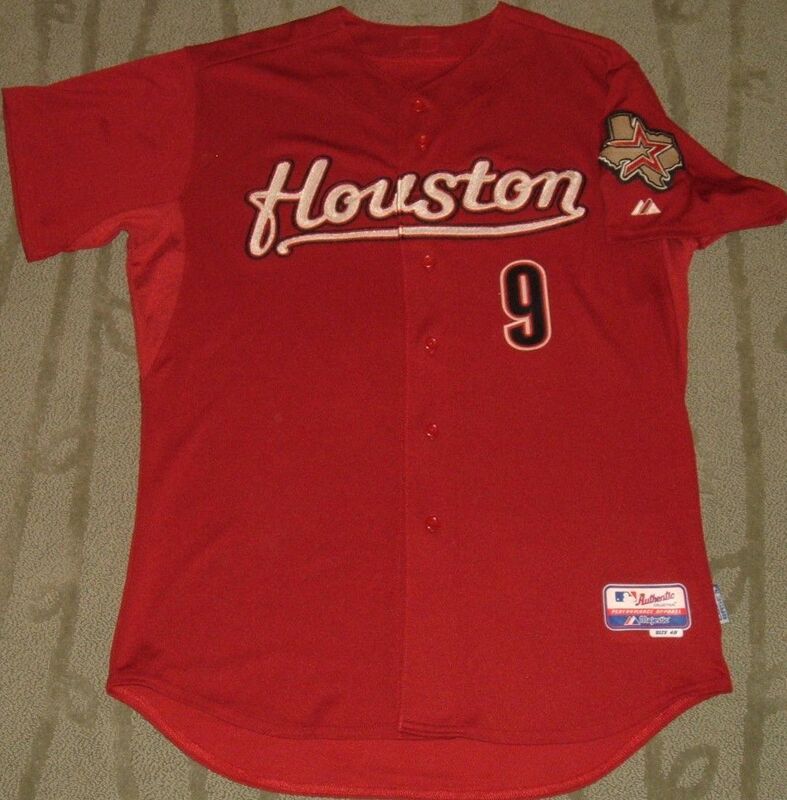 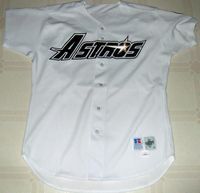 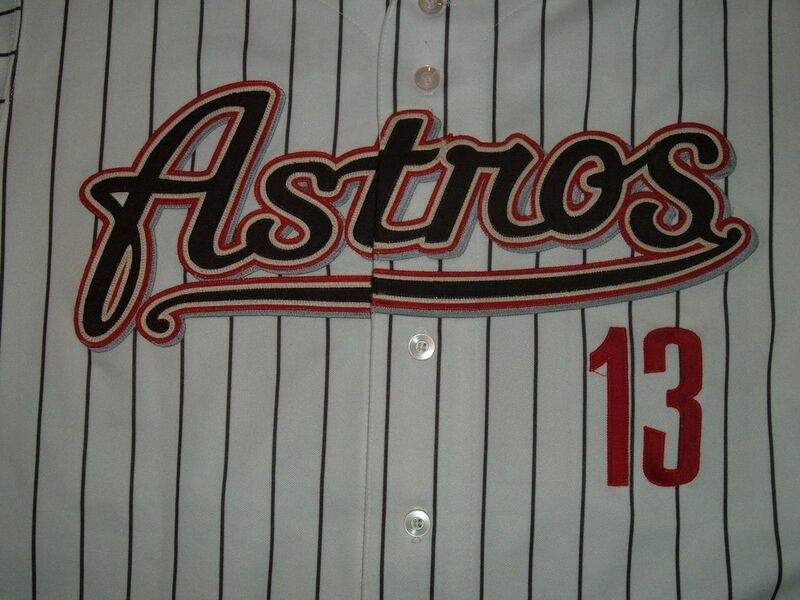 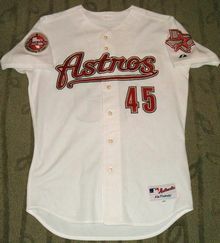 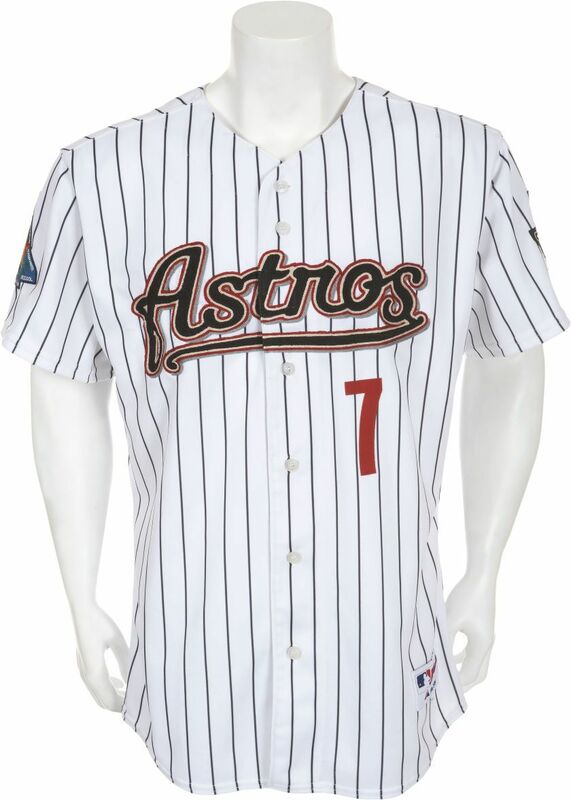 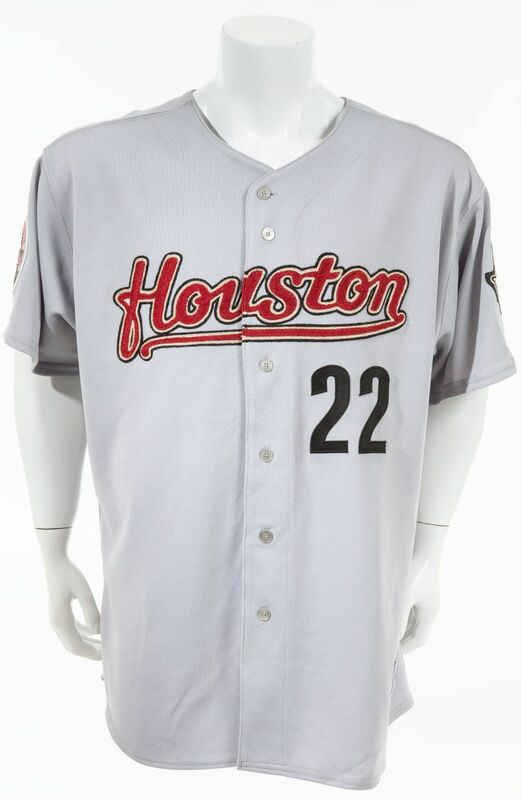 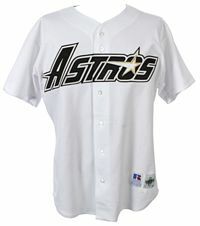 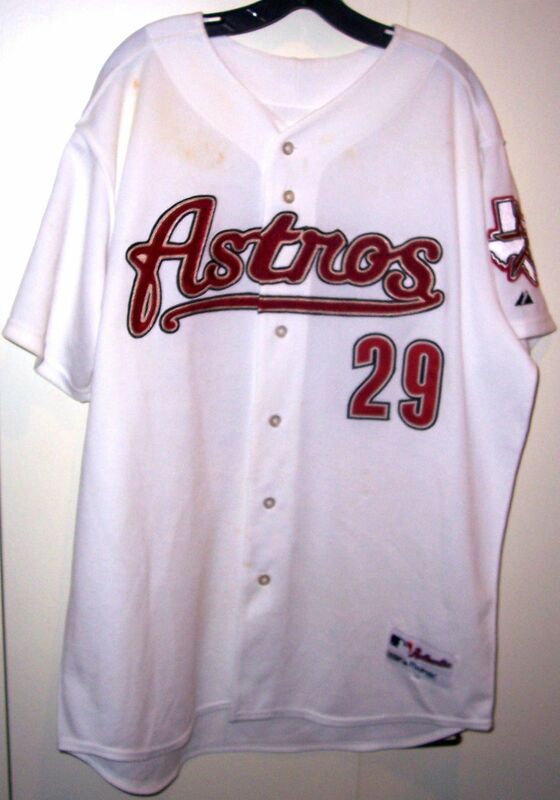 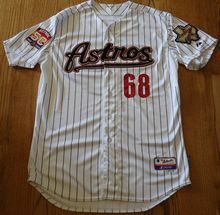 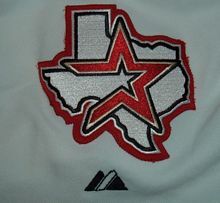 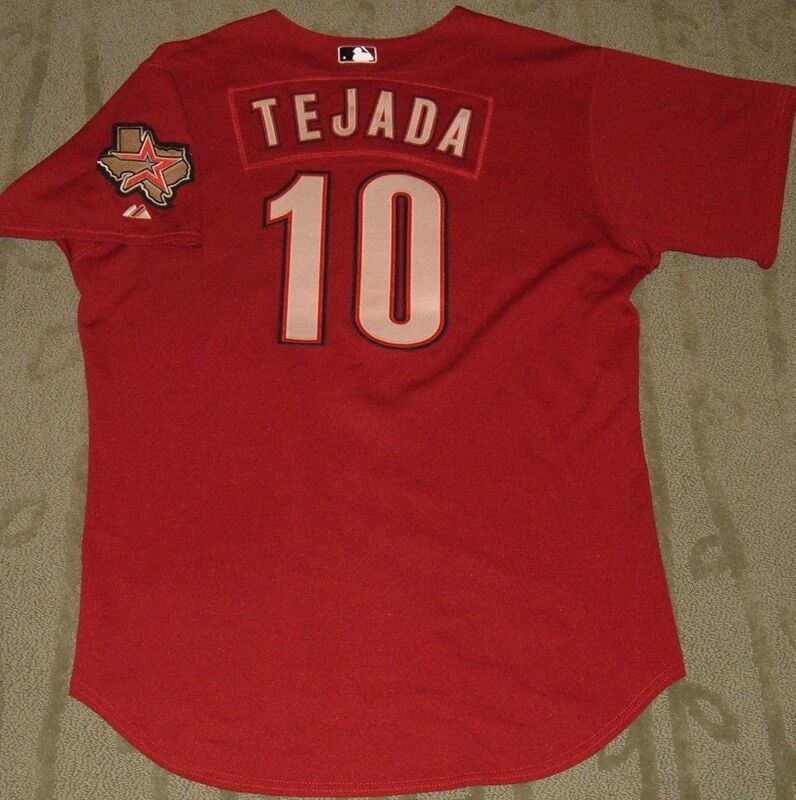 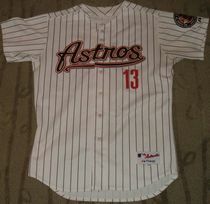 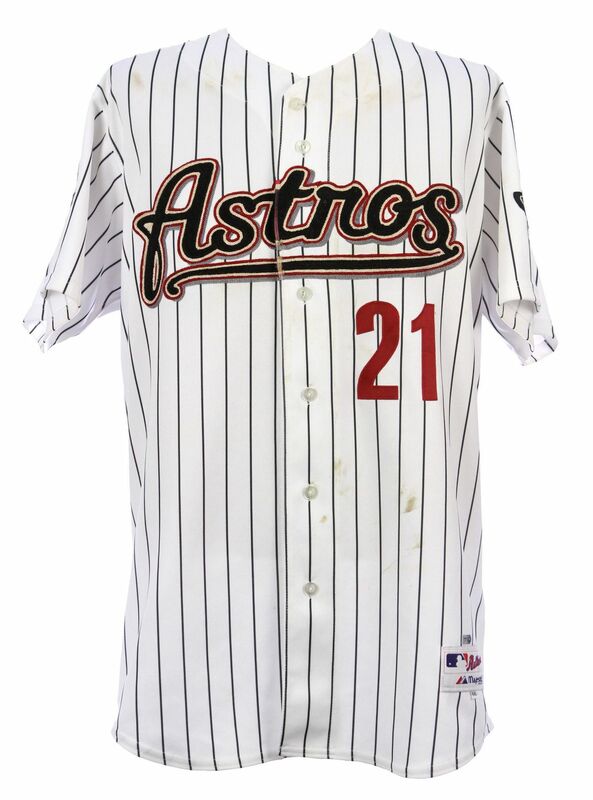 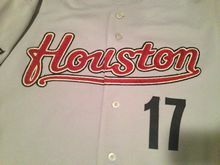 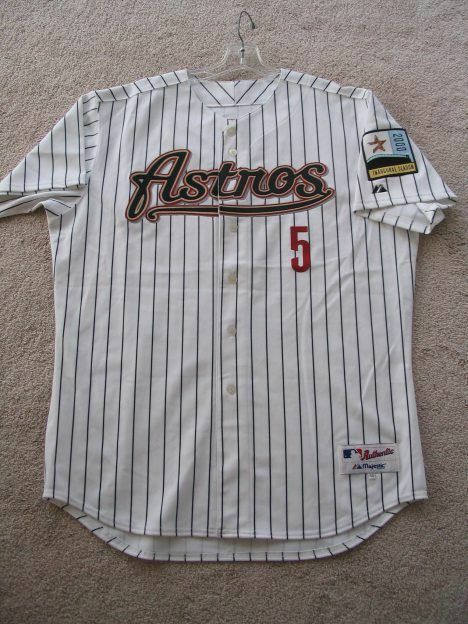 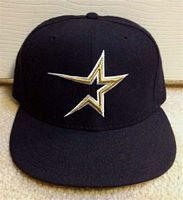 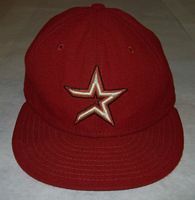 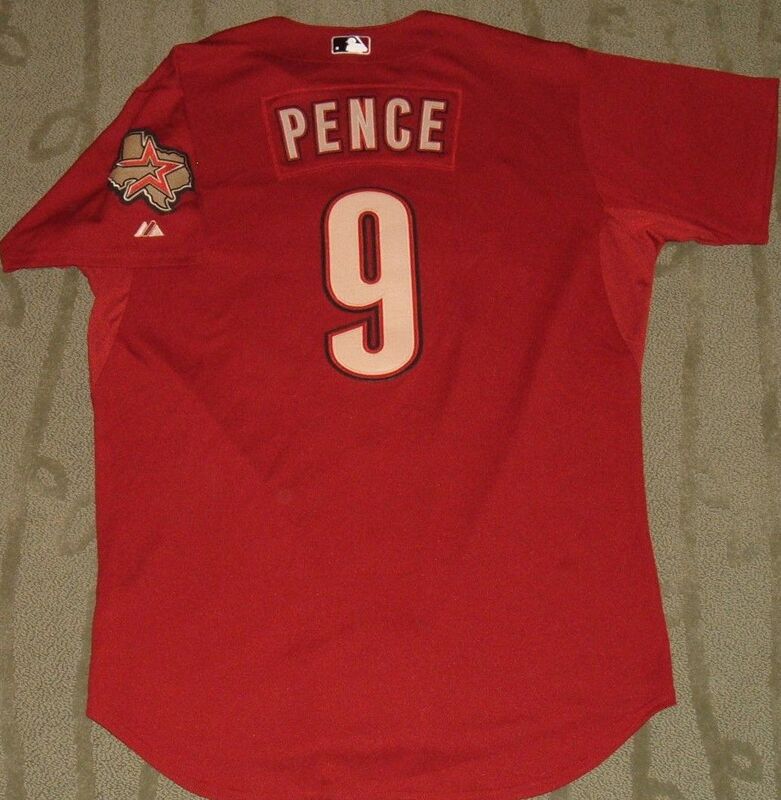 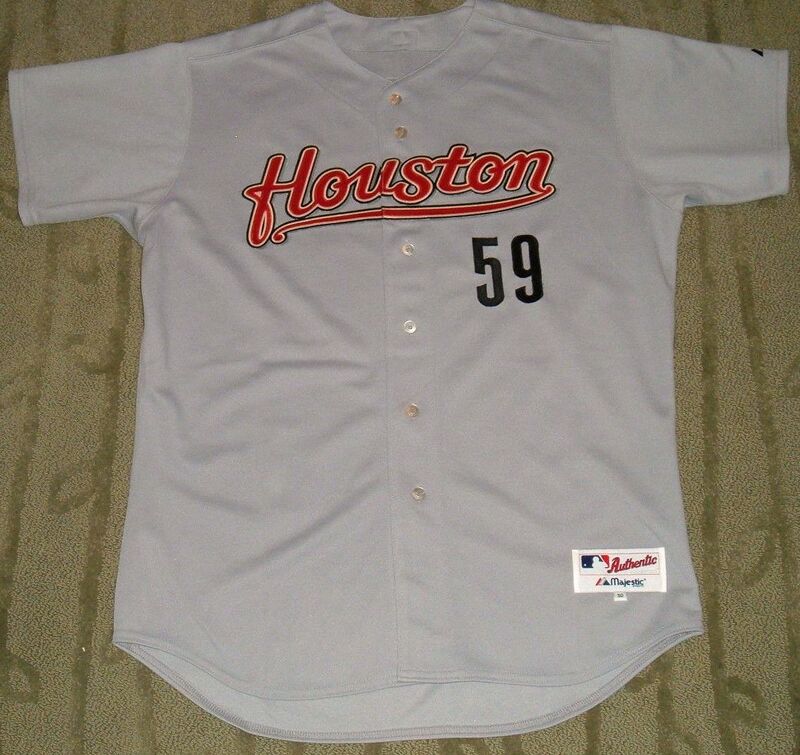 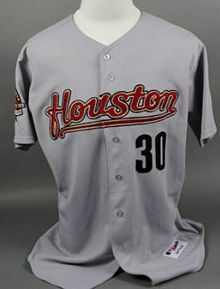 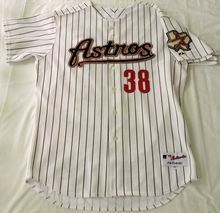 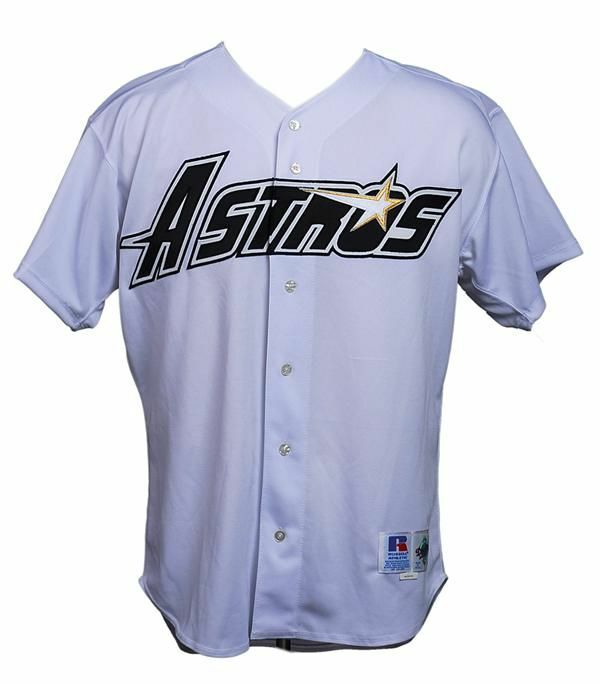 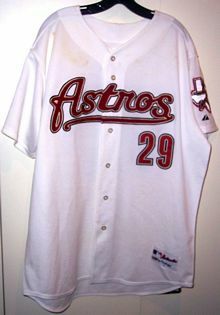 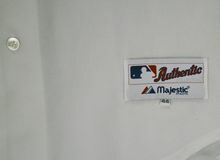 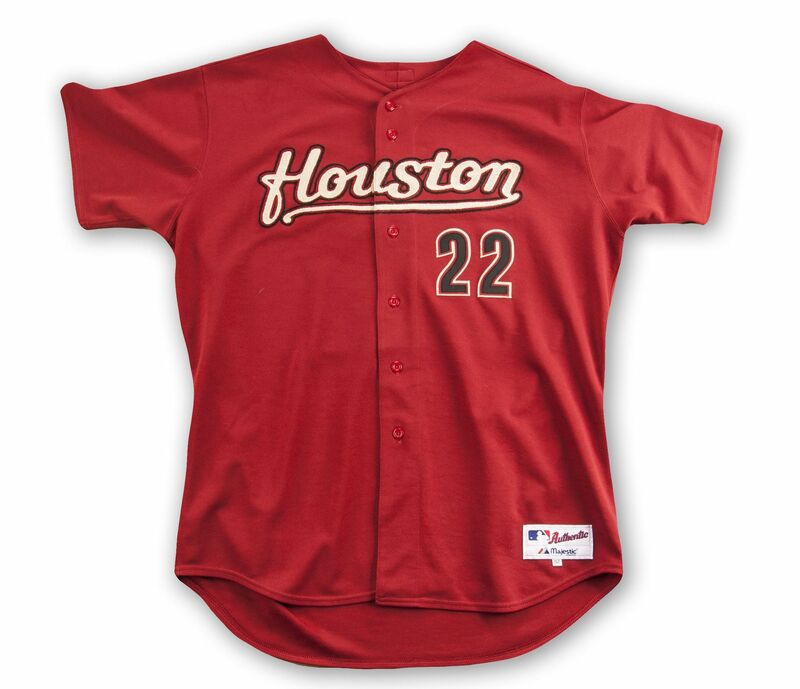 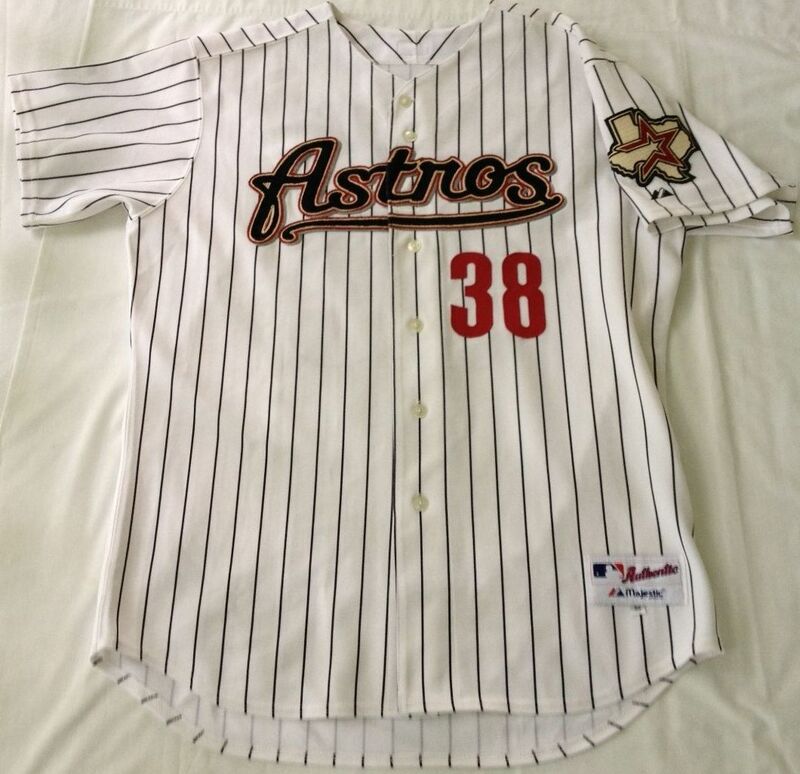 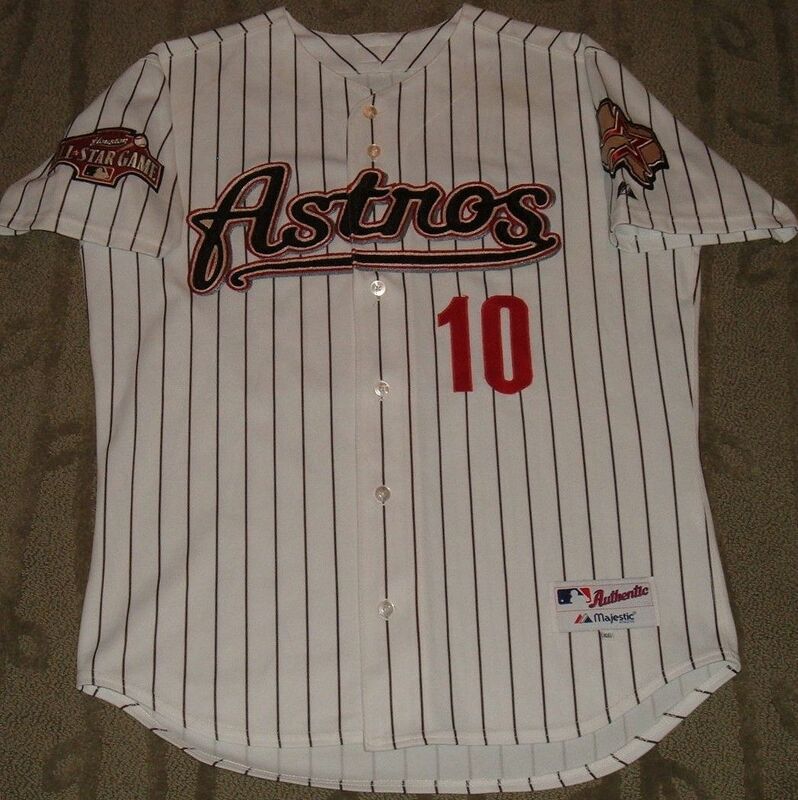 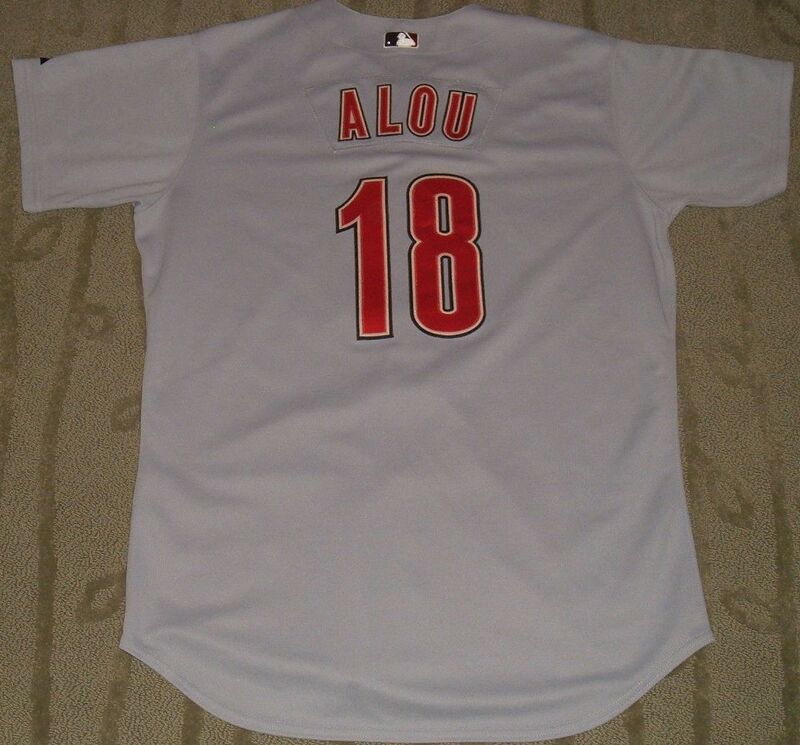 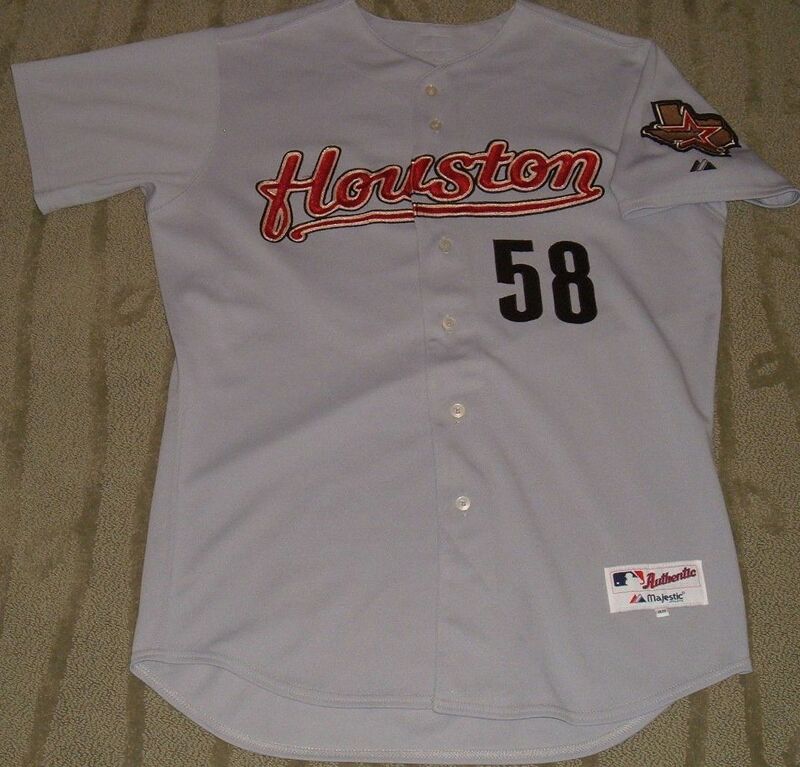 Home white alternate jersey star logo is replaced by "Astros" script. 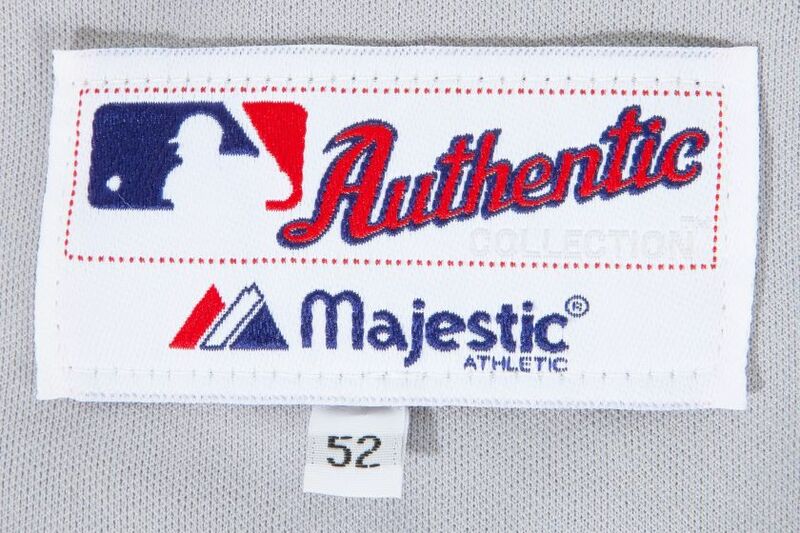 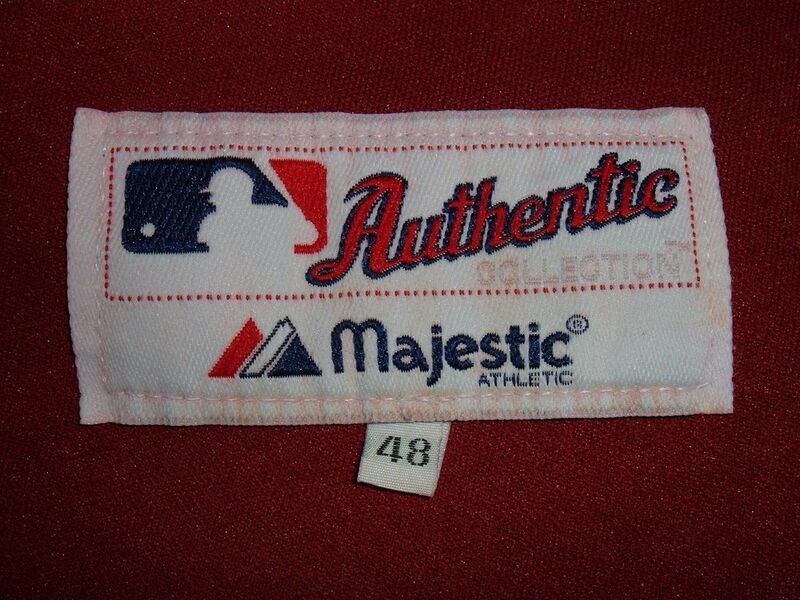 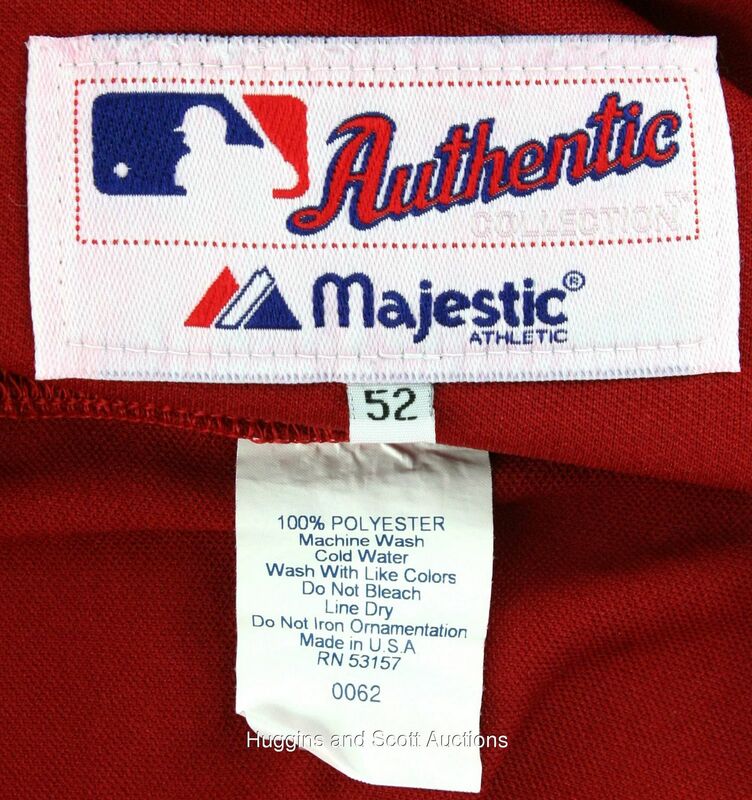 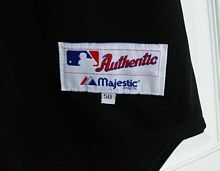 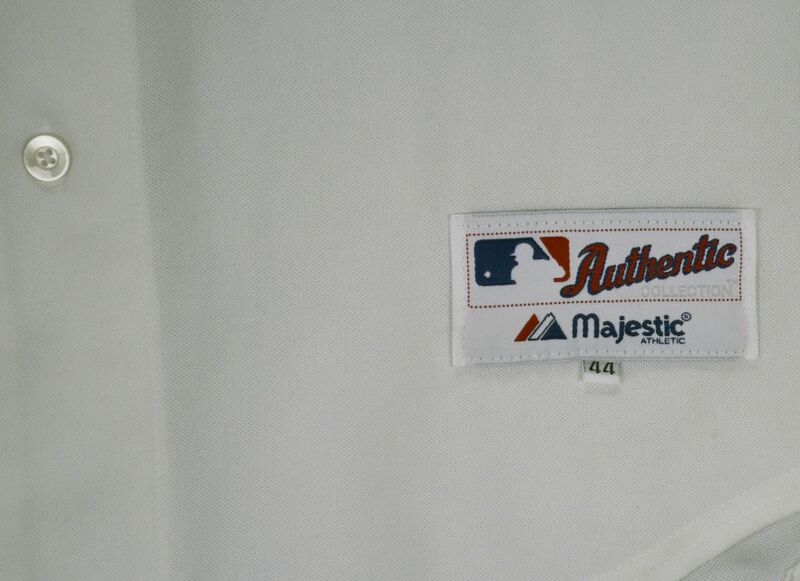 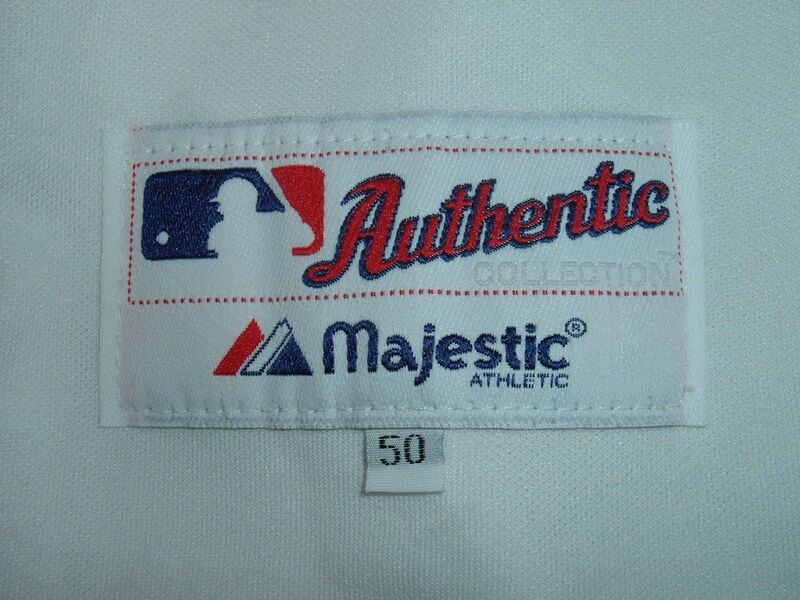 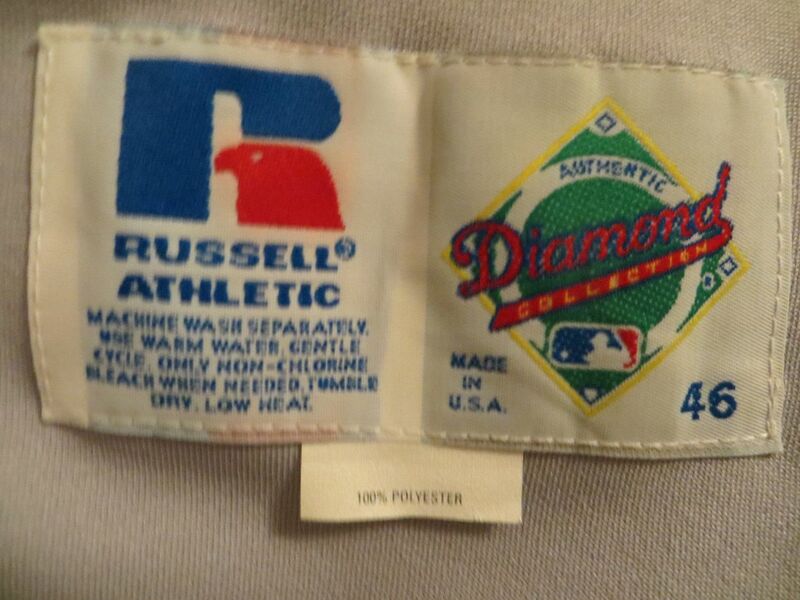 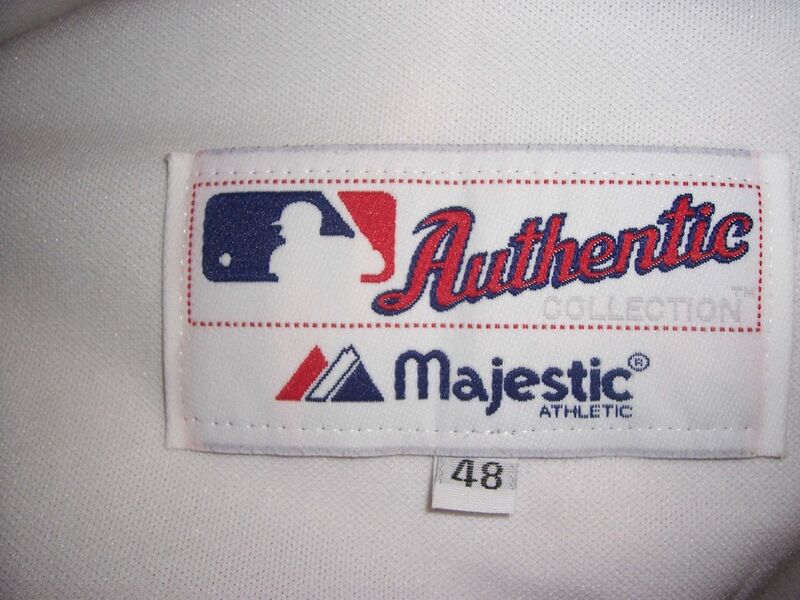 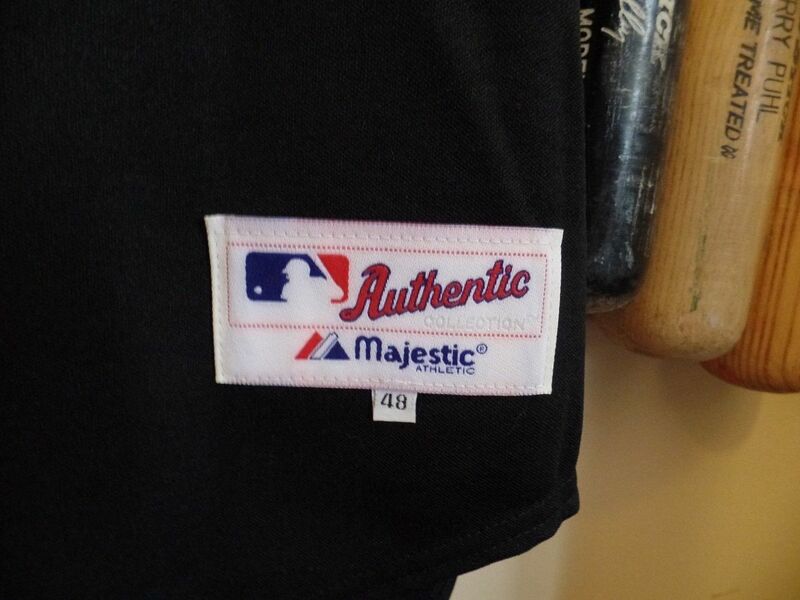 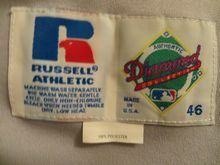 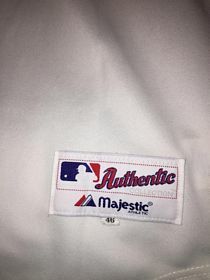 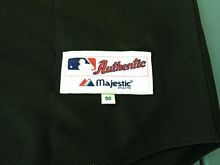 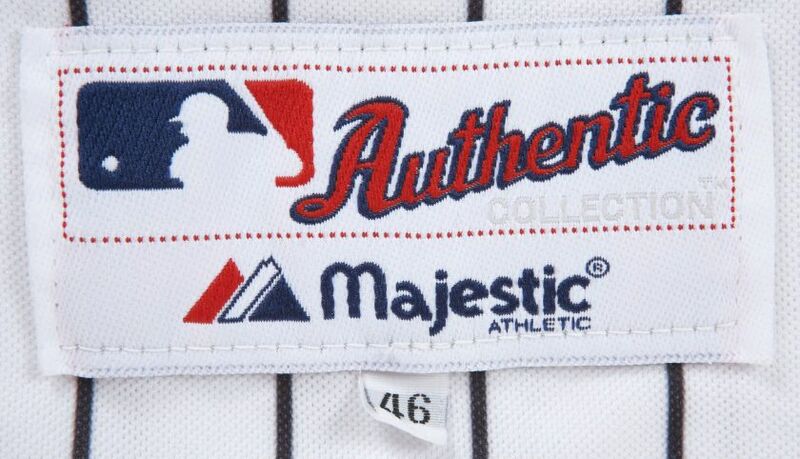 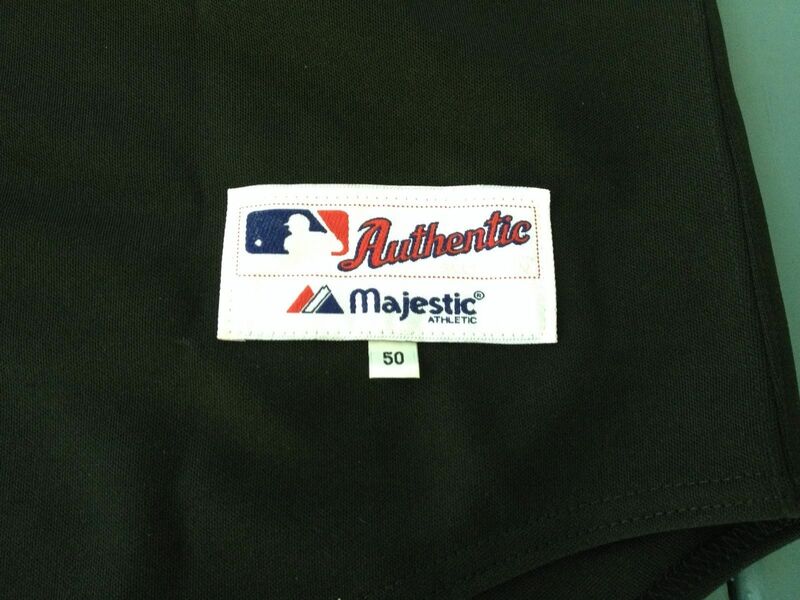 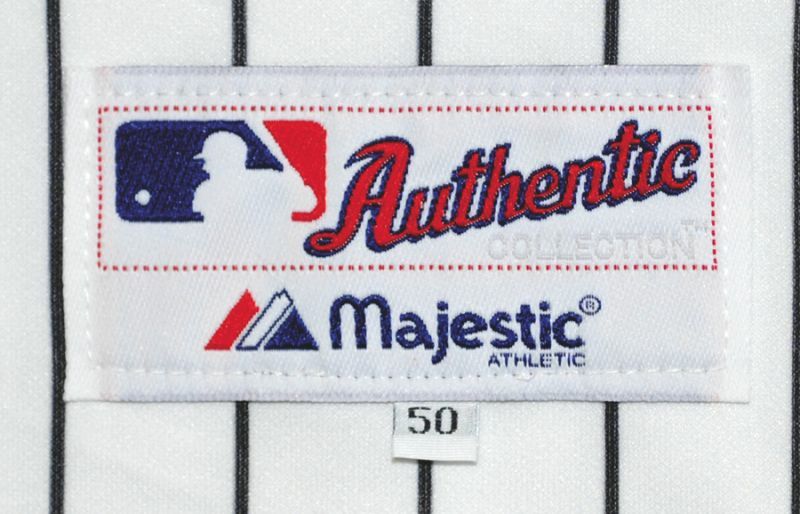 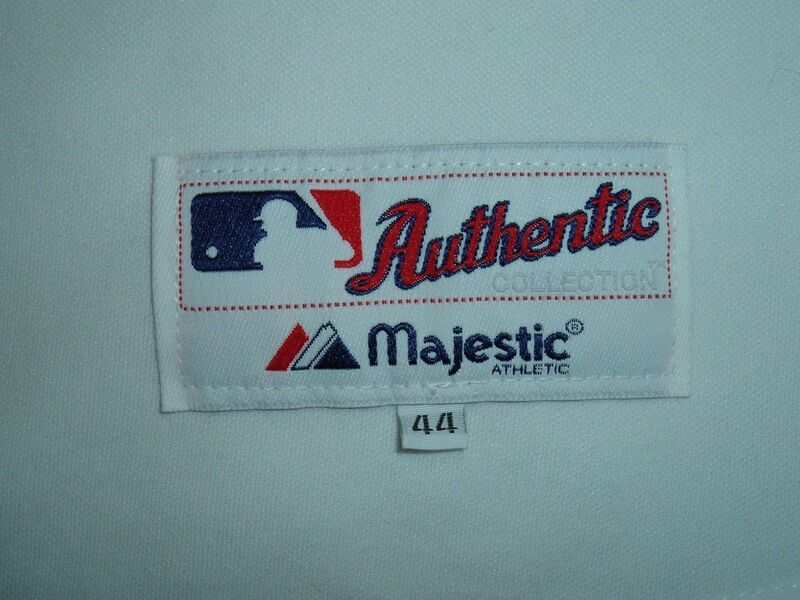 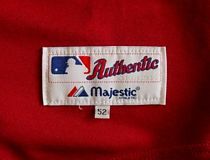 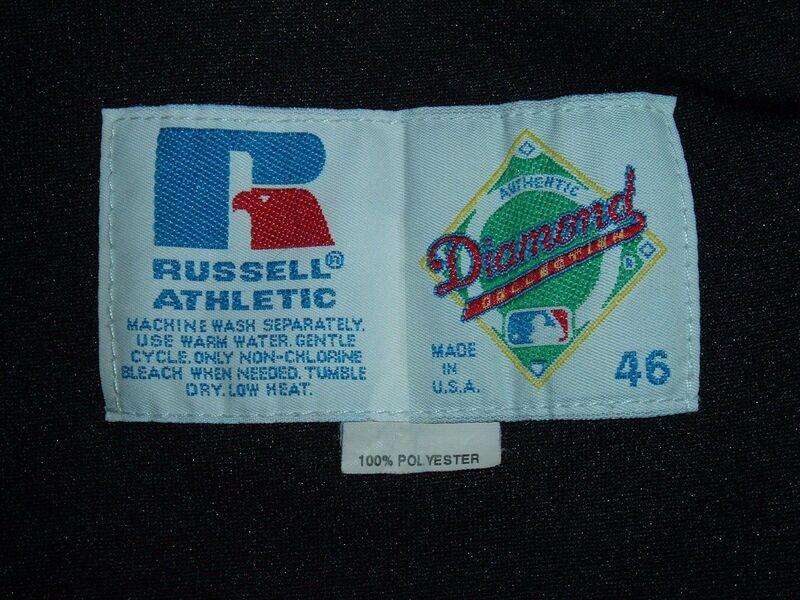 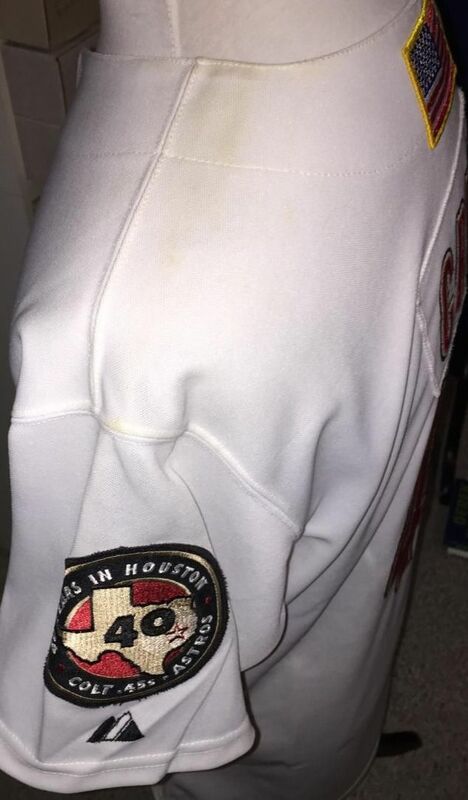 The logo is done in chainstitch. Texas sleeve patch is added to all jerseys. 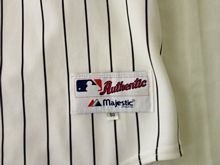 This is a retail shirt, not a gamer. 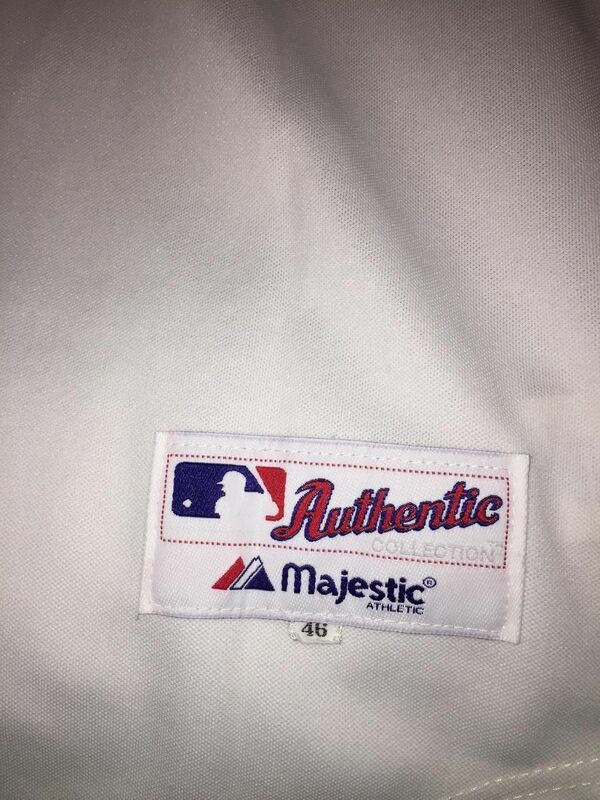 Aside from the fake year tag it's the same model. 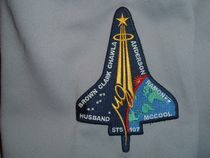 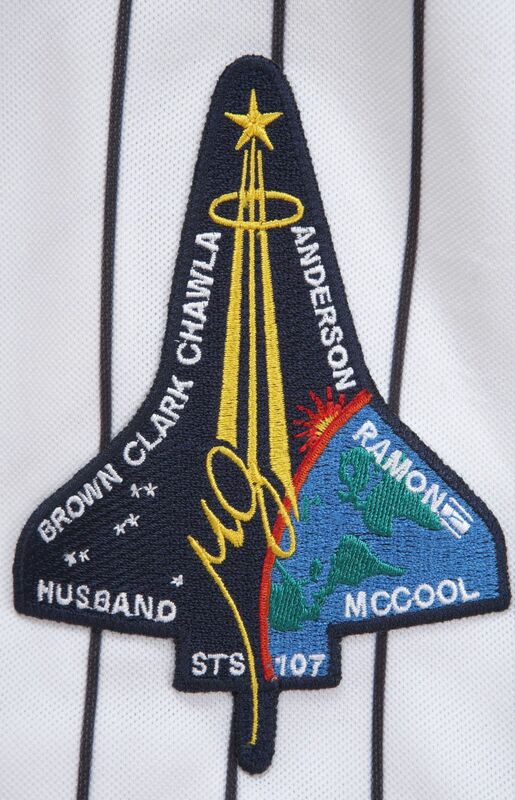 Space shuttle Columbia memorial patch added for 2003. 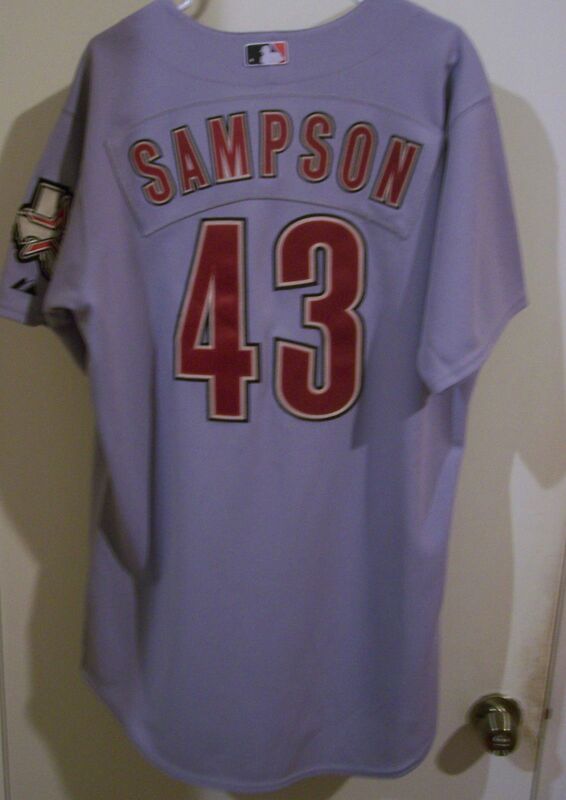 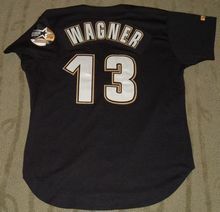 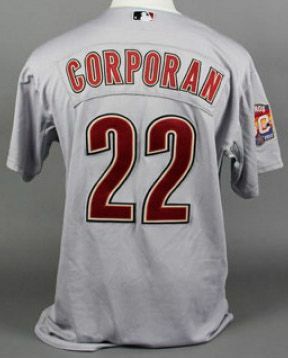 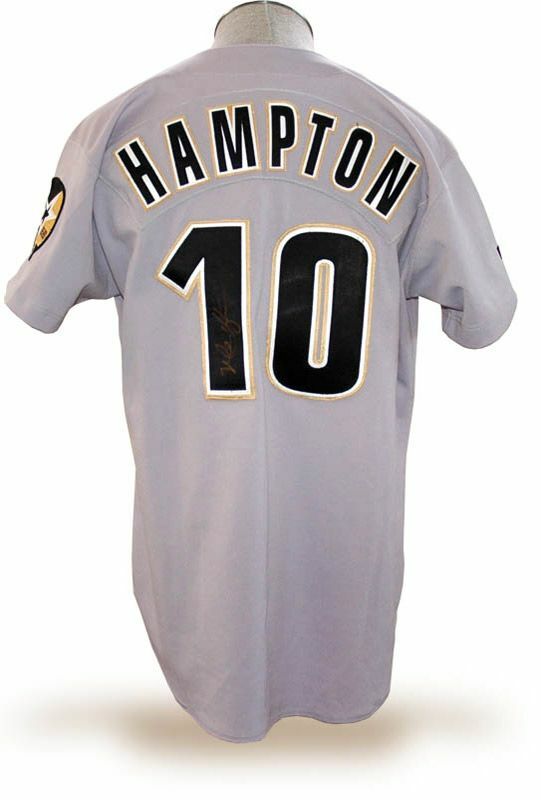 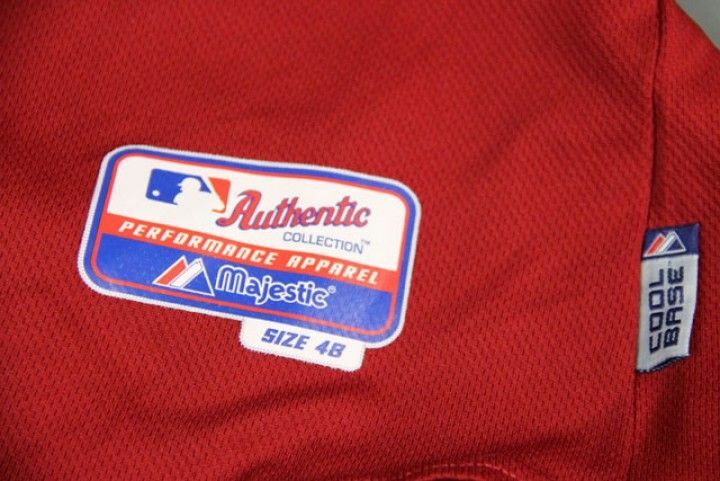 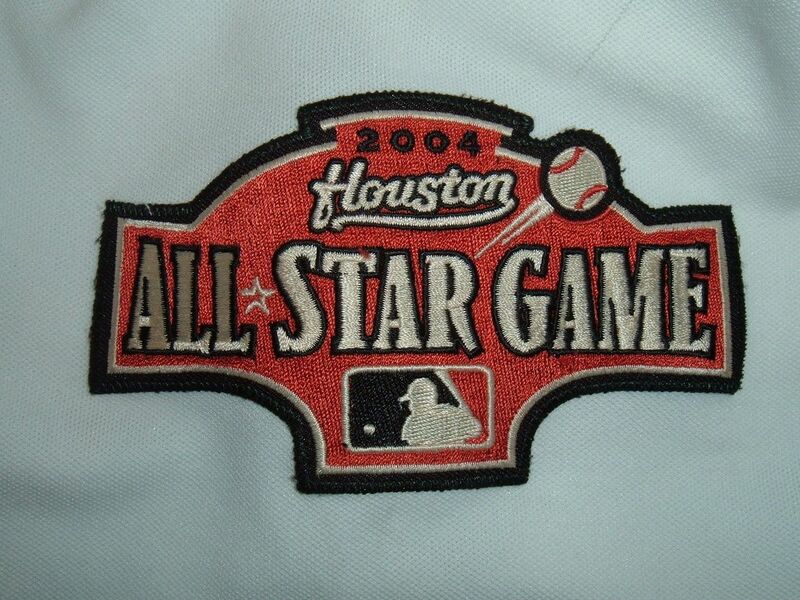 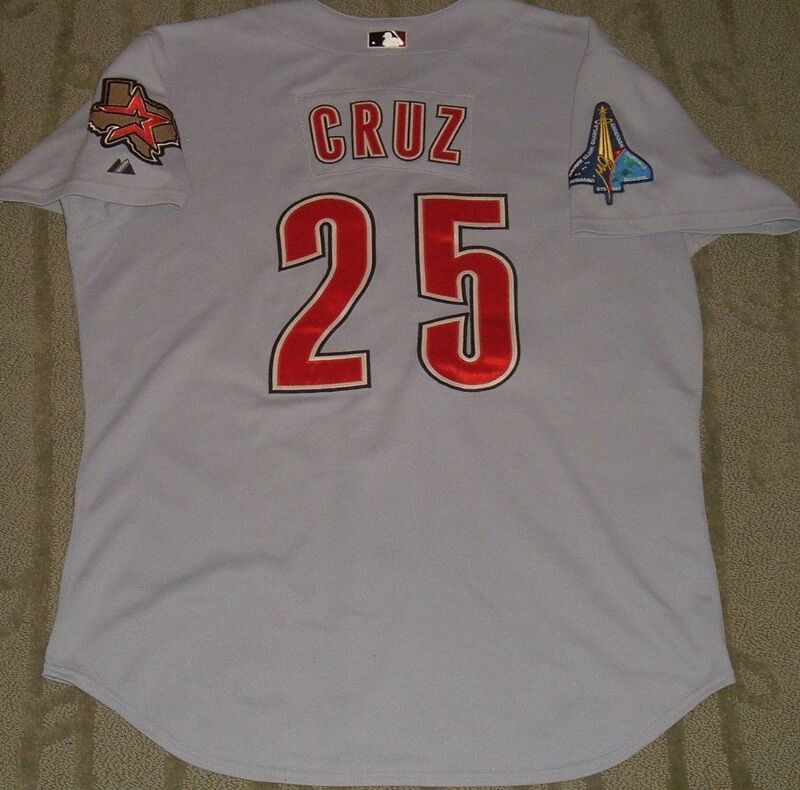 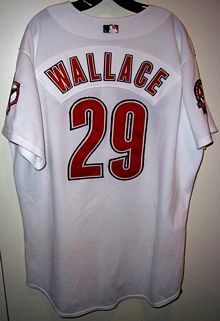 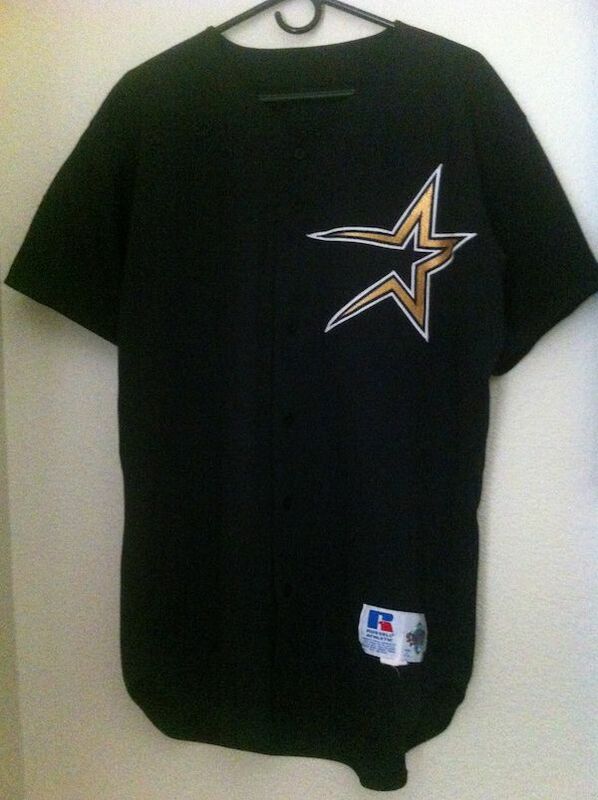 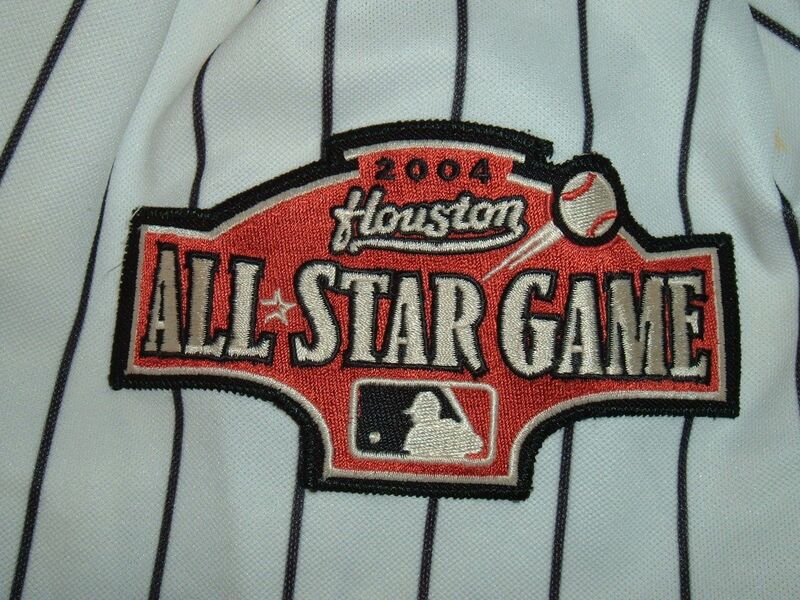 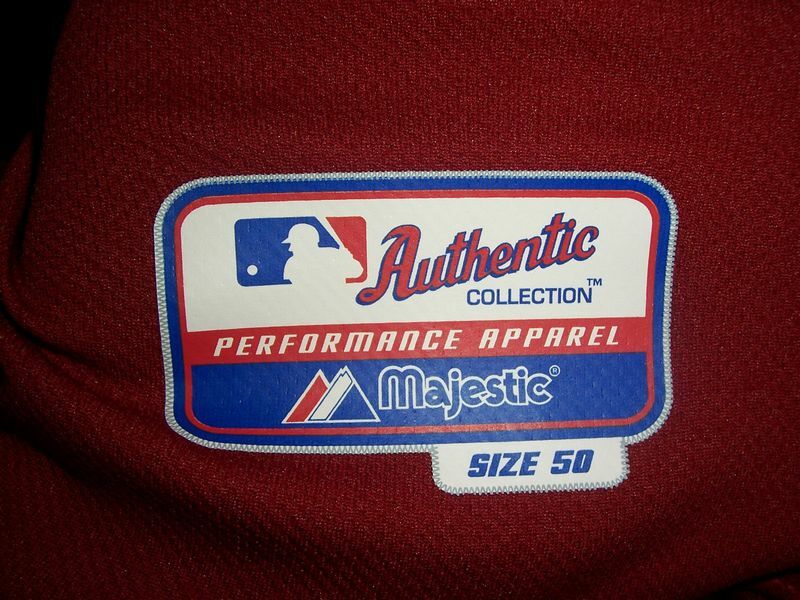 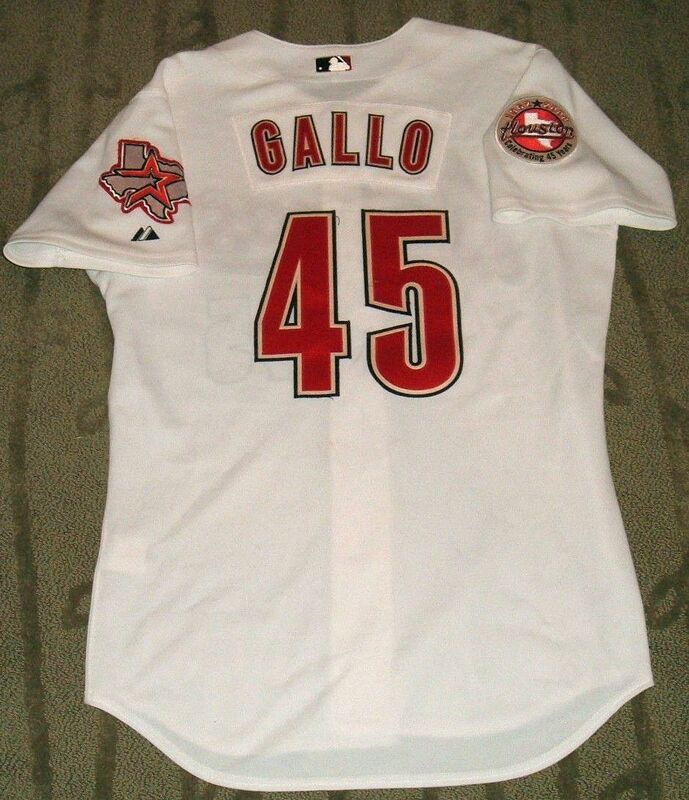 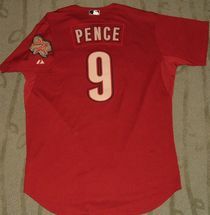 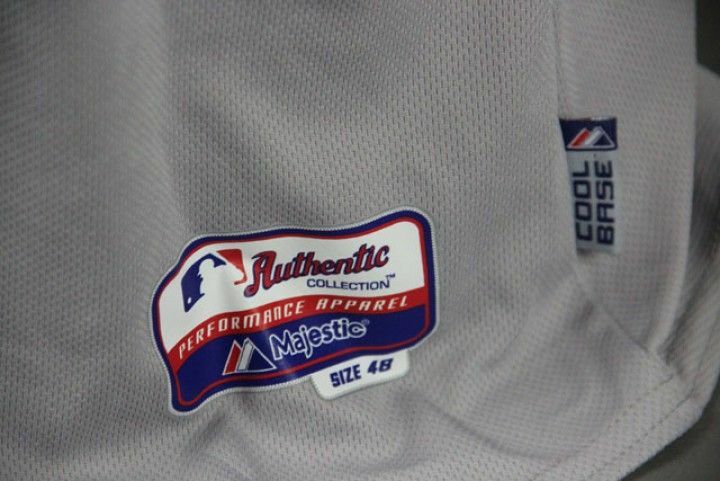 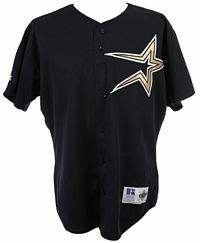 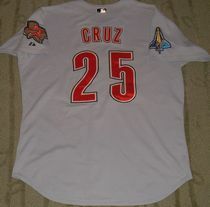 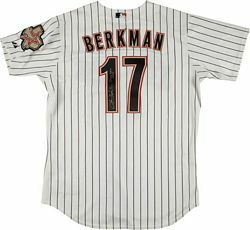 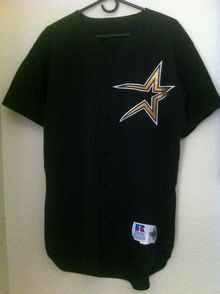 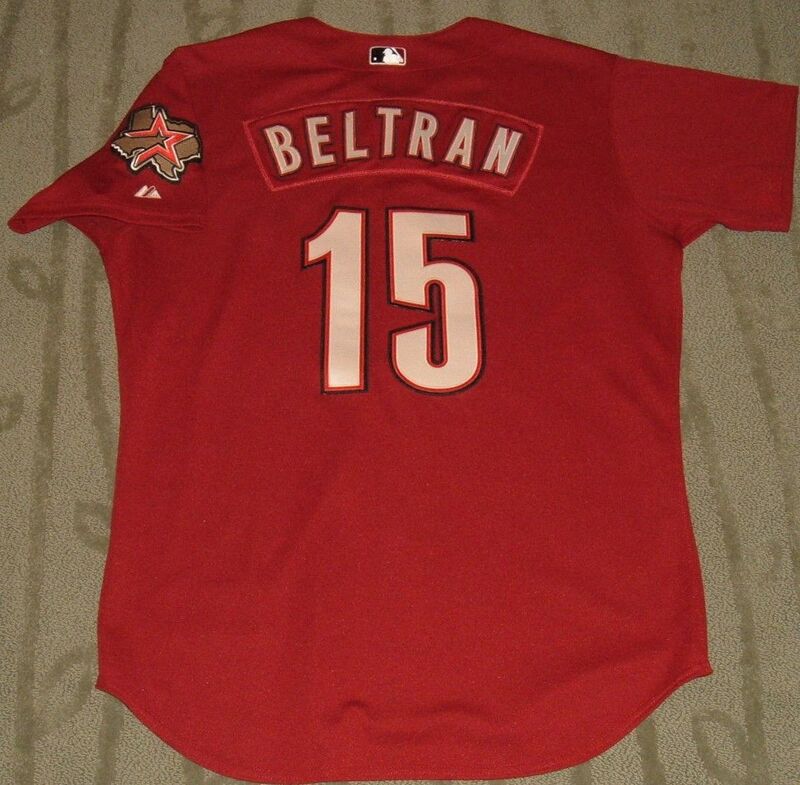 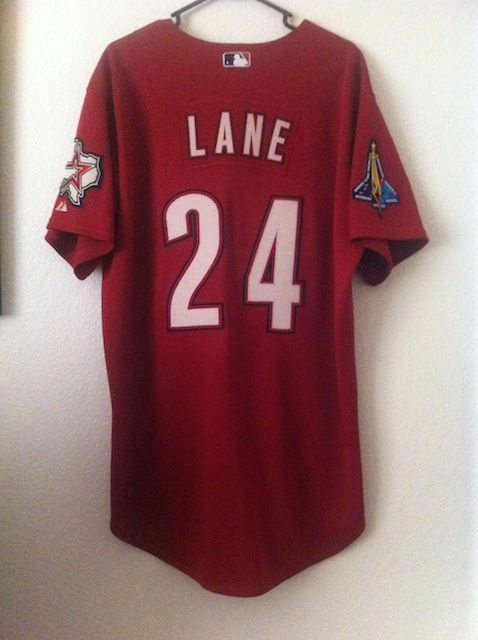 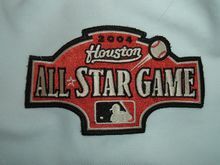 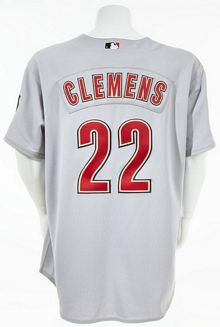 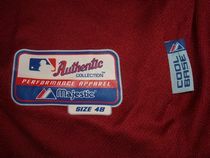 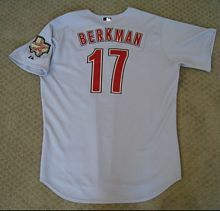 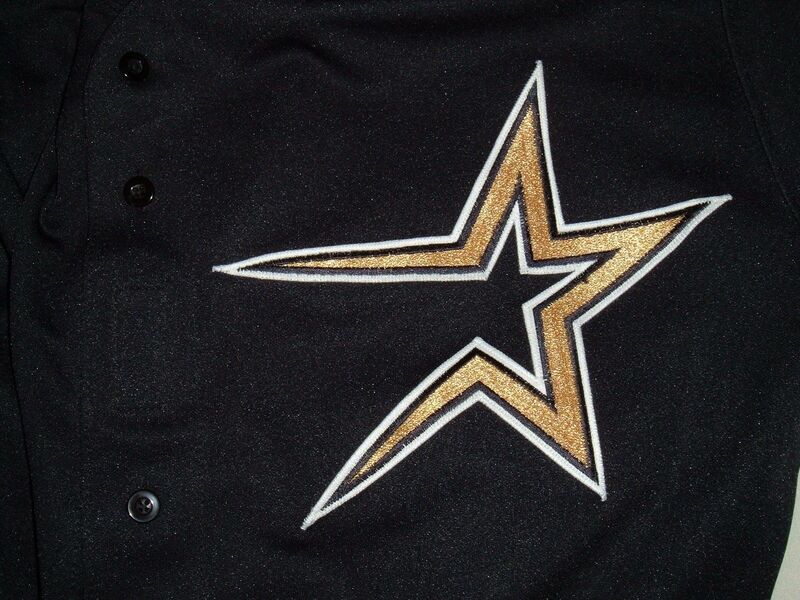 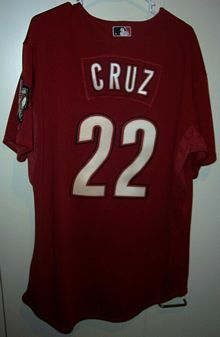 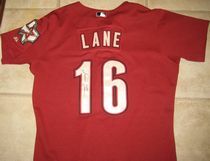 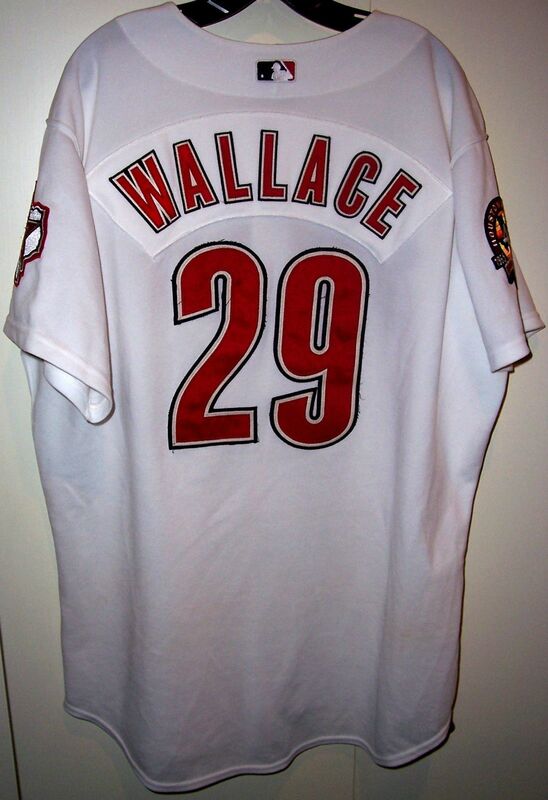 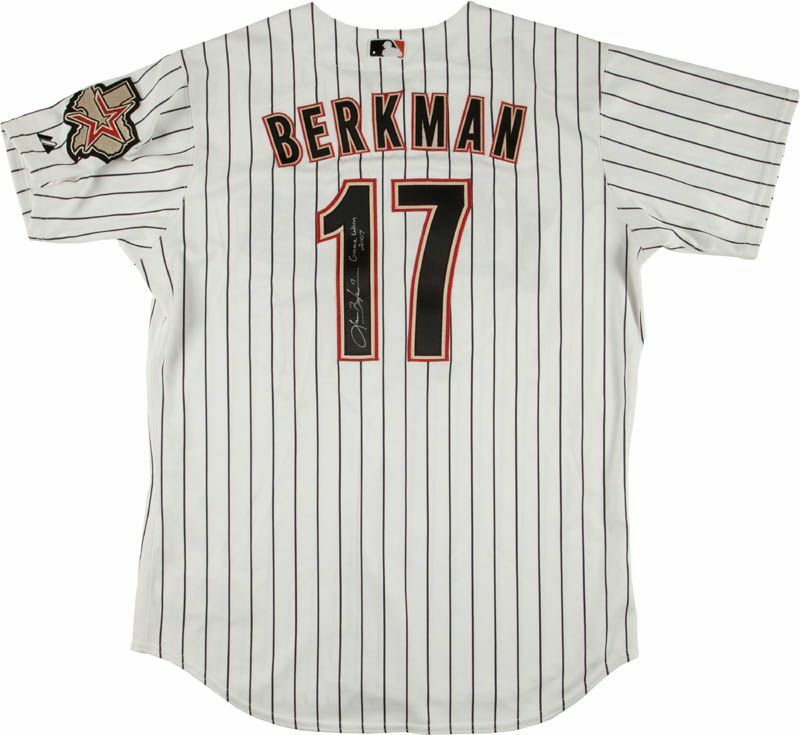 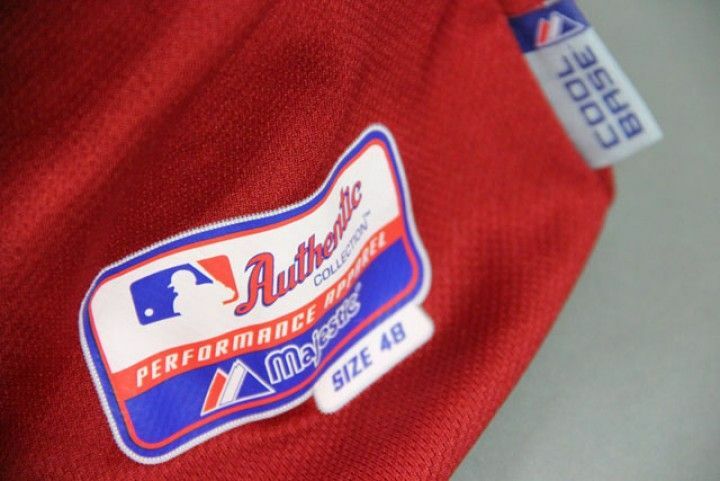 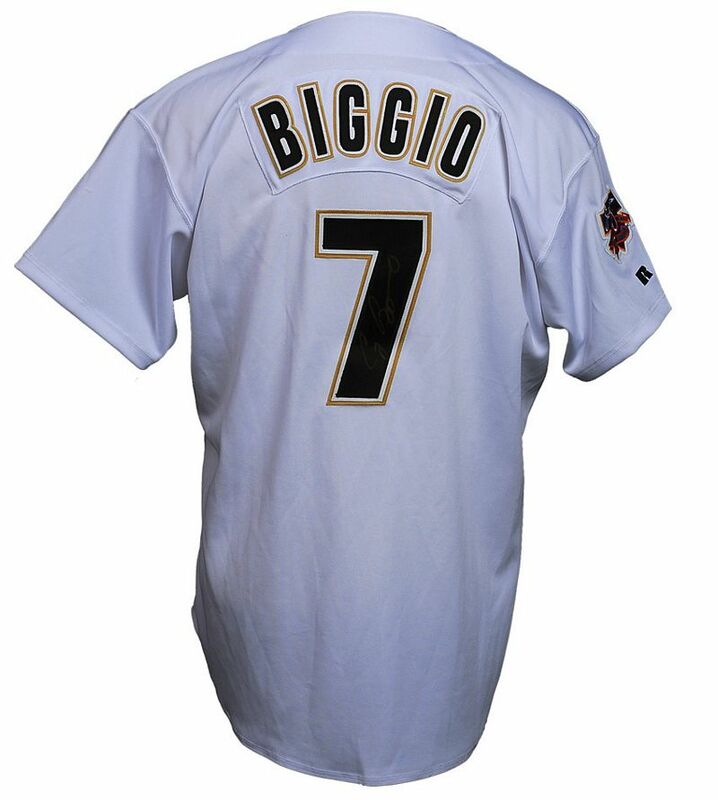 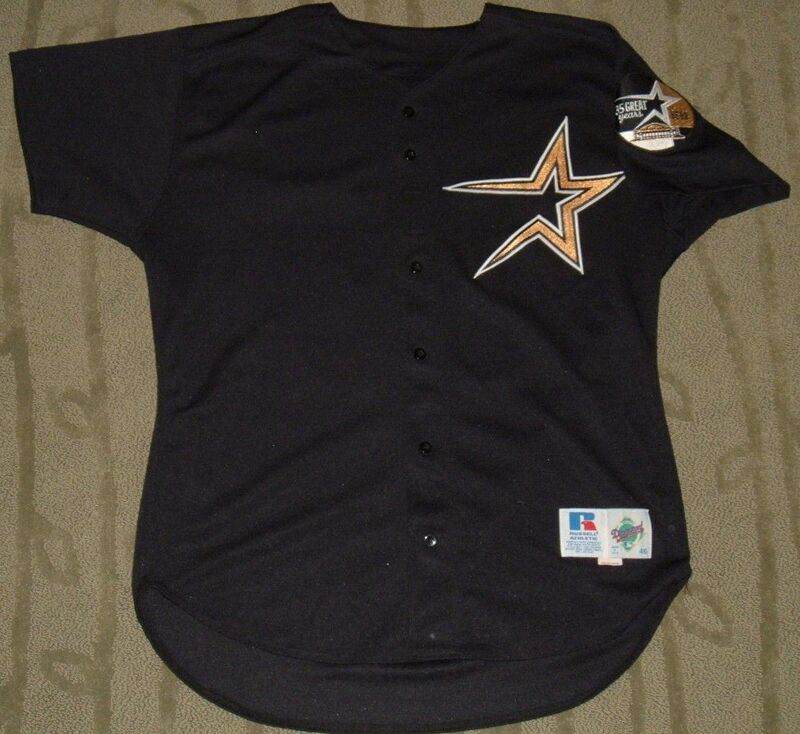 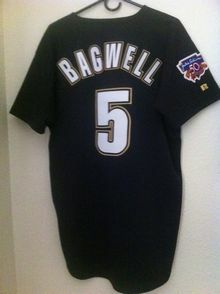 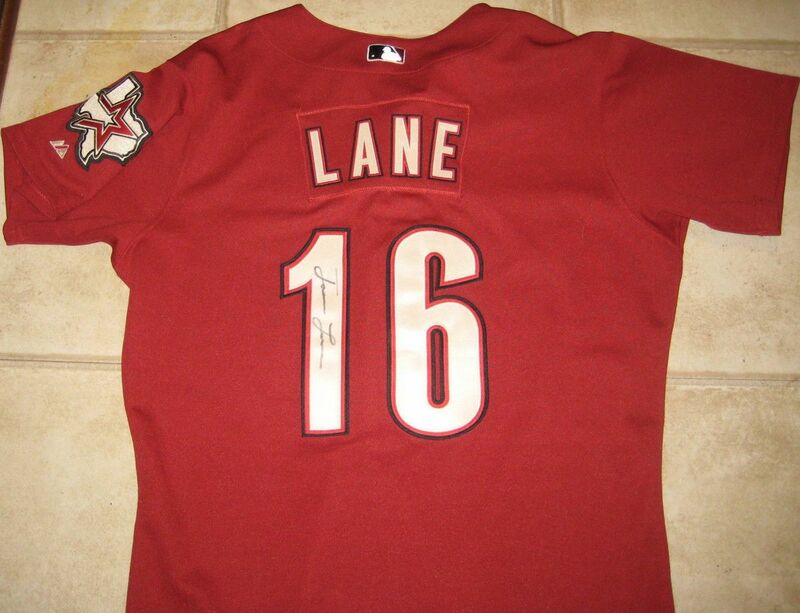 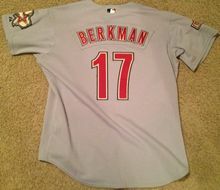 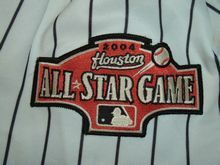 All Star game patch worn on all jerseys in 2004. 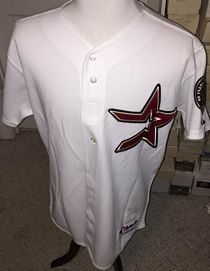 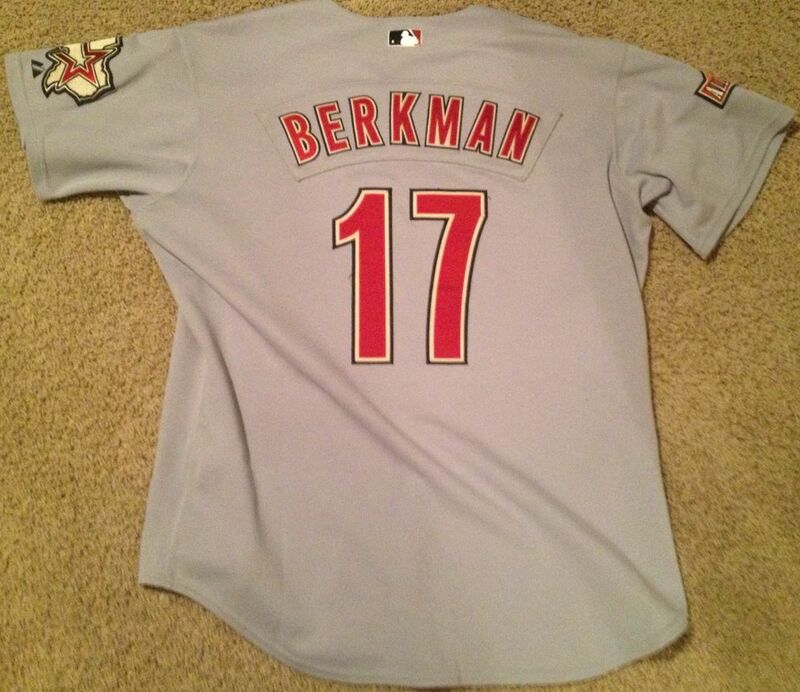 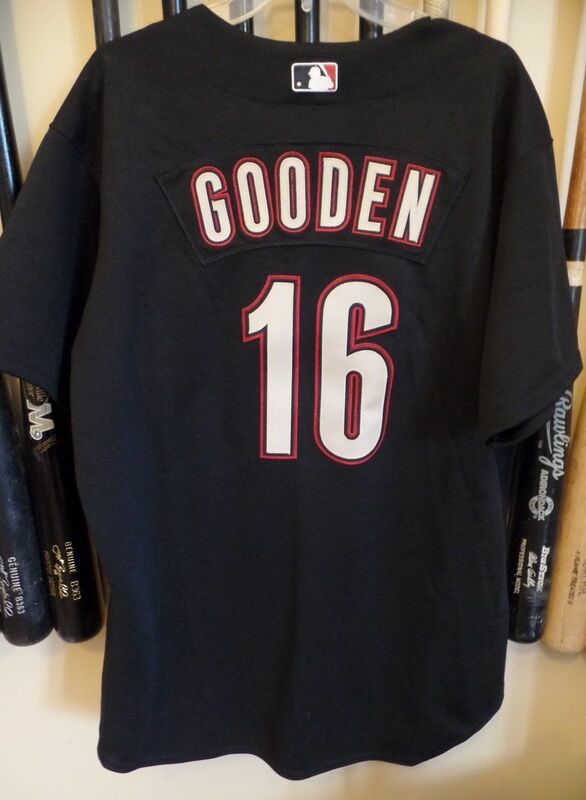 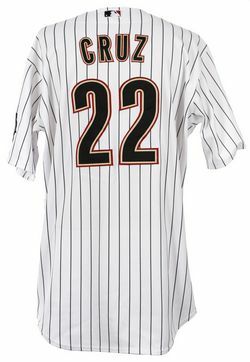 Cool Base jerseys first appear. 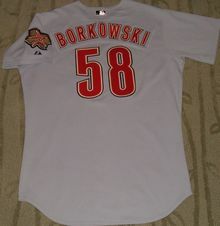 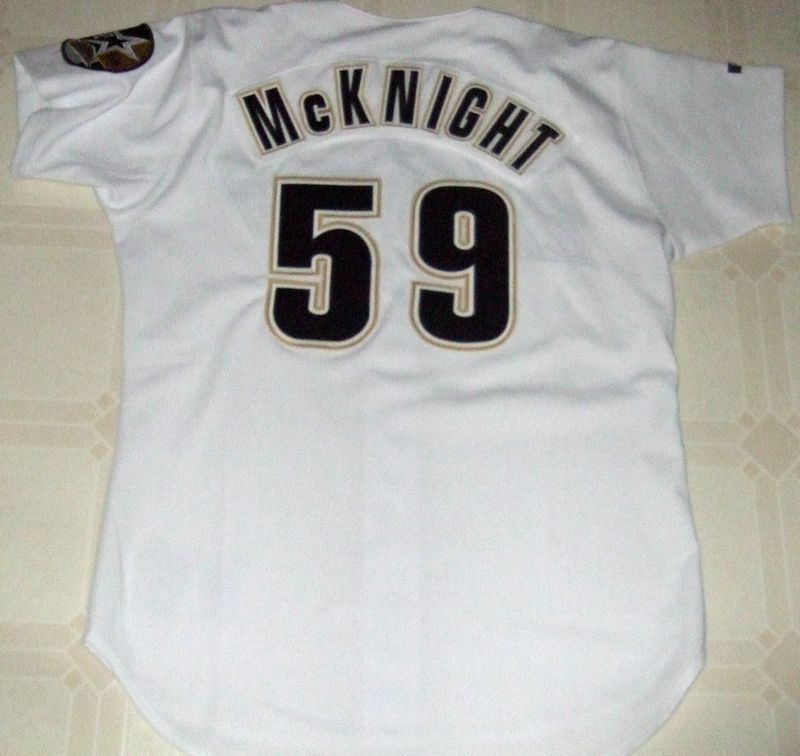 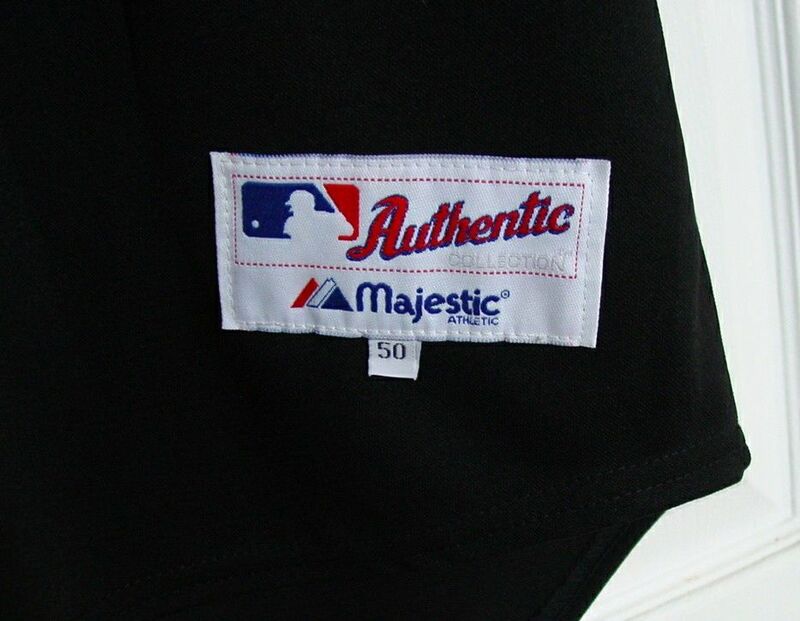 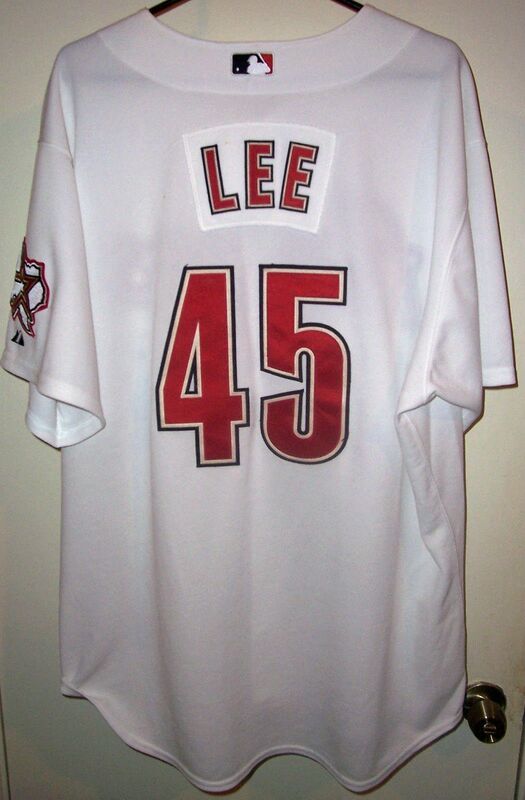 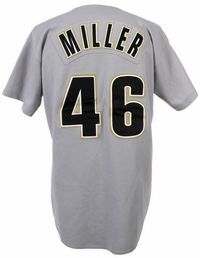 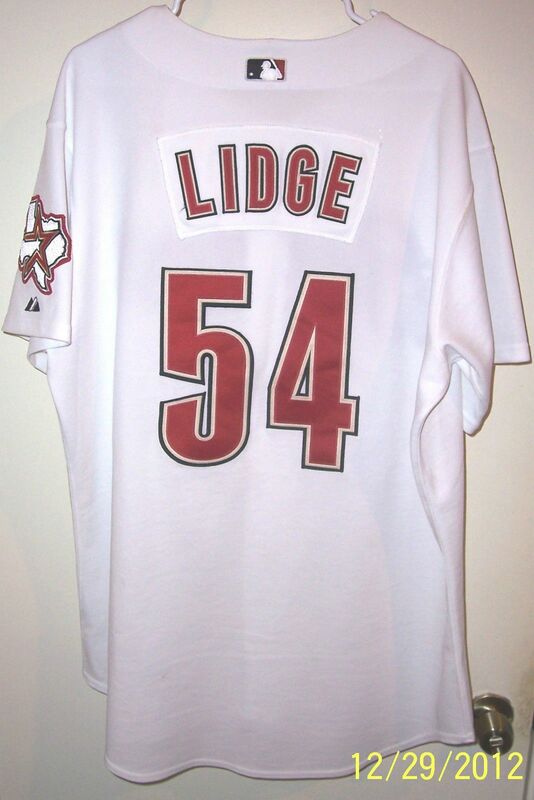 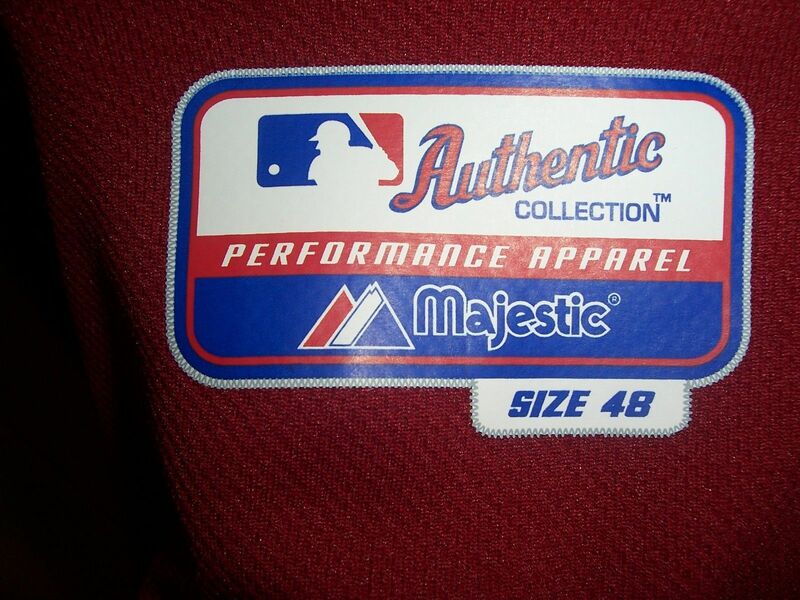 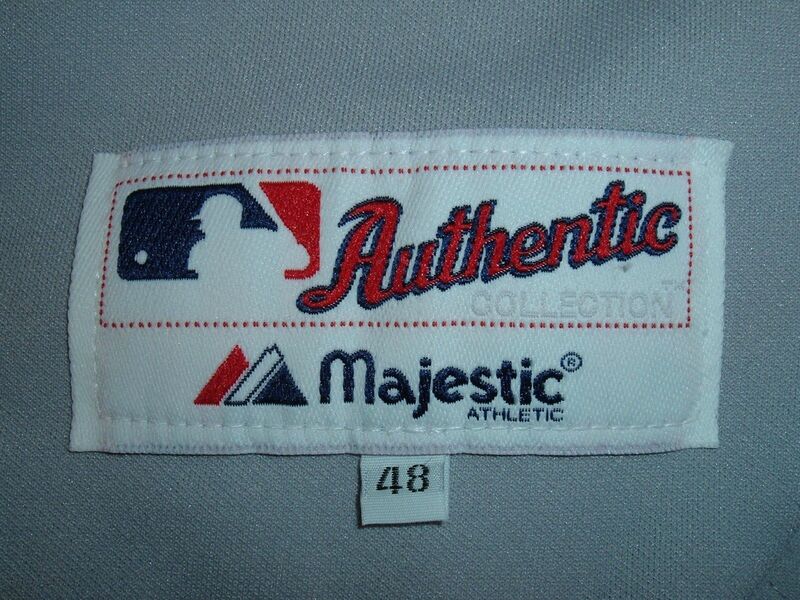 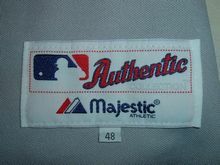 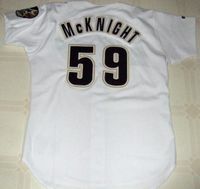 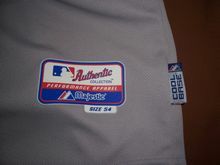 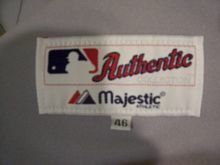 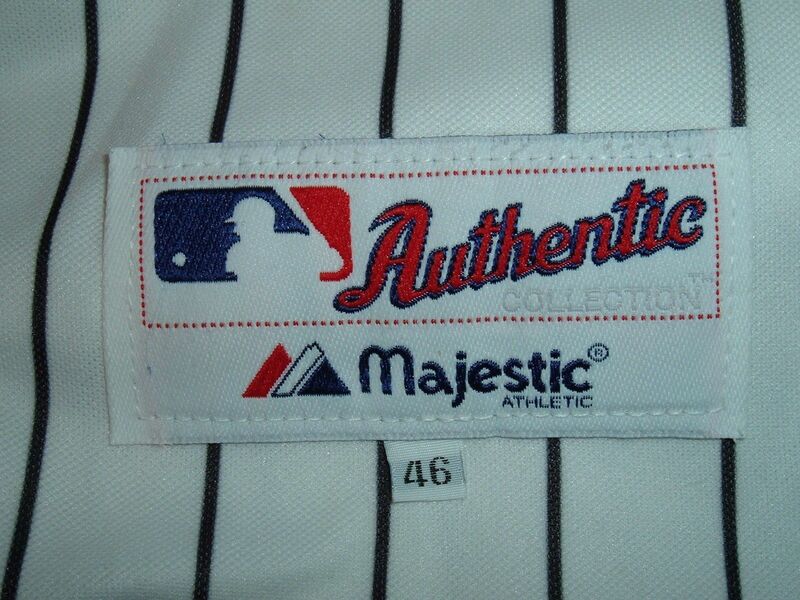 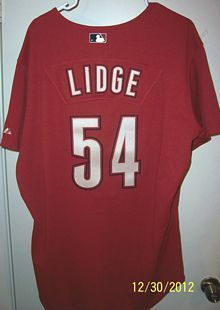 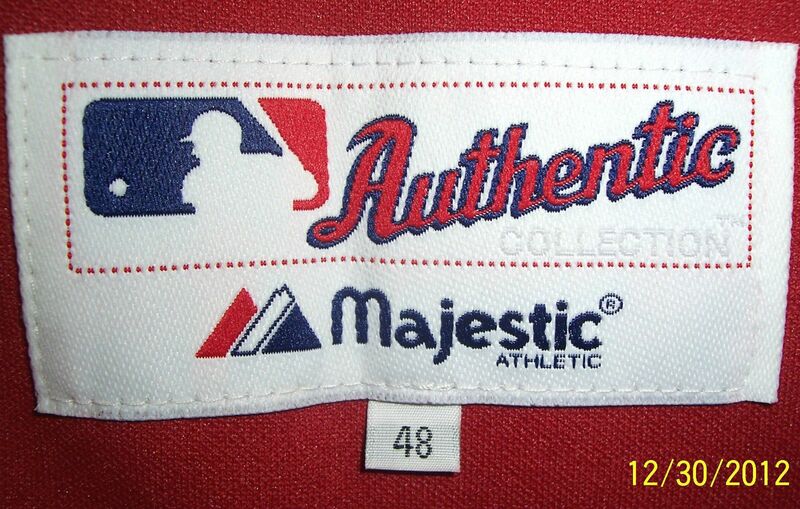 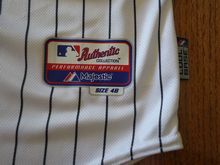 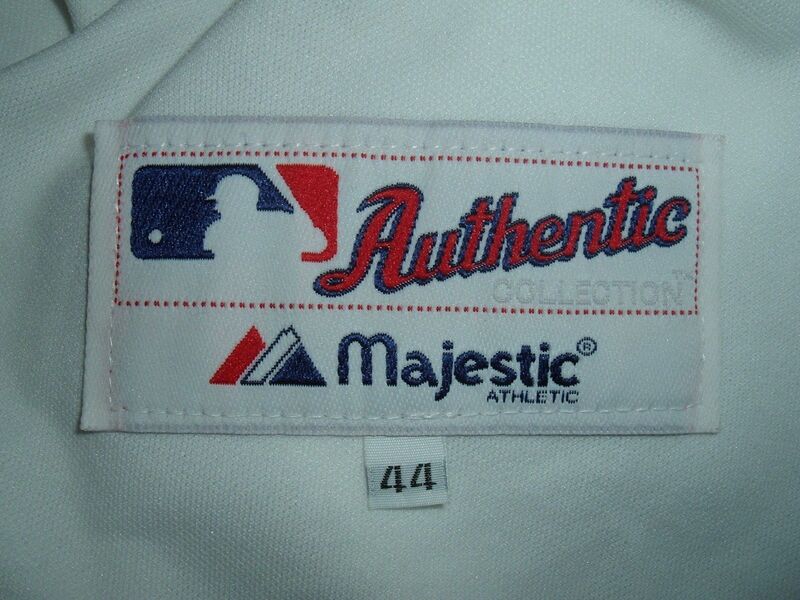 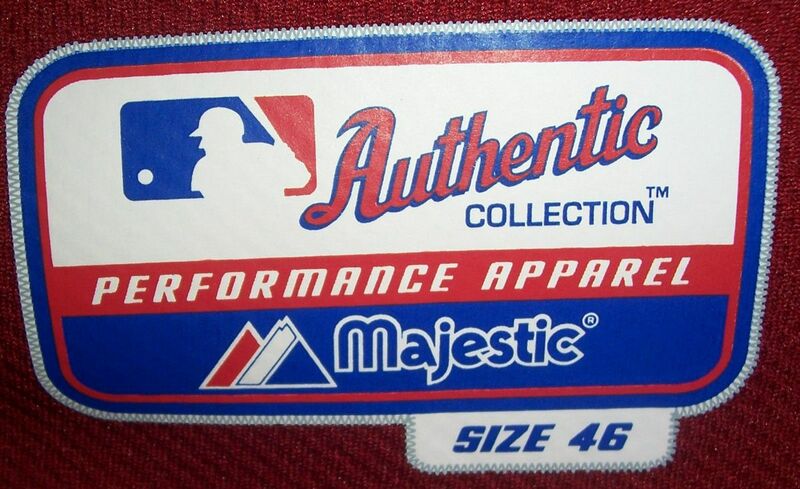 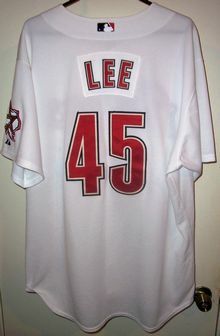 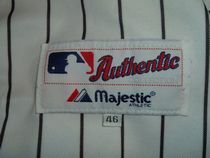 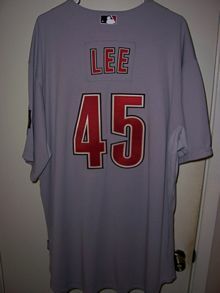 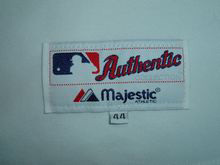 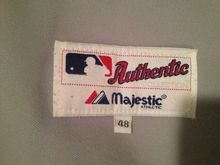 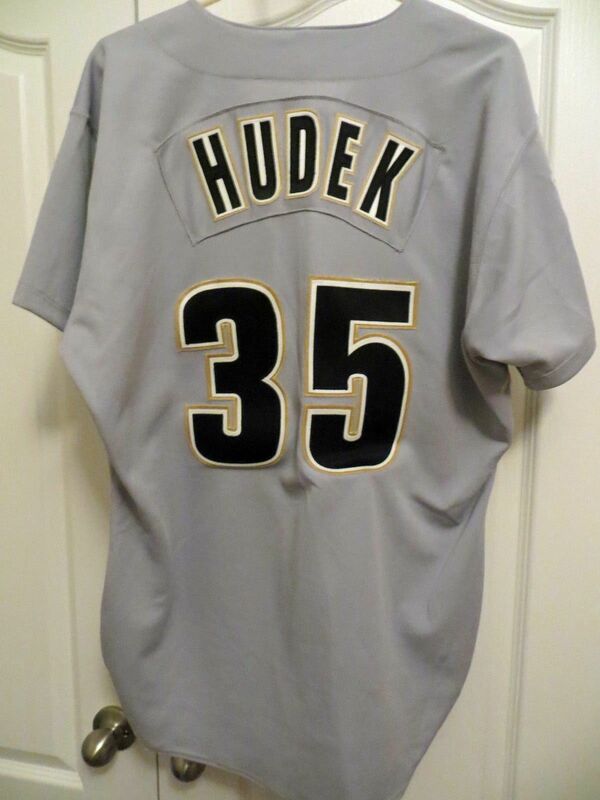 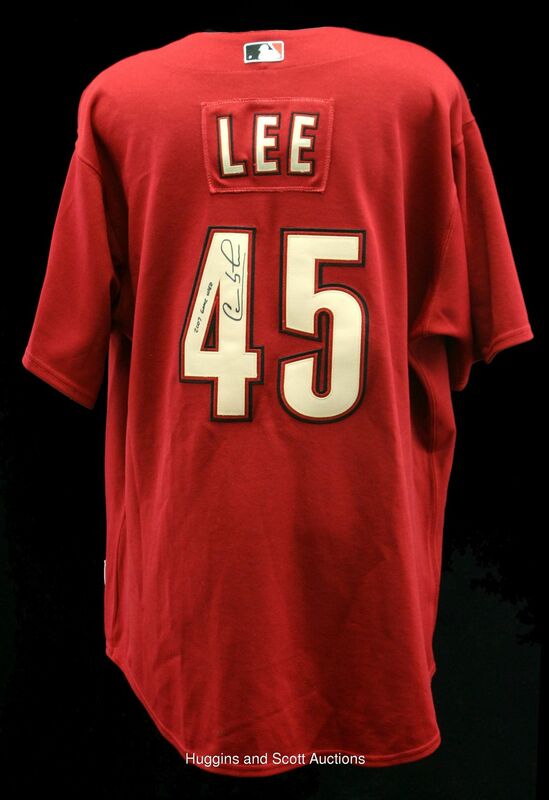 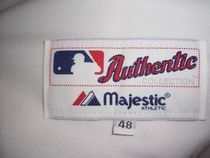 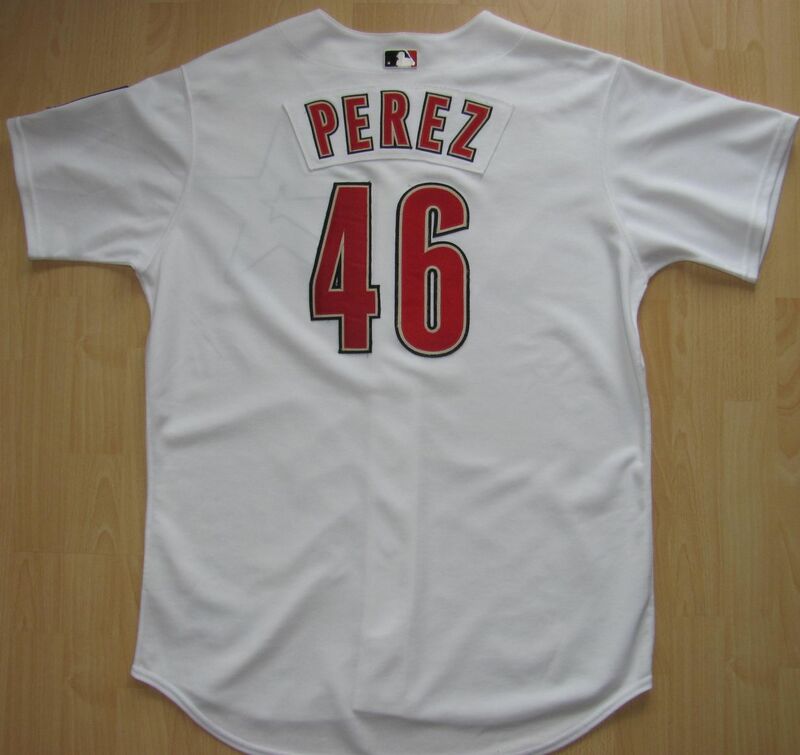 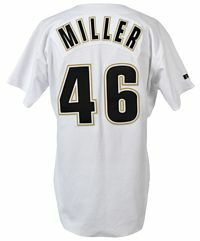 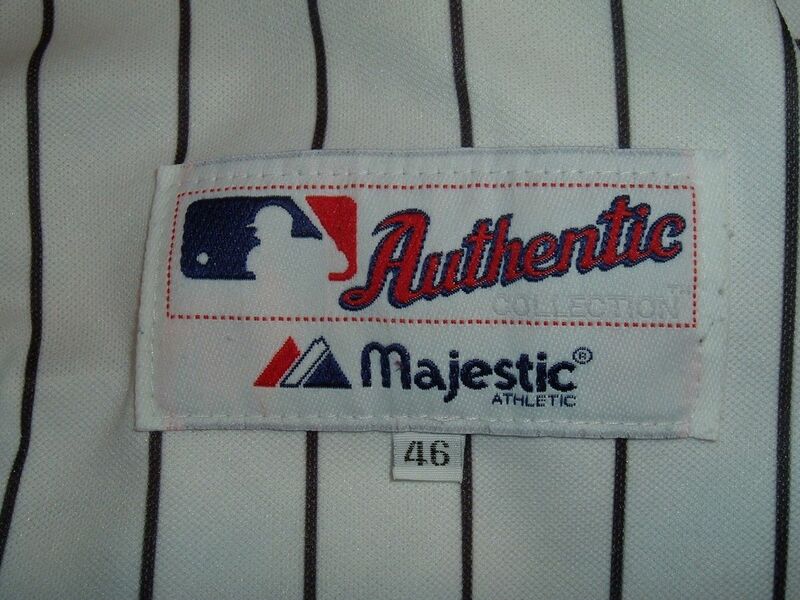 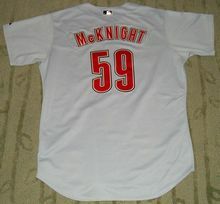 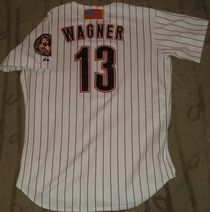 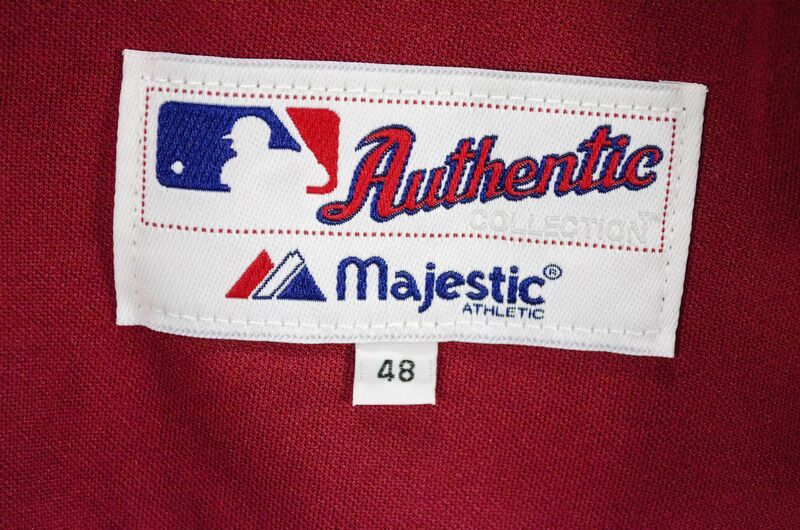 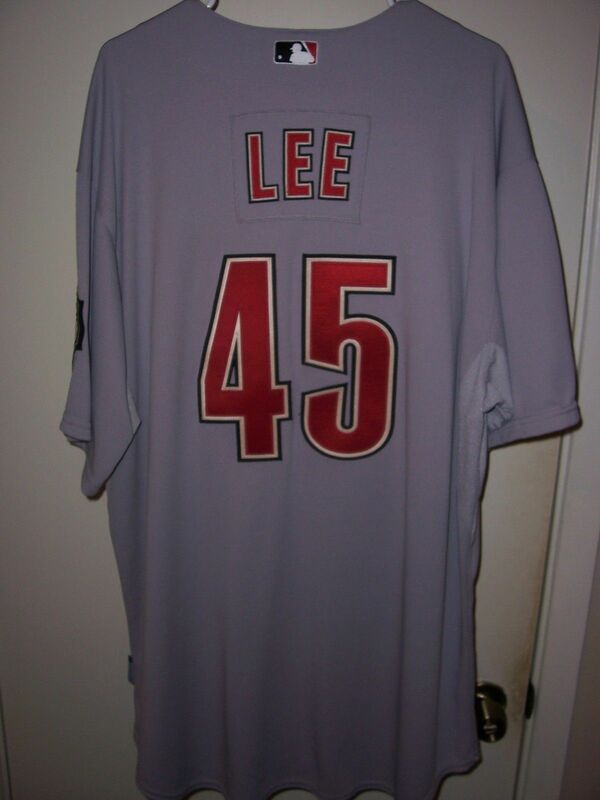 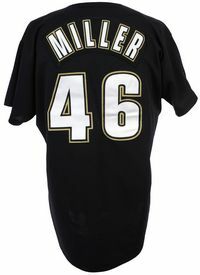 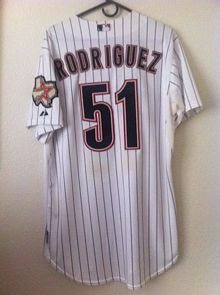 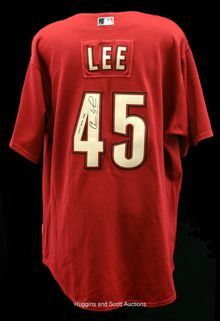 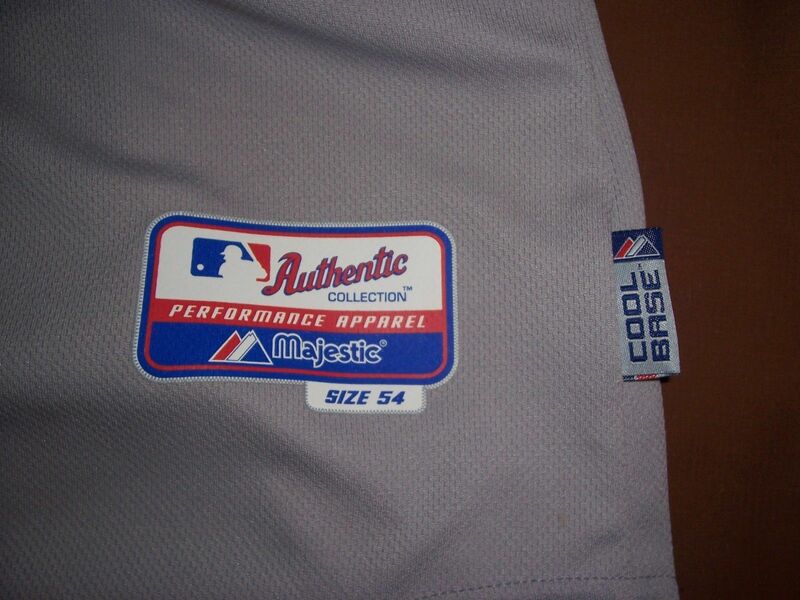 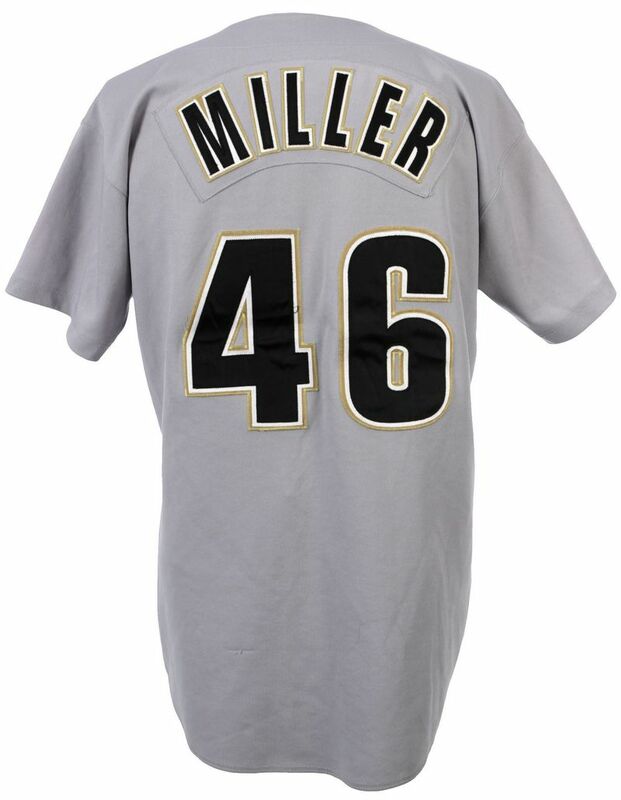 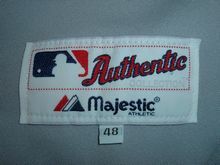 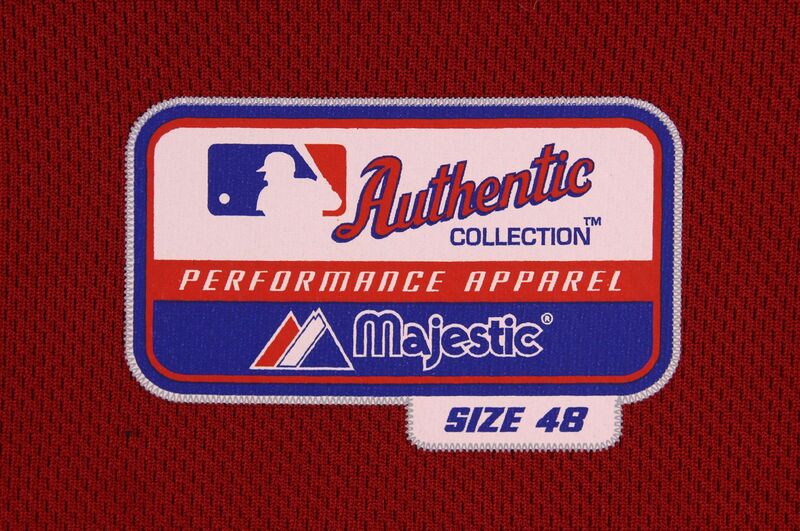 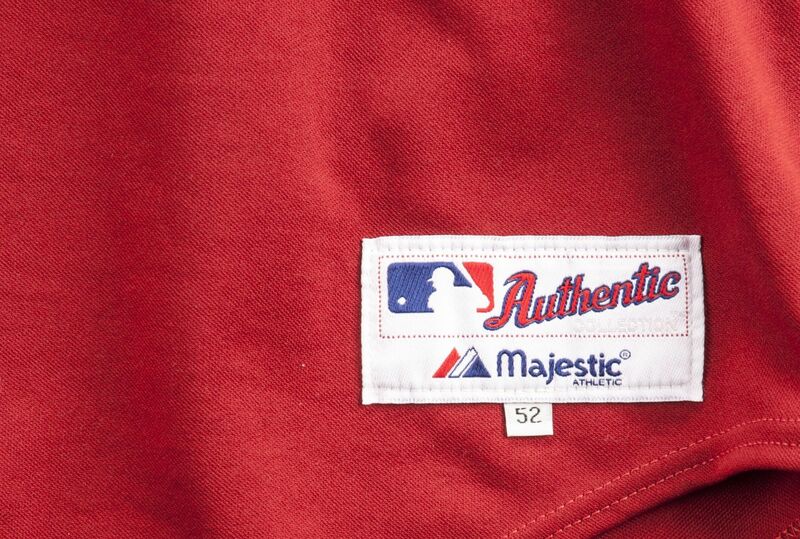 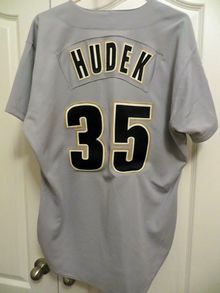 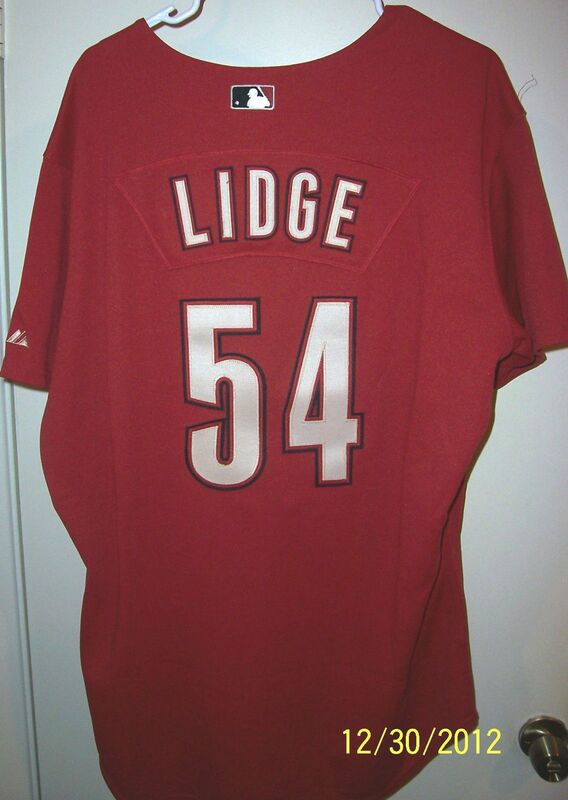 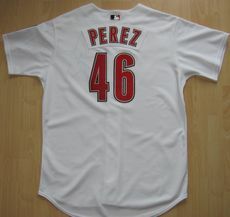 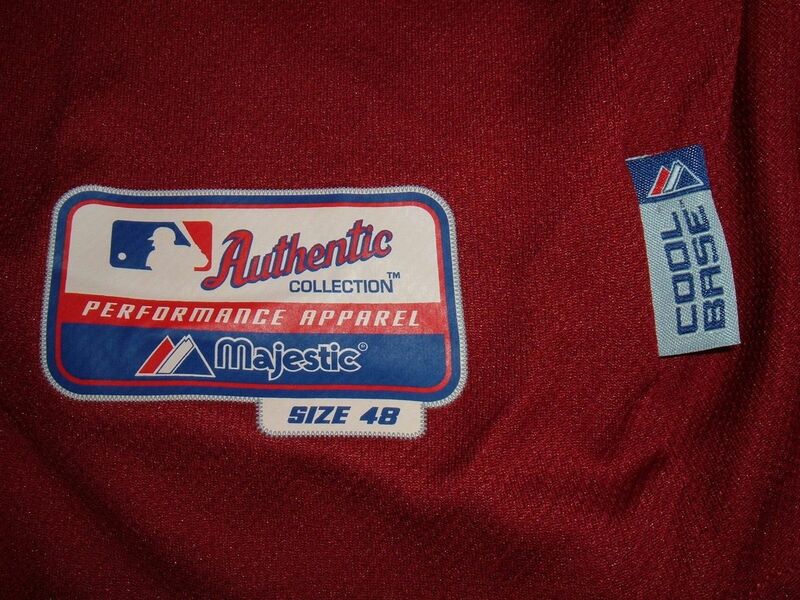 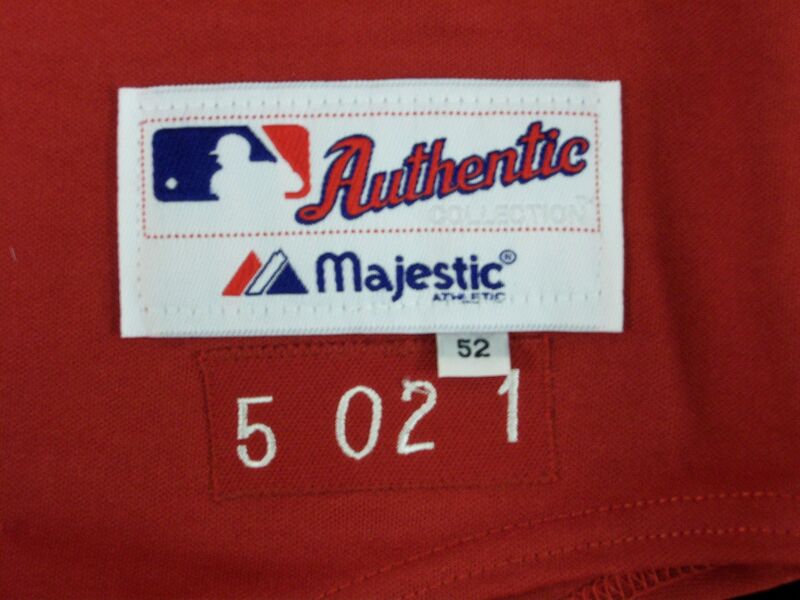 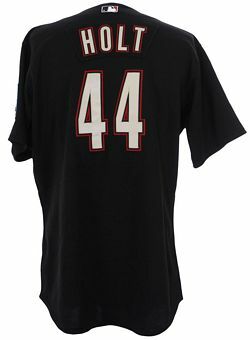 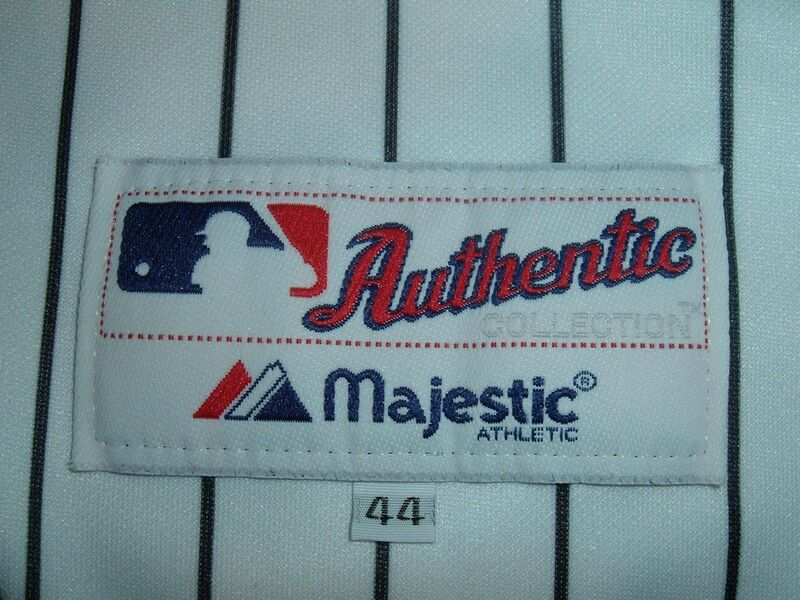 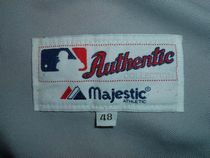 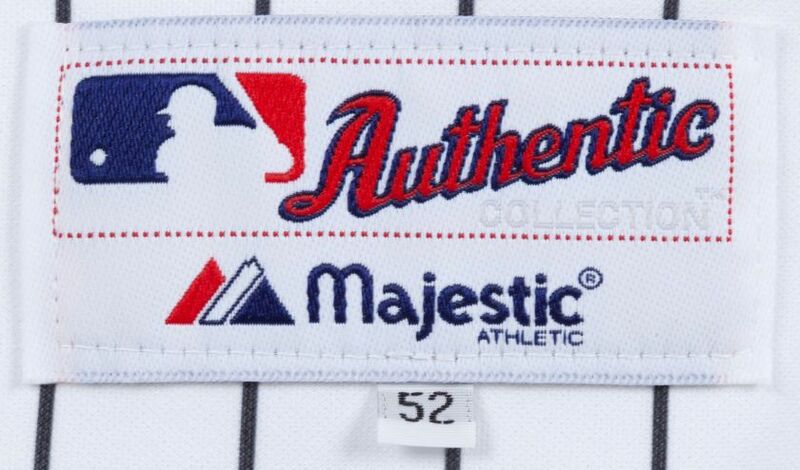 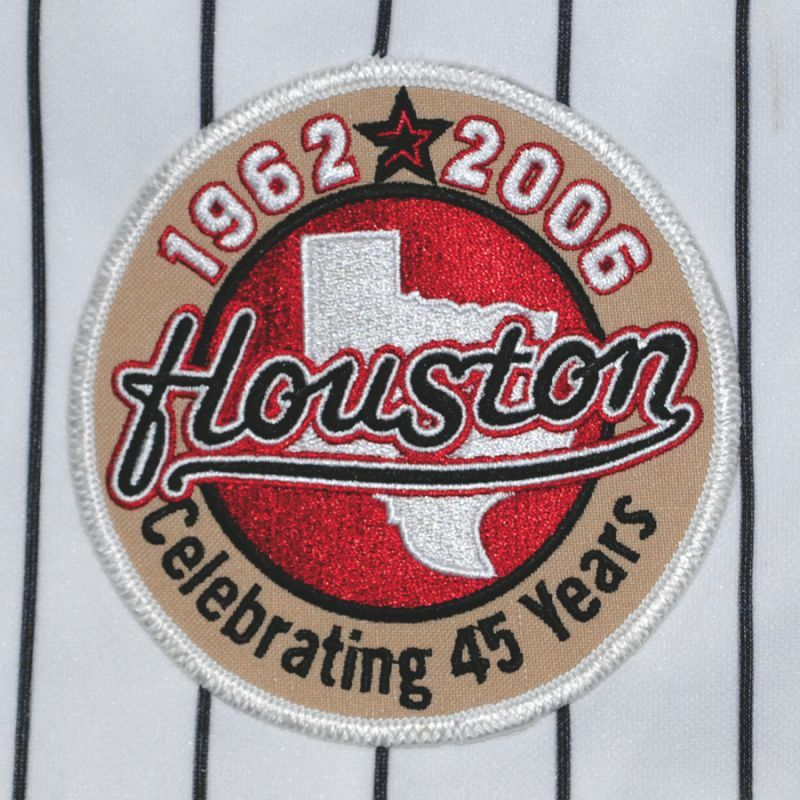 45th anniversary patch worn on all jerseys in 2006. 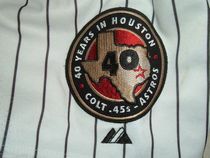 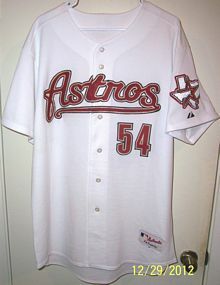 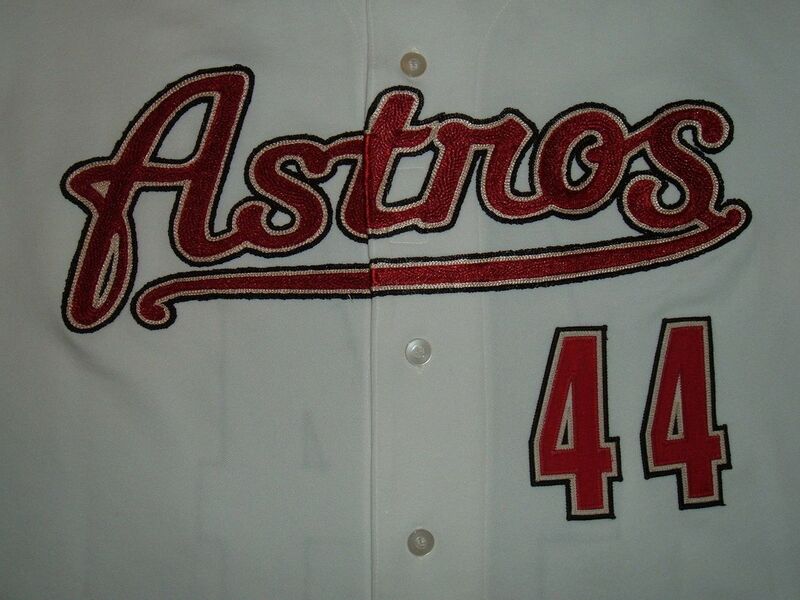 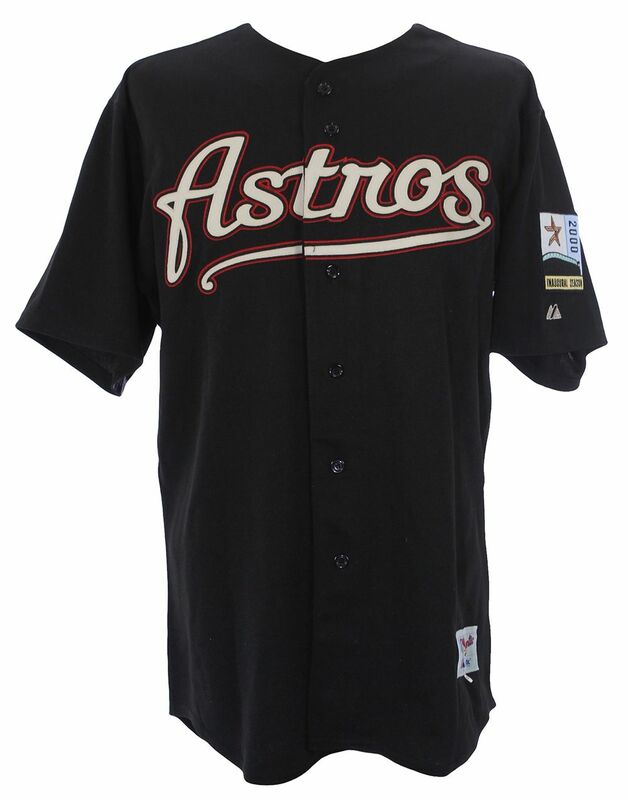 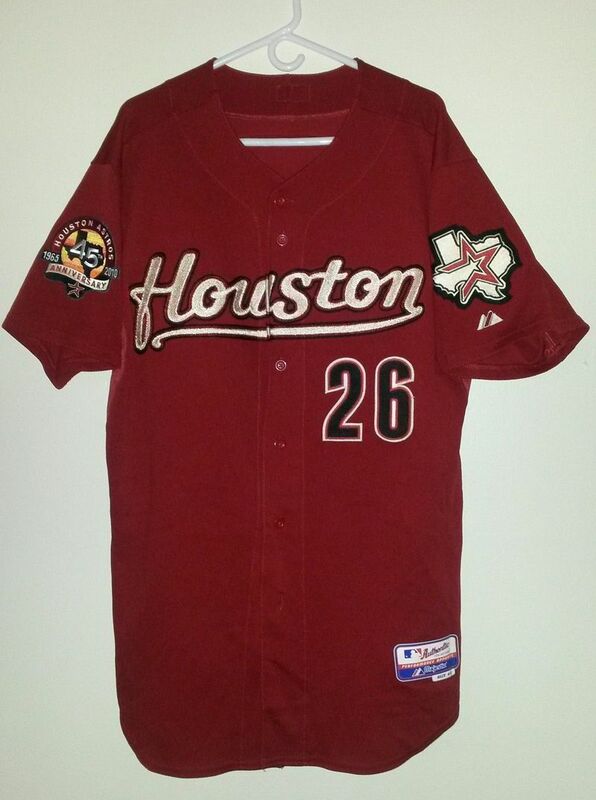 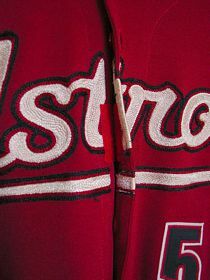 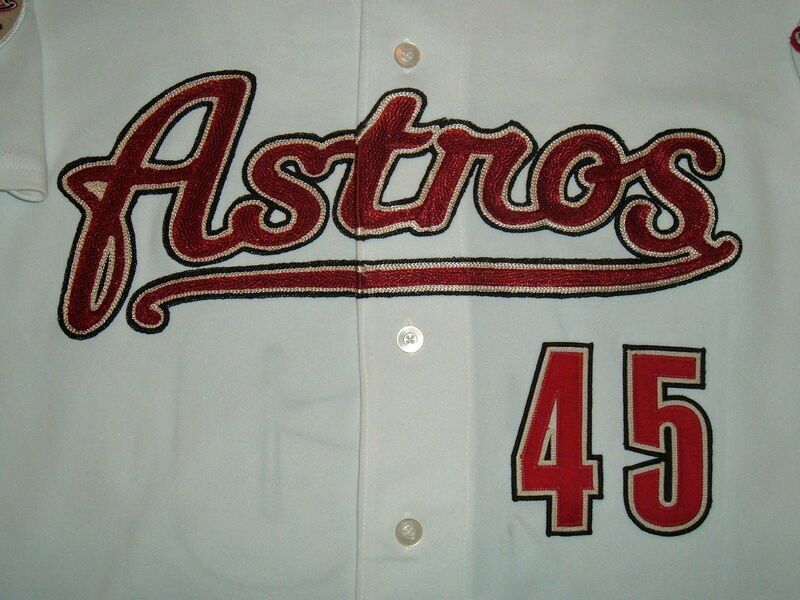 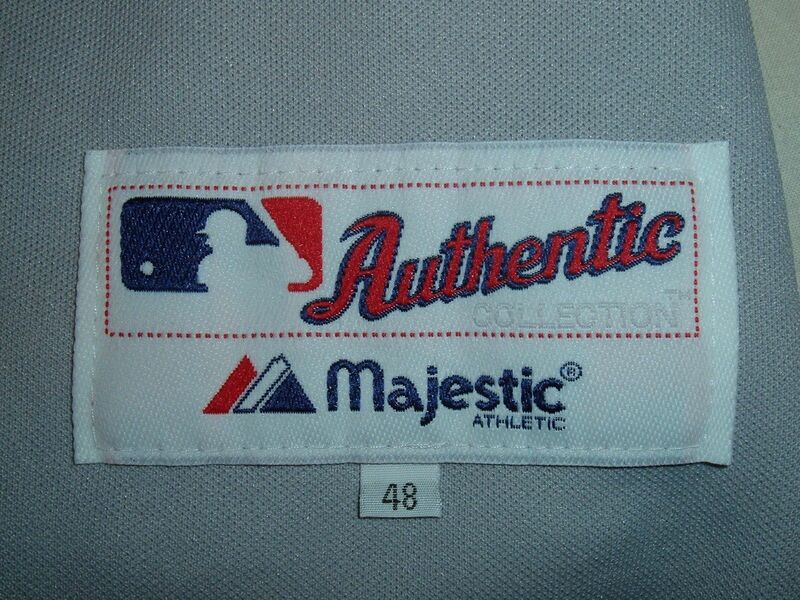 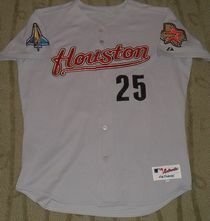 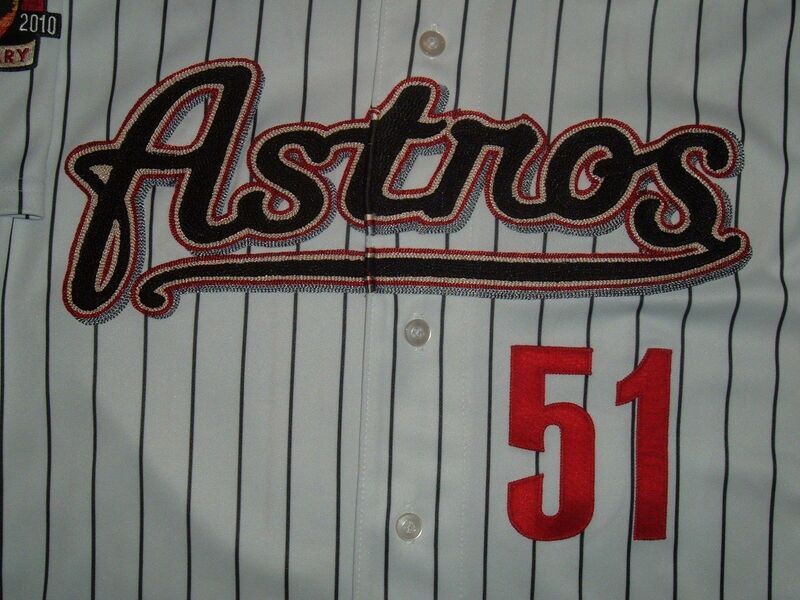 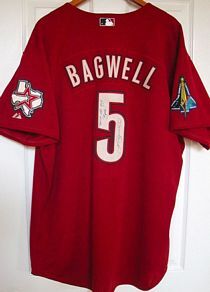 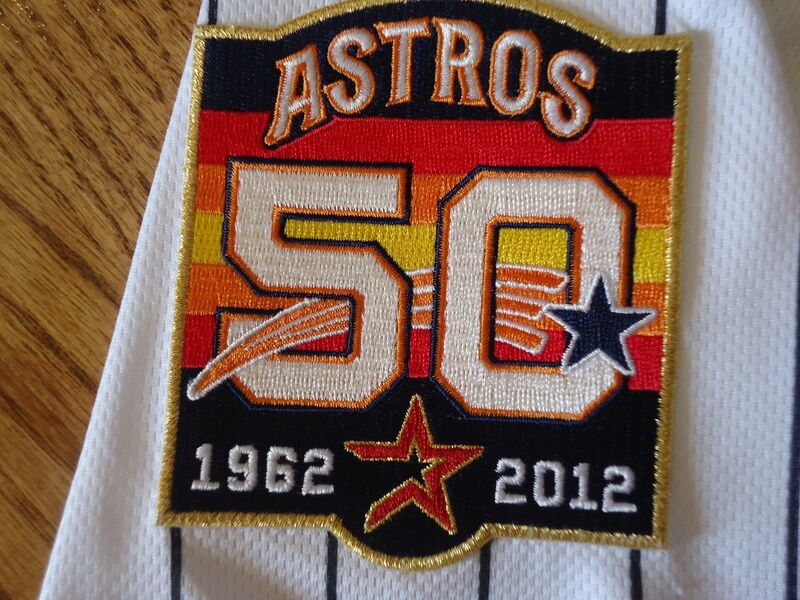 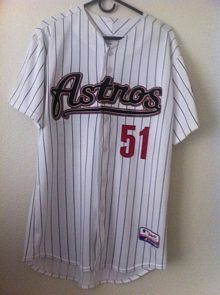 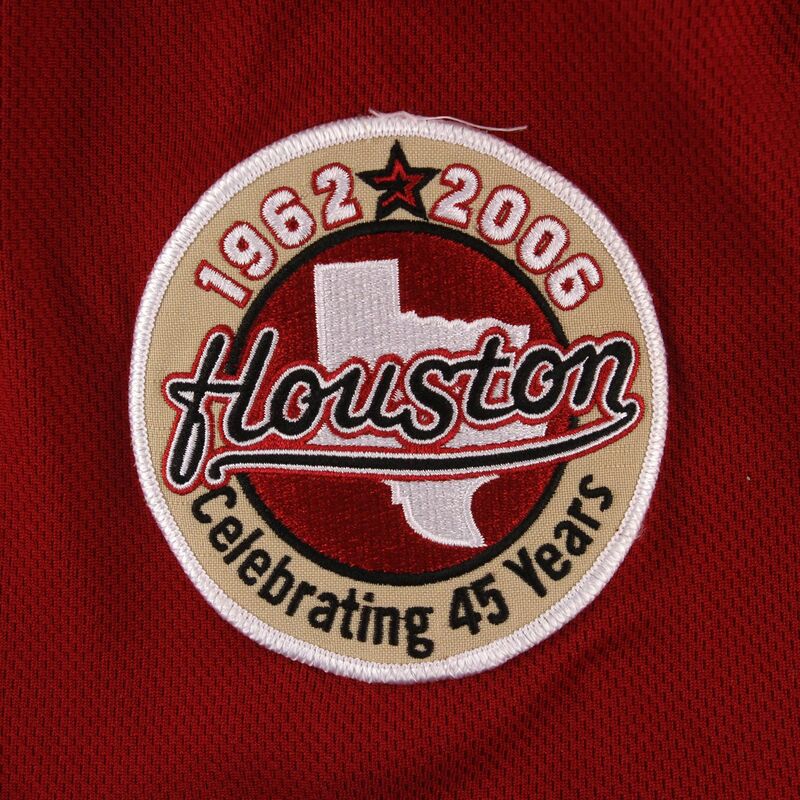 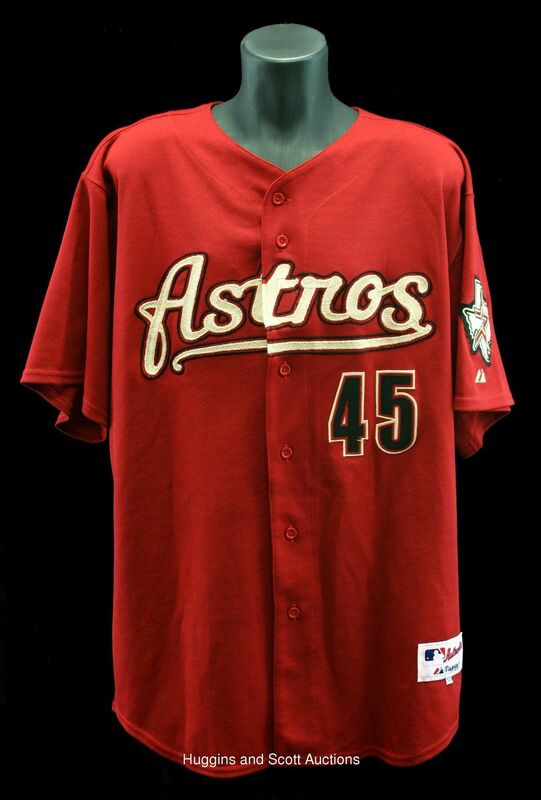 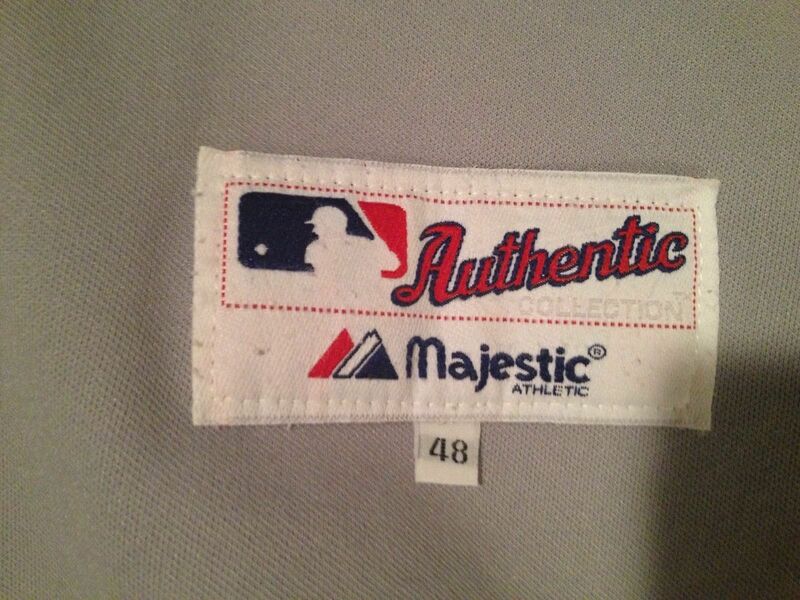 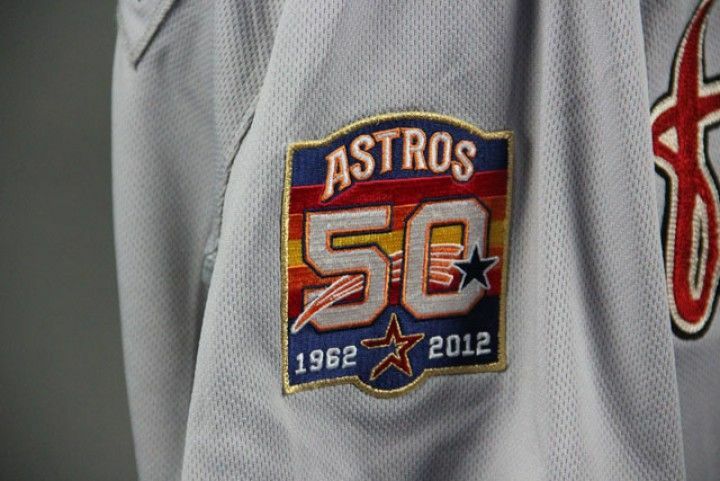 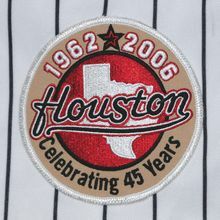 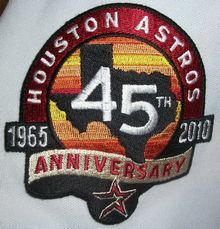 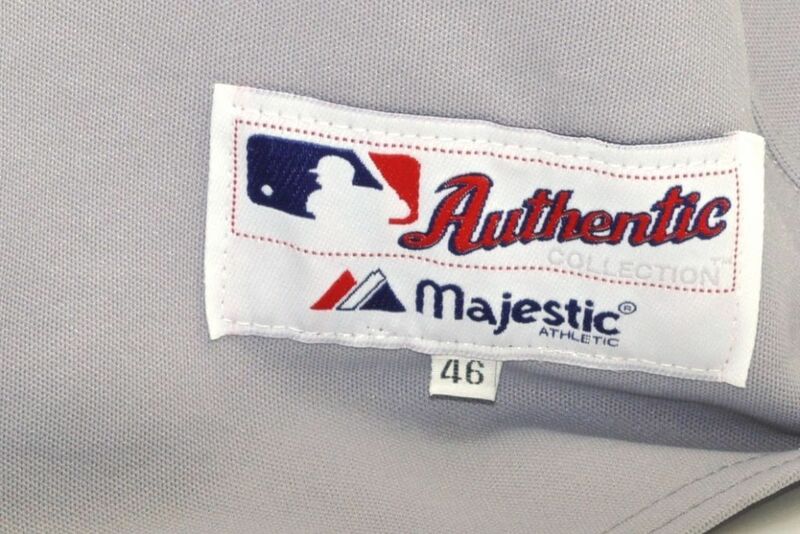 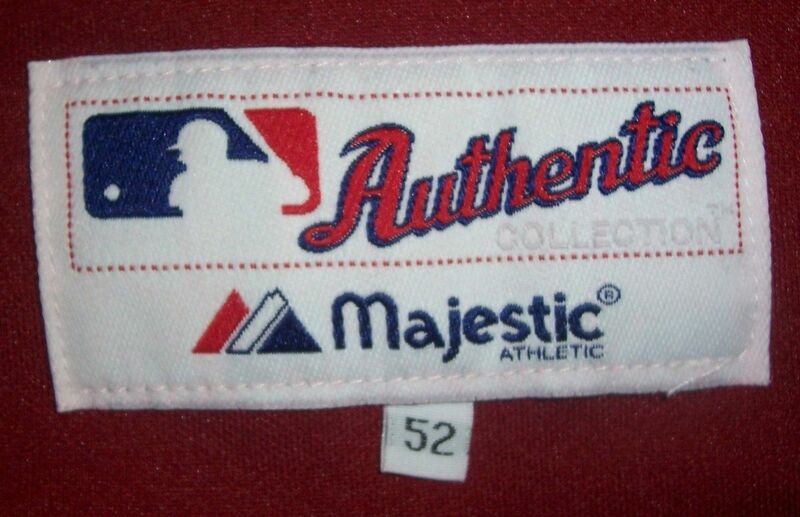 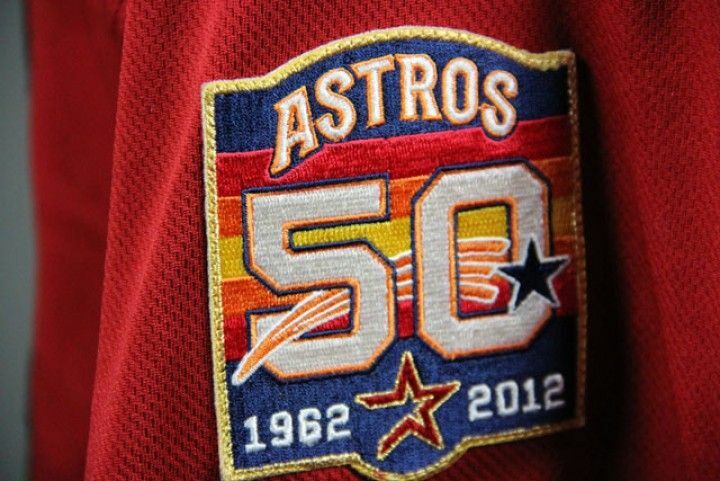 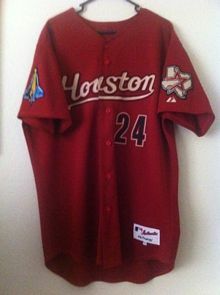 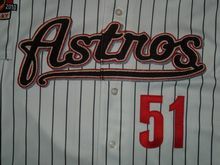 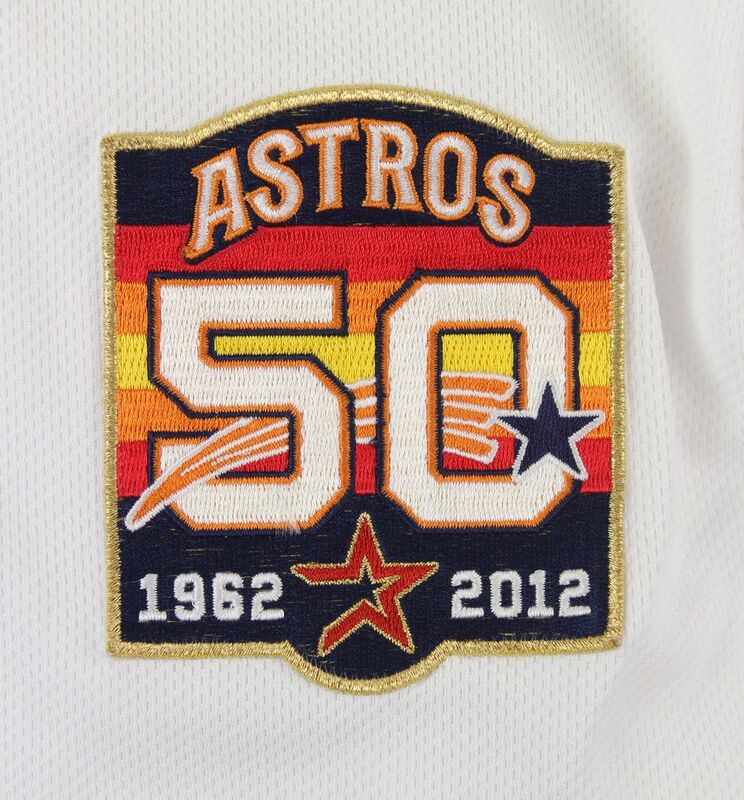 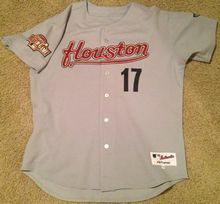 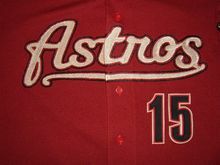 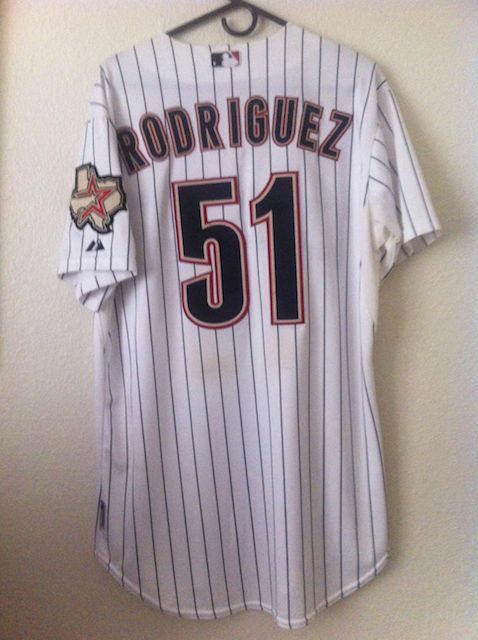 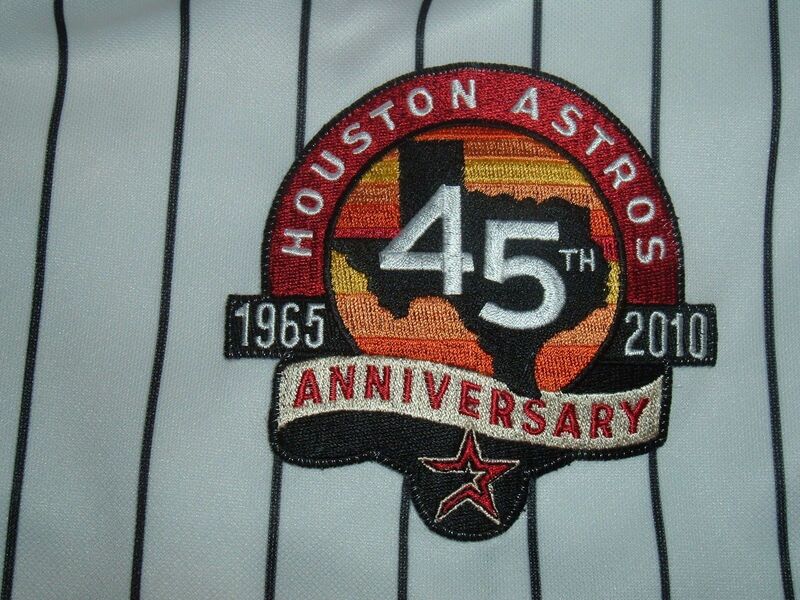 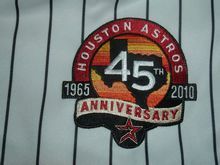 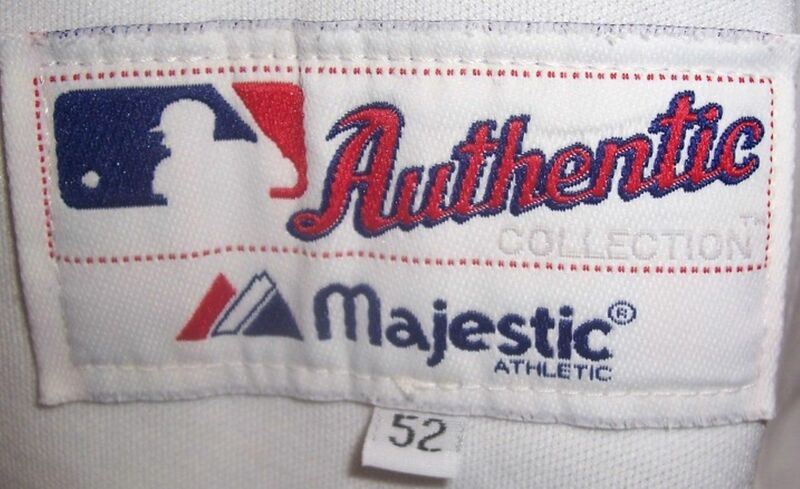 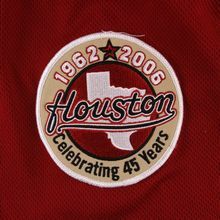 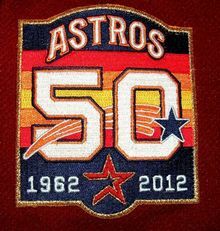 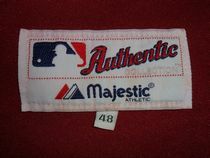 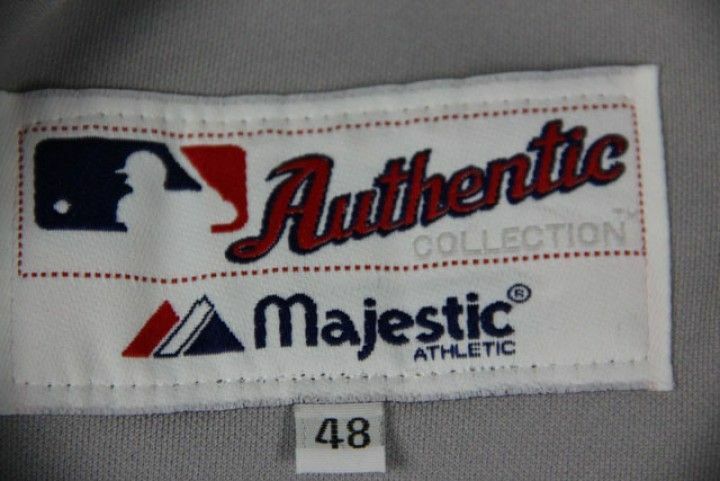 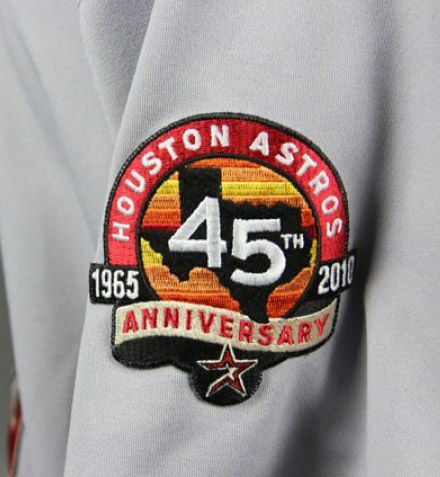 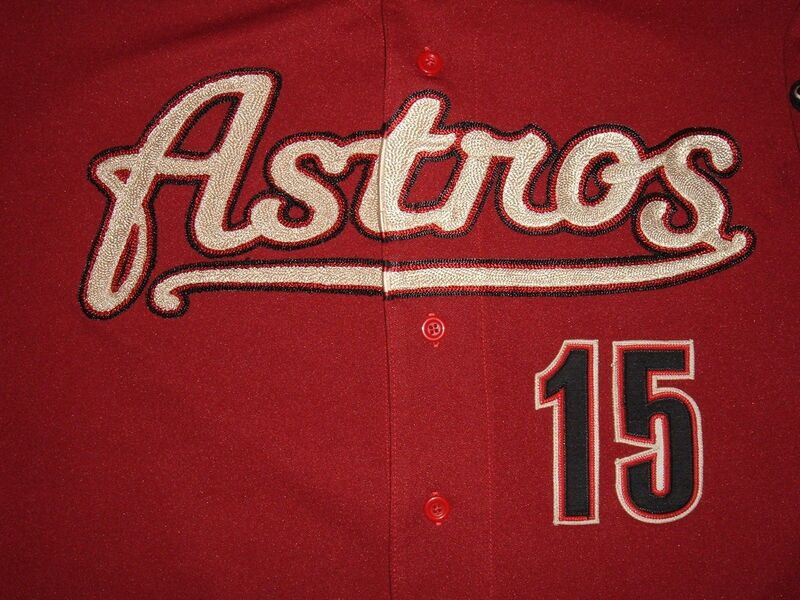 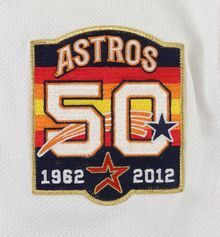 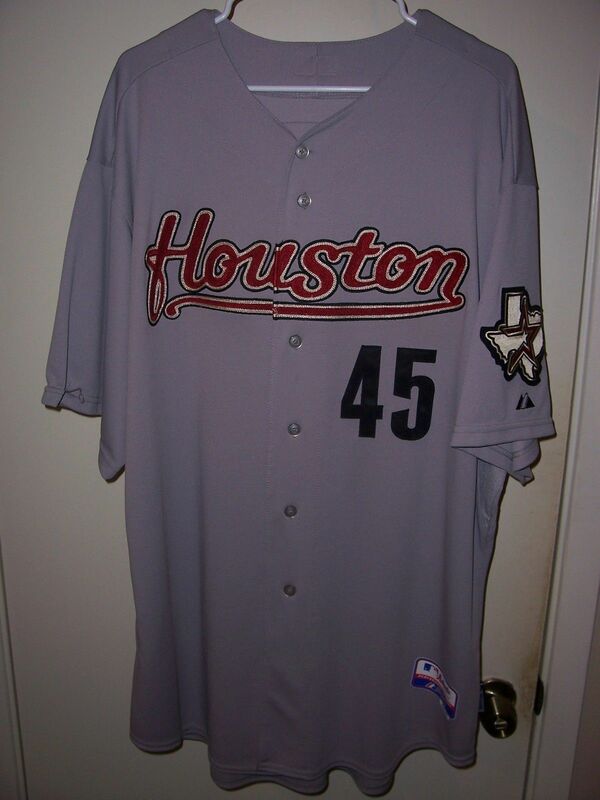 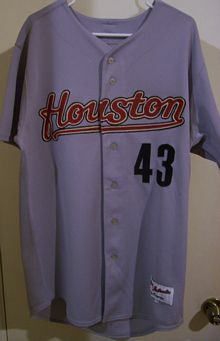 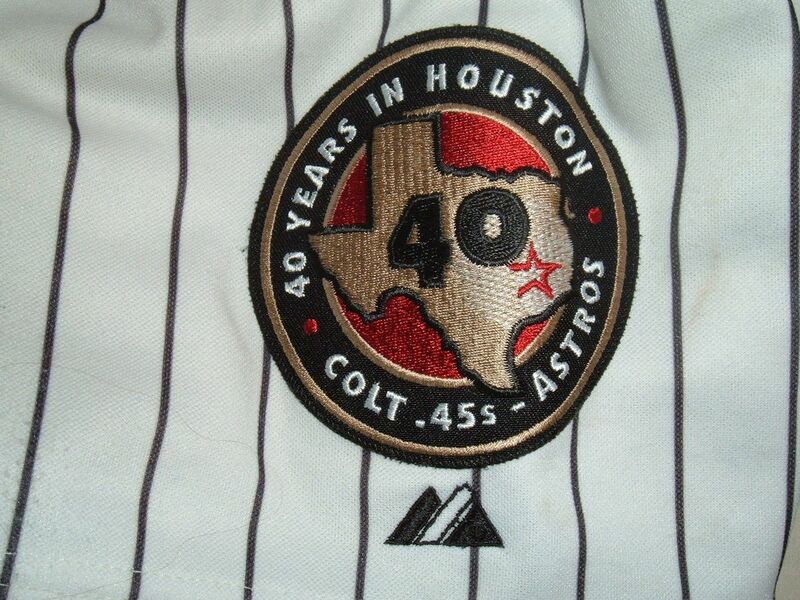 45th anniversary of the Astros patch worn in 2010. 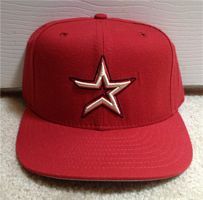 Team starts using red caps on the road in 2010. 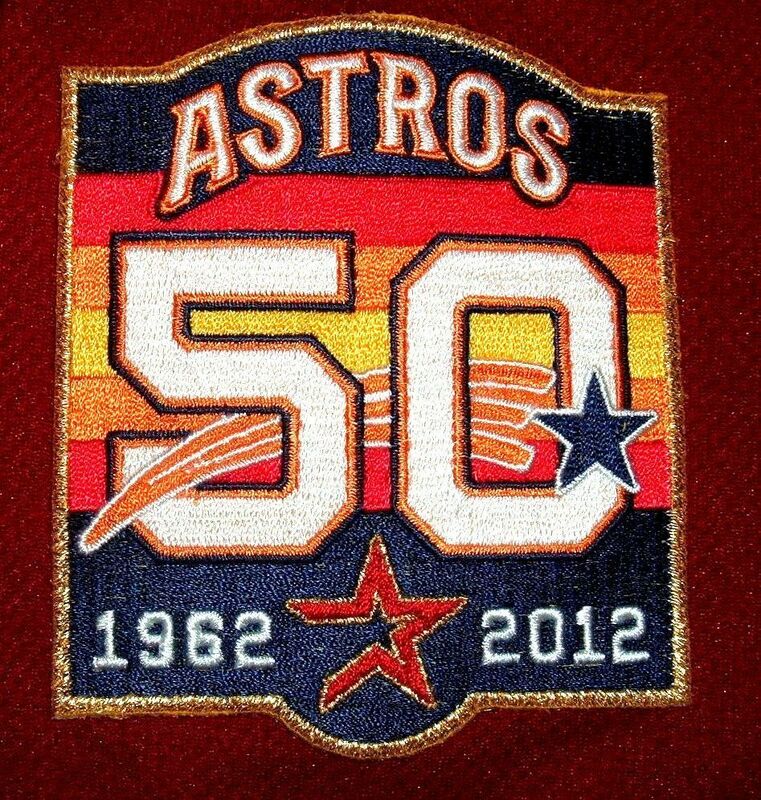 50th anniversary patch worn in 2012. 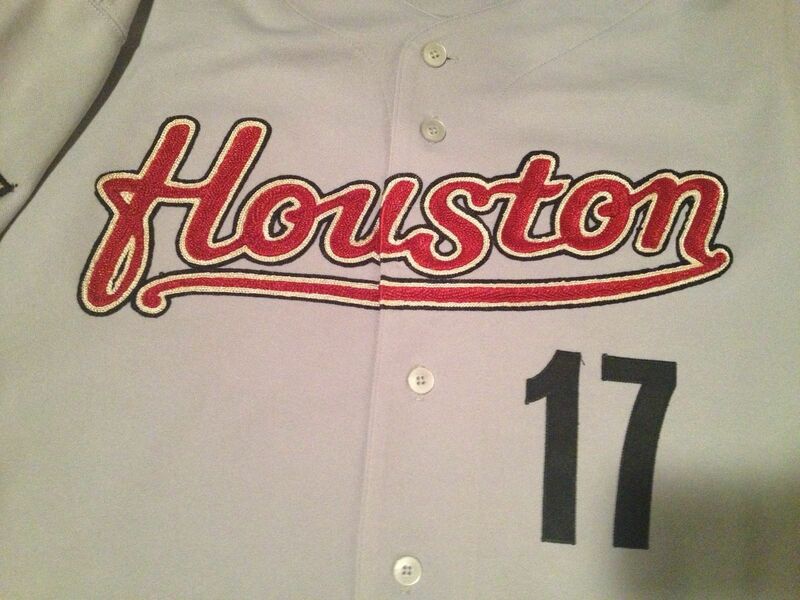 The team wears a variety of throwbacks for Friday home games. 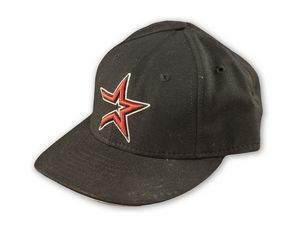 Black caps not used on road, only red.